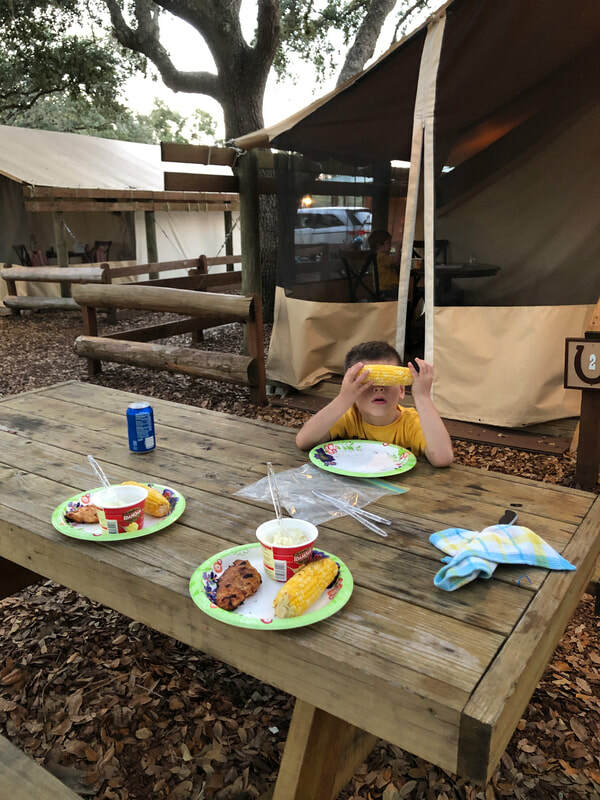 If you've been following along you probably know that my family recently stayed at Westgate River Ranch and had a fantastic time! This is going to be the everything you wanted to know about the tent and site itself version. 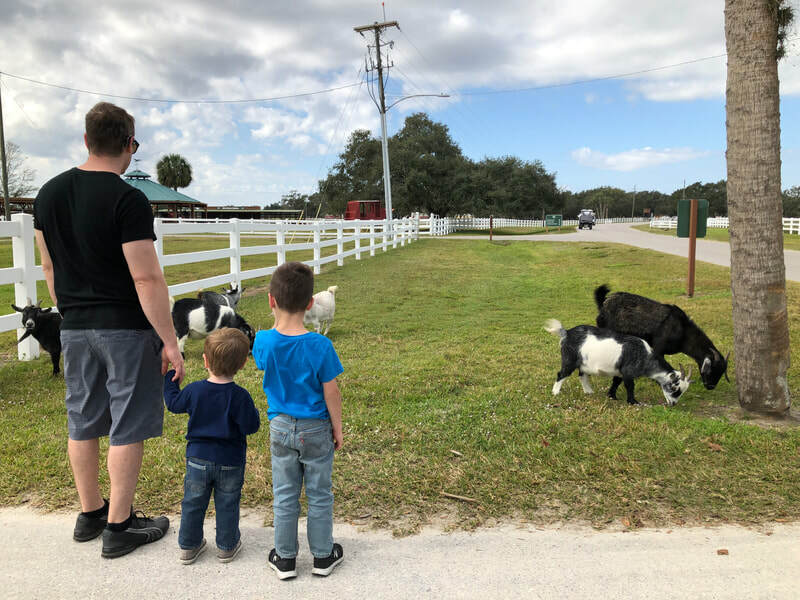 My next post will go in to our actual experience there and some suggestions for families. I decided to write this with an in depth look because I found it hard to visualize everything before the trip. I was asking many questions with each phone call I made. 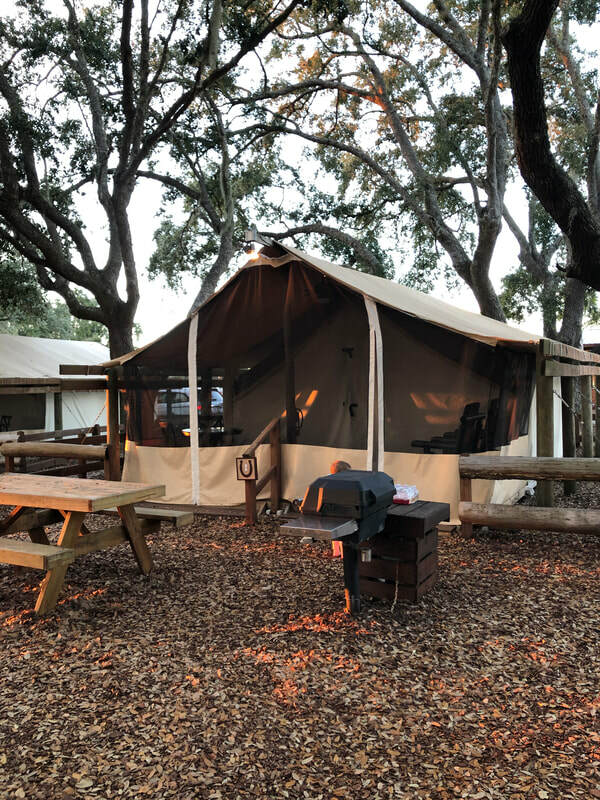 Glamping, or Glamorous Camping, is camping with added creature comforts. 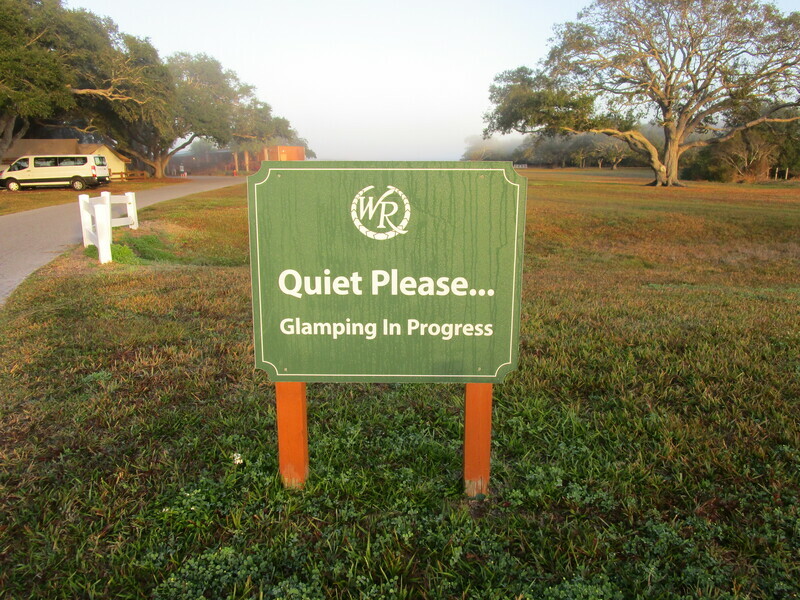 River Ranch has 20 Glamp-sites available, each one sleeps up to four people. 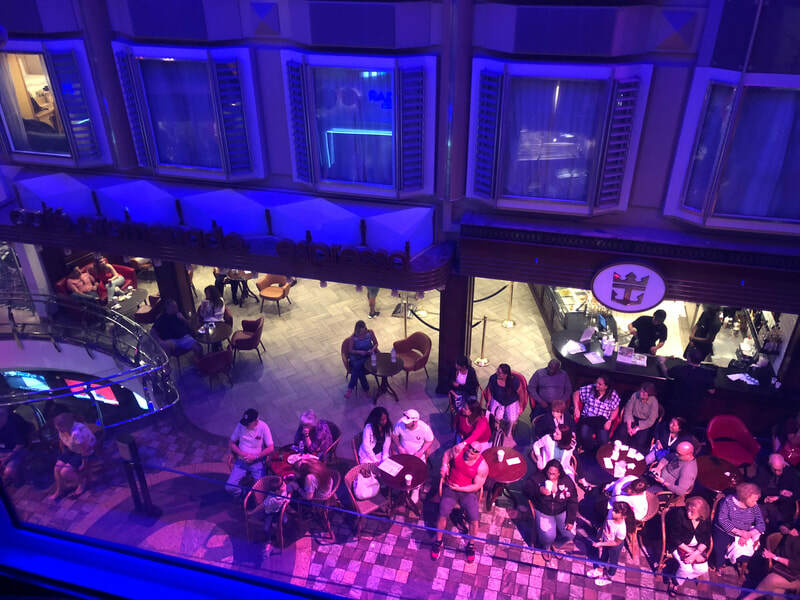 During our stay we saw everything from individual families, like us, to multi-generational groups, and even a bachelorette party! Okay, so that's not the official name for it, but that's what I am calling it. 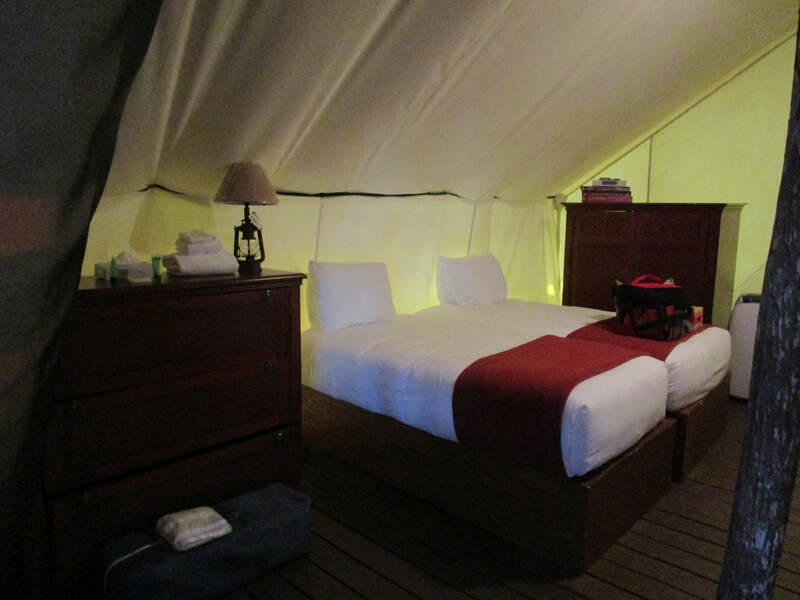 The Glamping tents are in their own section with a gated entrance. They give you a code to open the gate. No, it won't stop someone on foot, but it does prevent vehicles driving through the area. Tents 1-12 are situated in an oval shaped area. We had tent 2, so we were in the main circle. Tents 13-20 are a bit further back past the circle. There are three fire-pits total. Each is surrounded by wooden rocking chairs and benches. The Glamping Concierge, yes you get a concierge, comes by around 6:30pm and lights the fire. They provide 4 bundles of wood and will continually tend the fire until it runs out. You are more than welcome to purchase additional wood from the General Store should you want it to go on longer. On our last morning one families still had their fire going at 9am and all the kids gathered and ate s'mores for breakfast. At check-in you're given a S'mores Kit with marshmallows, chocolate, graham crackers, and roasting sticks. Across from the bath houses is a covered pavilion with 8-10 picnic tables, fans, and lights which are kept on all night. Our tent was immediately next to the pavilion. At first we were afraid that it would be too bright and loud. However, sound was not an issue for us and the lights were the perfect amount of light to allow me to walk one of my darlings to the bathroom at 2am in the rain... oh so fun! 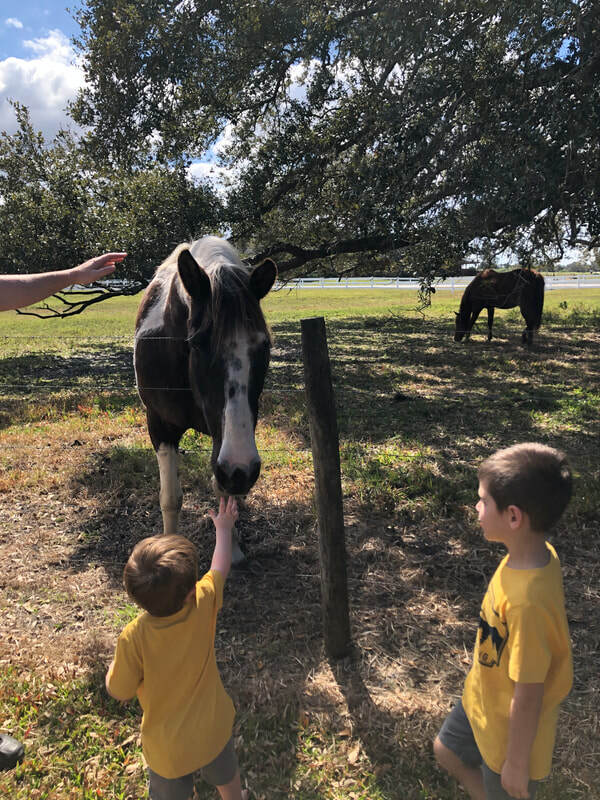 My older son, who is about to turn 6, made instant friends with all the other kids. 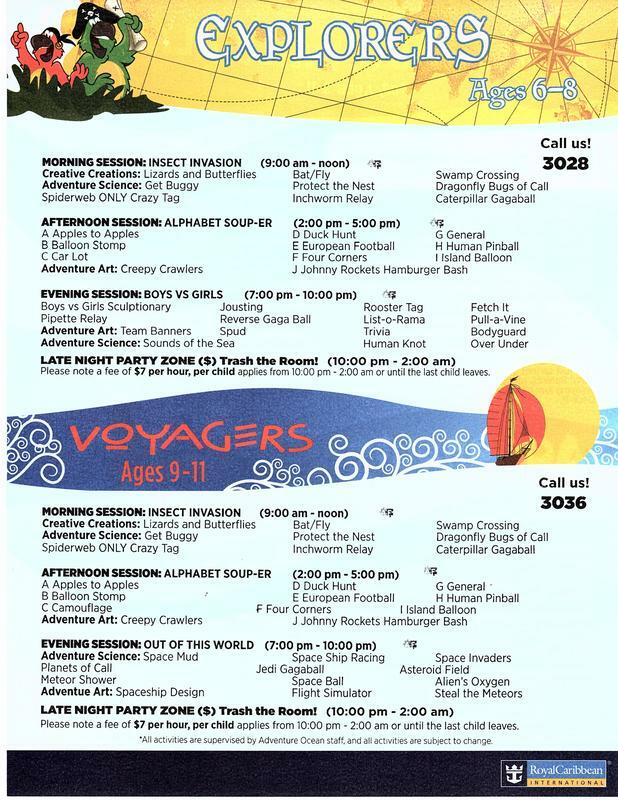 We found that a lot of families were there and the kids didn't mind being away from technology for the weekend. They were running through nature, climbing trees, and creating their own adventures. 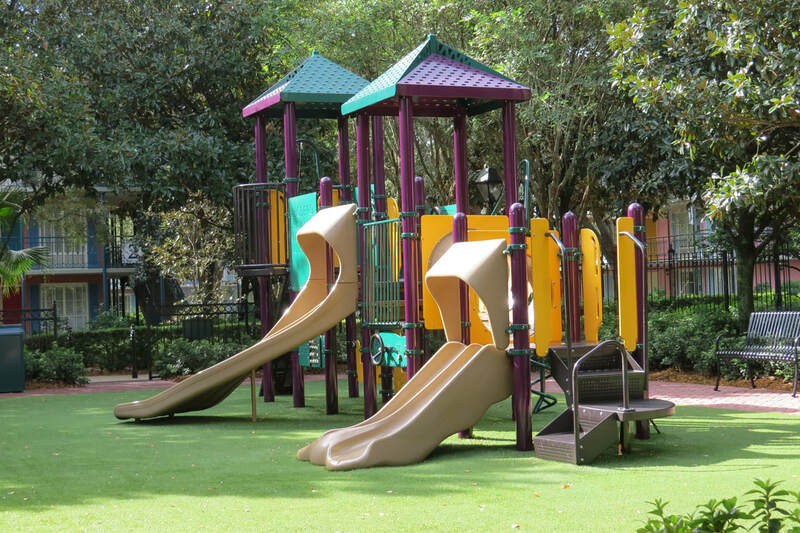 The space is conducive to allowing for everything from free play, sports, whatever you might like to do. 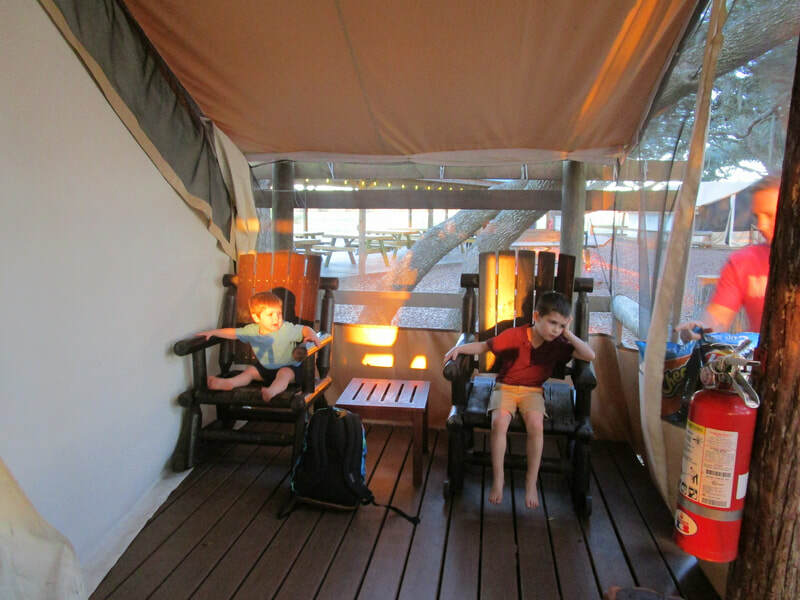 Glamping Tents 1-12 all surround an open area with a fire pit and lots of climbing trees! The tents themselves are on platforms, so no need to worry they will flood should it rain. 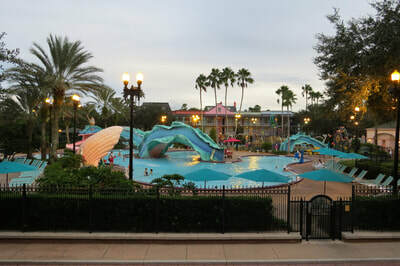 it rained one afternoon and night when we were there and we stayed pleasantly dry the whole time! 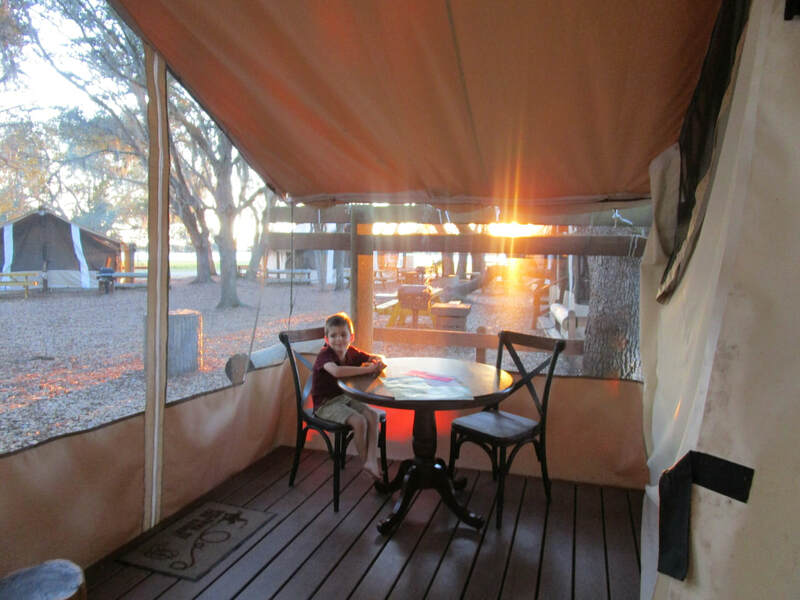 When you first enter the tent you're in a screened in room we'll call the "patio." In there are two wooden rocking chairs, a small table with two chairs, a fire extinguisher, paddle fan, and two wooden stools. We scooted the wooden stools by the table when we wanted to sit together. The front screens open in two places. You can see the seams in the very first photo at the top. They zip completely closed. I cannot comment on the ability to keep out mosquitos and other bugs. We stayed in February when those little critters don't usually hang around! 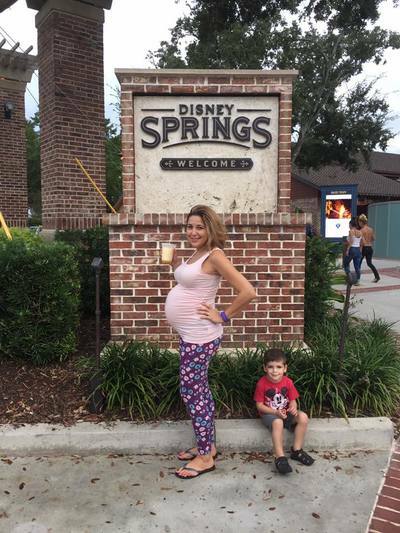 It was rather cool at night for this Florida family. It dipped in to the upper 50s, but we never needed to run the heater. We turned off the air when it got chilly. The tent stayed fairly pleasant and the beds have nice duvet comforters that did an excellent job of keeping me warm through the night. I tend to get chilly rather easily. 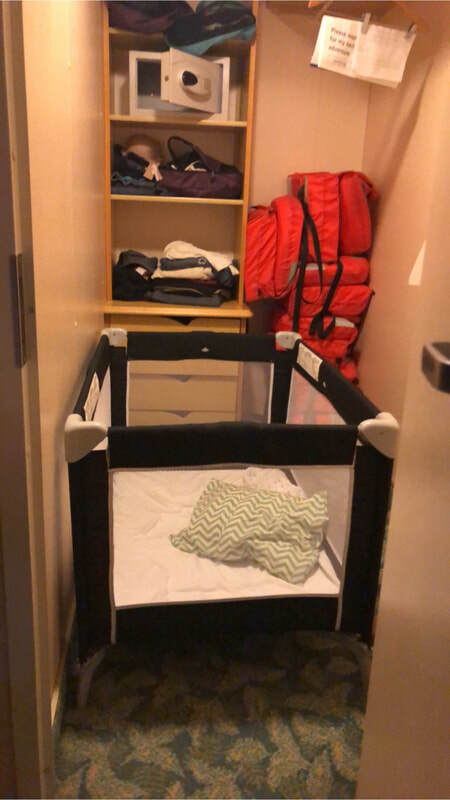 If you are traveling with a small child who needs a crib they do provide pack n plays upon request. 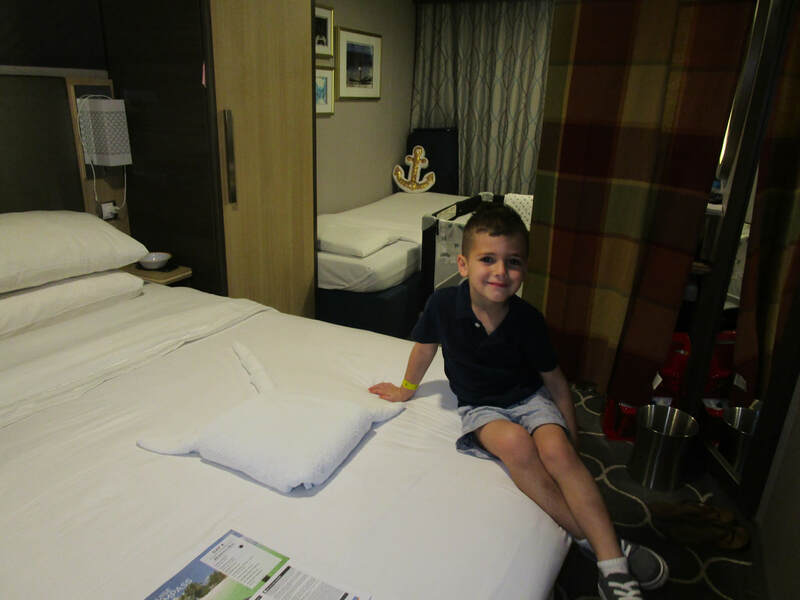 There was one waiting for us in the tent when we arrived, although my little one ended up sleeping in the bed with inflatable bumpers we purchased beforehand. ​*Click on the images below to view larger. 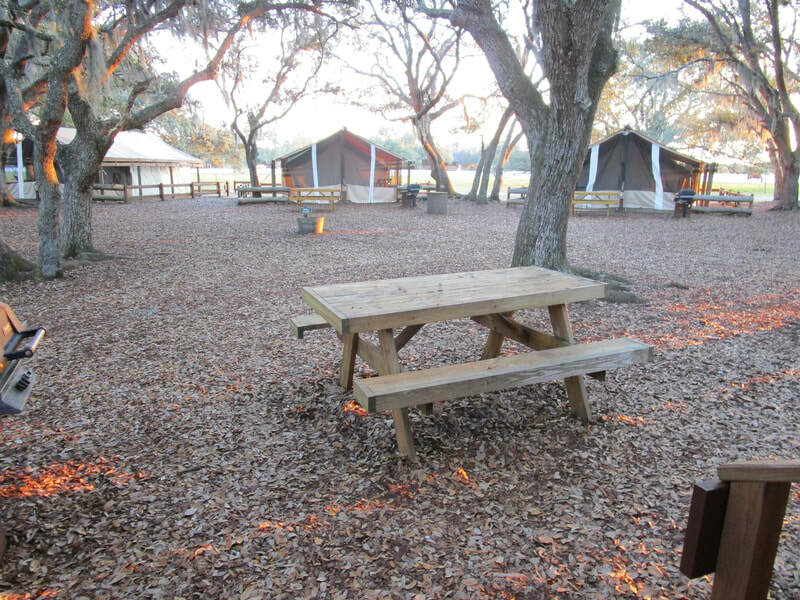 Stepping outside, each tent site has it's own picnic table and gas grill. 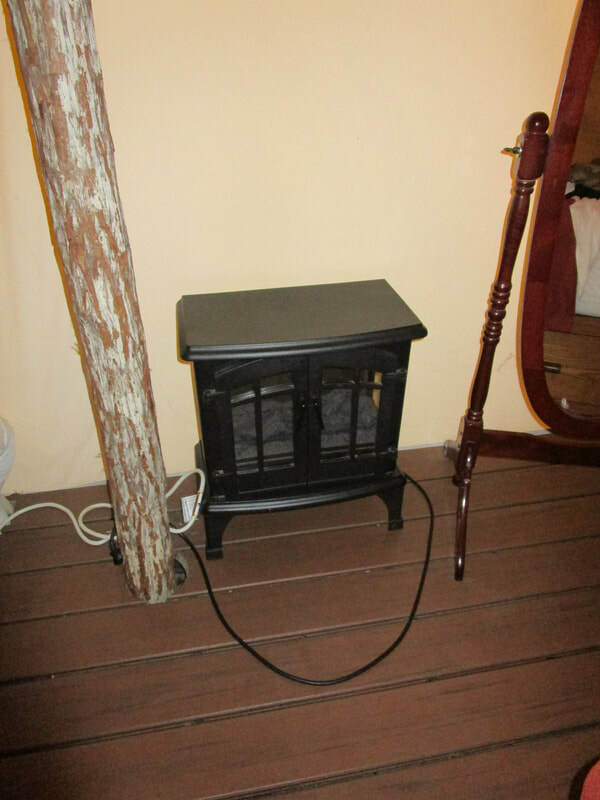 You do not need to supply the gas, that's included and located under the little wooden table next to each grill! In between each tent site is a covered garbage can. There were plenty of them and the bags were changed often. I never saw any of them get close to being full. 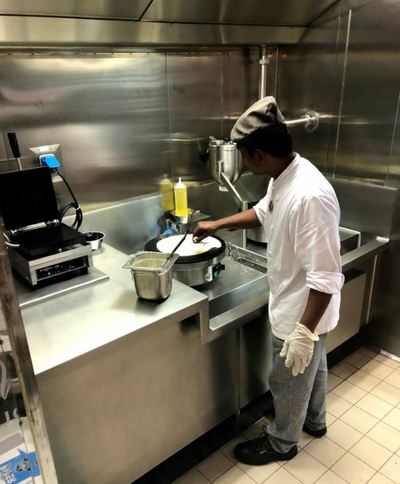 The staff was meticulous about keeping everything clean and well kept on property. Spread throughout the Glamping area there were multiple water stations with potable water safe for drinking and cooking. 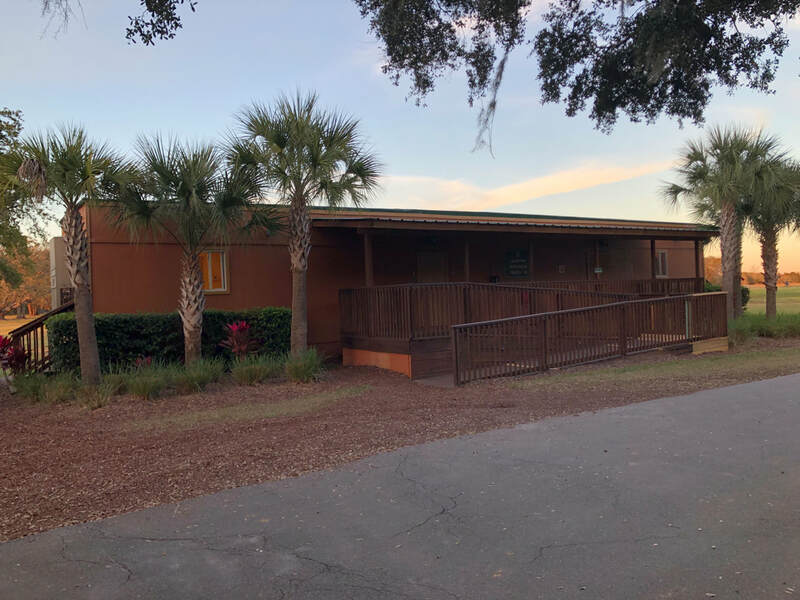 There are two buildings off to the side of the Glamping area with individual bathrooms inside. 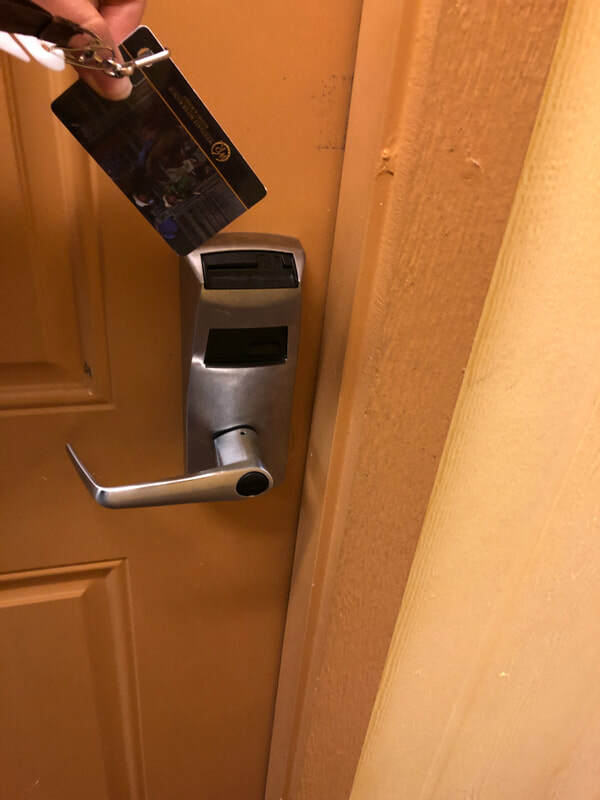 You're given a key, hotel room style, that allows you access to your own numbered door that corresponds with your tent number. 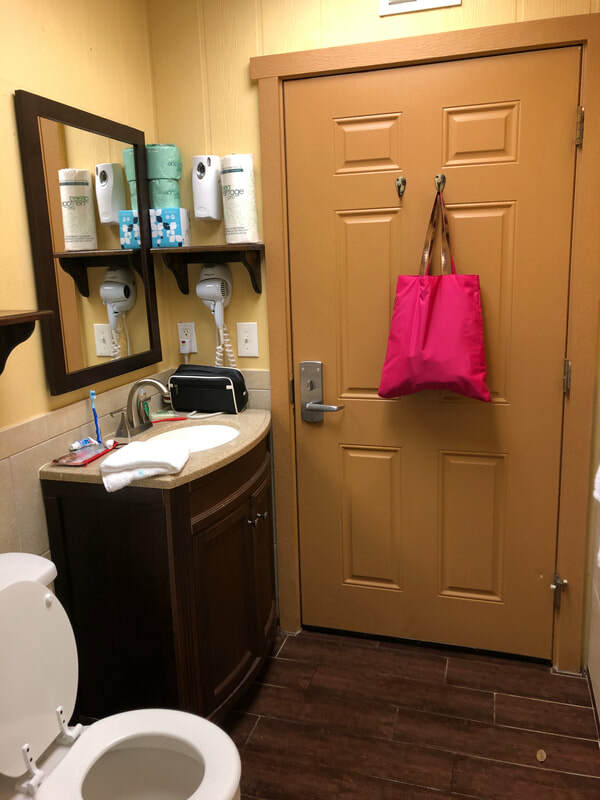 This makes it easy to leave your toiletries in there without having to carry them back and forth each time you make a trip over. 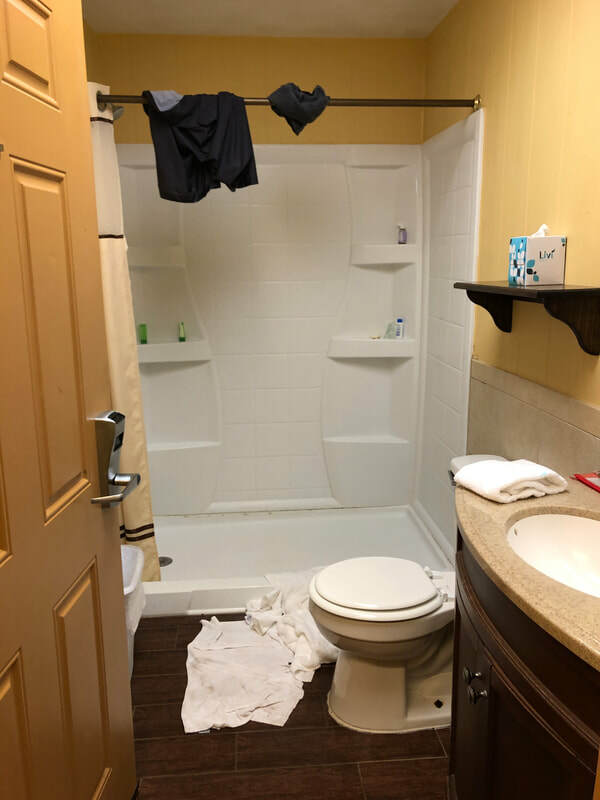 Each room has a shower, sink, toilet, paper towels, shampoo, soap, and toilet paper. Every Glamping site comes with access to the Glamping Concierge. They come by frequently throughout the day to check if anyone needs their assistance. 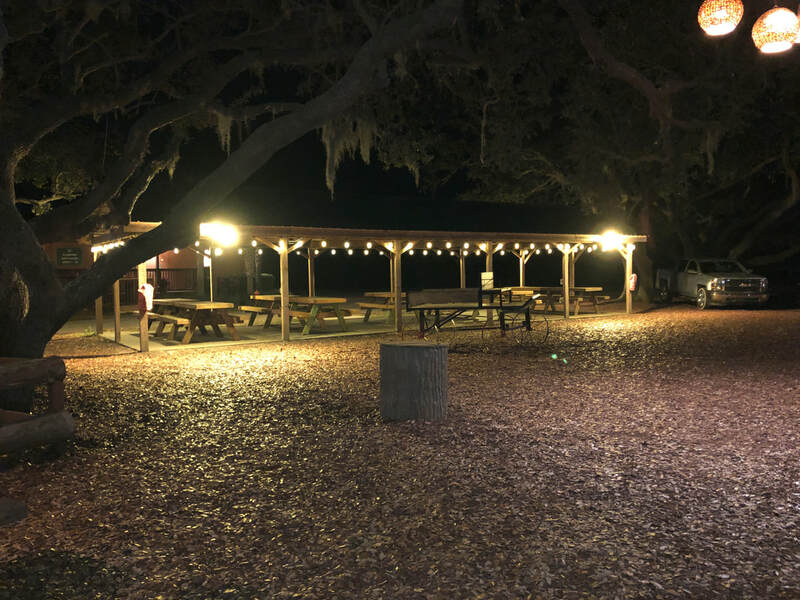 They light the nightly campfire and come back to tend it for a few hours, they can make reservations for you for various events on property, and will happily bring you almost anything you may have forgotten. Additionally, they come by each morning with a light breakfast! Hot coffee in a carafe, warm cinnamon buns, and fruit. Delivery time did vary, it came between 8am-9:45am throughout our stay. It seemed to take longer when they had more tents to serve. Our first night there we were one of two tents there. The second and third night we were one of twenty! Coming up next is a more personal look at what we did during our stay, more opinions, and what we want to do when we come back! 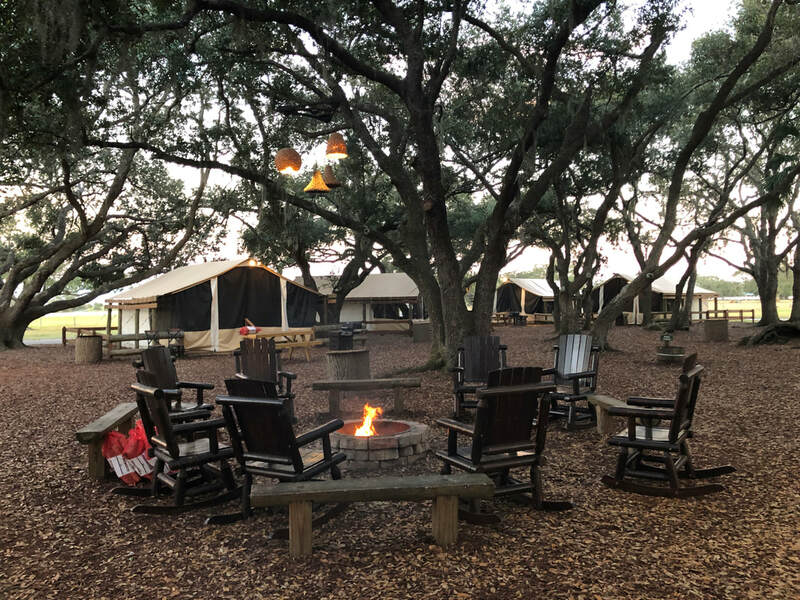 If you are interested in booking a stay at Westgate River Ranch, reach out to me and I would be happy to go over more specific details about all the option and get pricing for you. 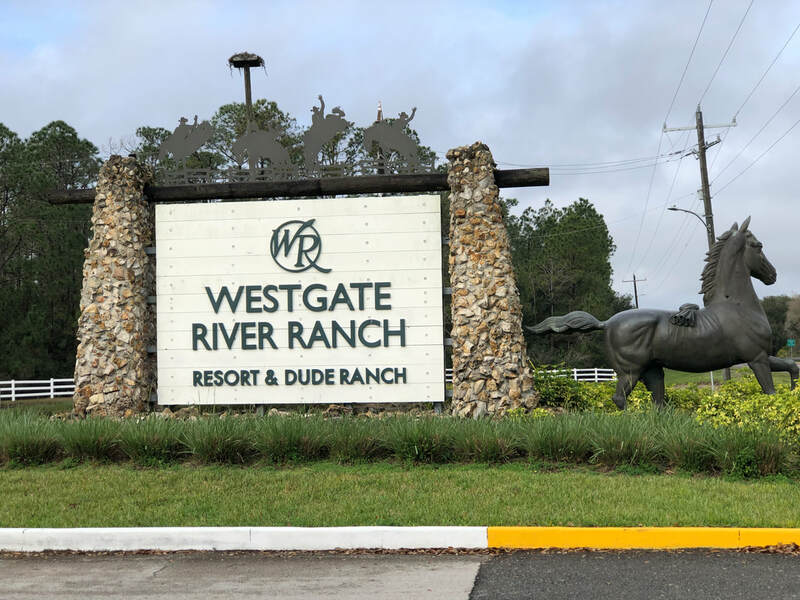 Westgate River Ranch is a Dude Ranch located about an hour south of Orlando, Florida and two hours from where I live in south Florida. 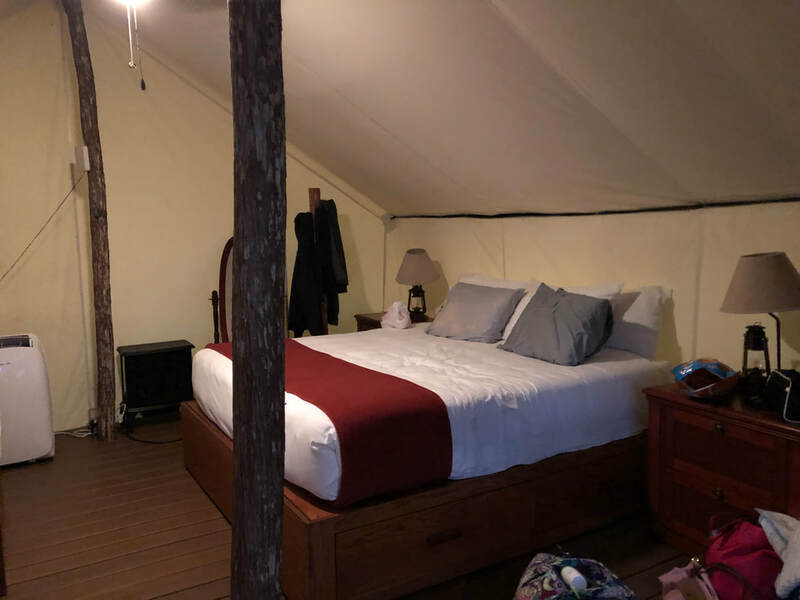 My family spent four days and three nights Glamping on property and we still didn't do everything they had to offer. Don't get me wrong, it's not crazy like Disney World. 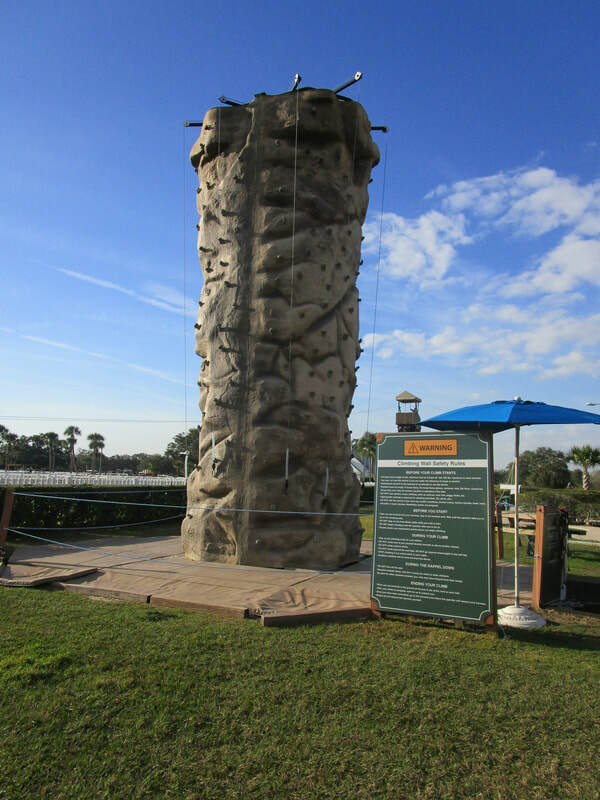 The property is over 1700 acres, so all the activities are well spread out. 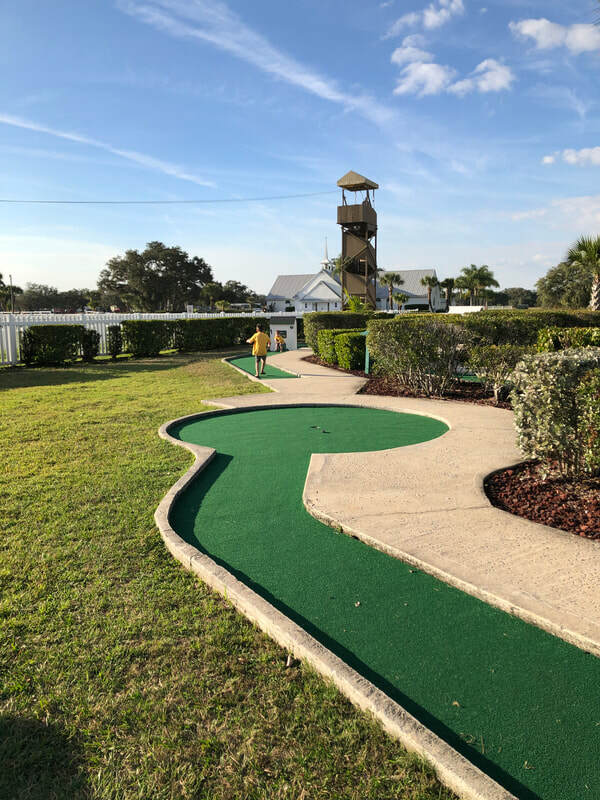 A golf cart rental, available on property, is a great idea to get around and enjoy the great outdoors. 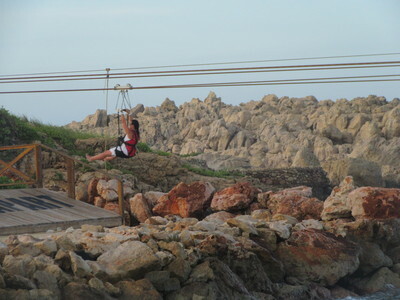 We enjoyed it so much that I am ready to book another trip! 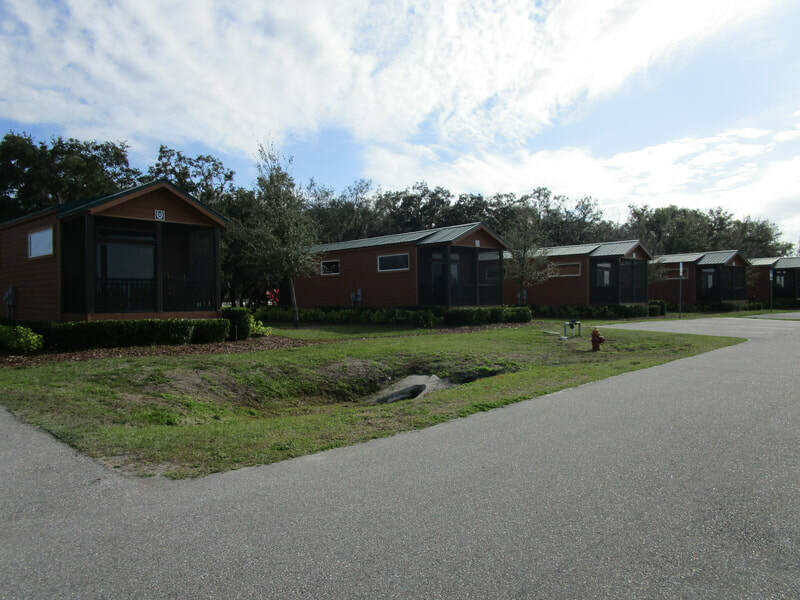 River Ranch offers a wide range of accommodations, from very basic tent lots up to cabins! 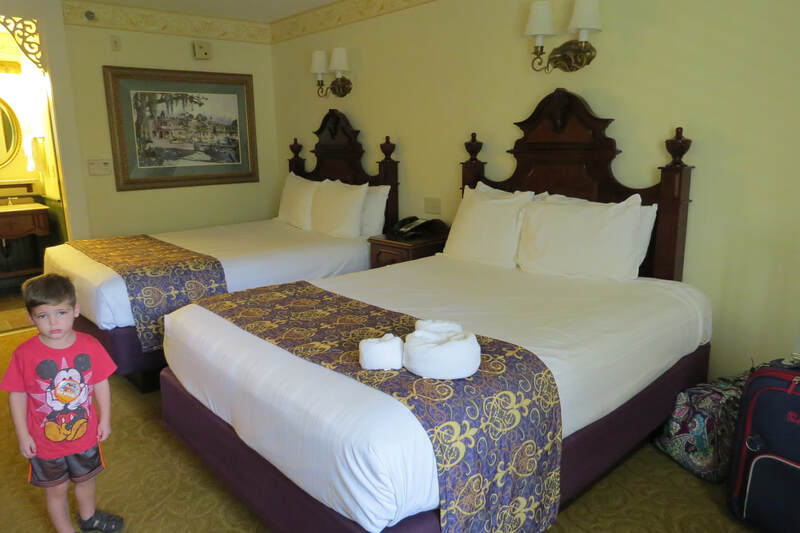 There is something for everyone to stay comfortably. Tent Camping with access to a bathhouse with showers. 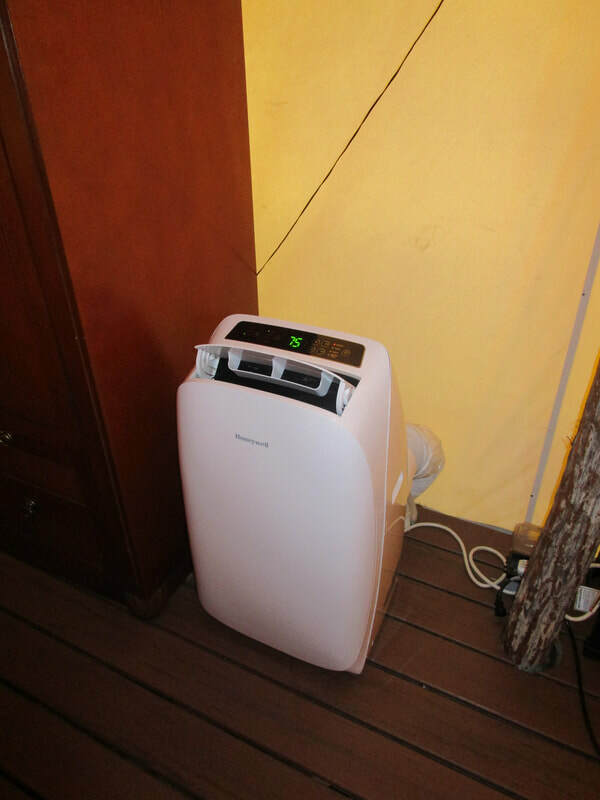 RV Sites (20, 30, and 50 amp access) with bathouse and showers. 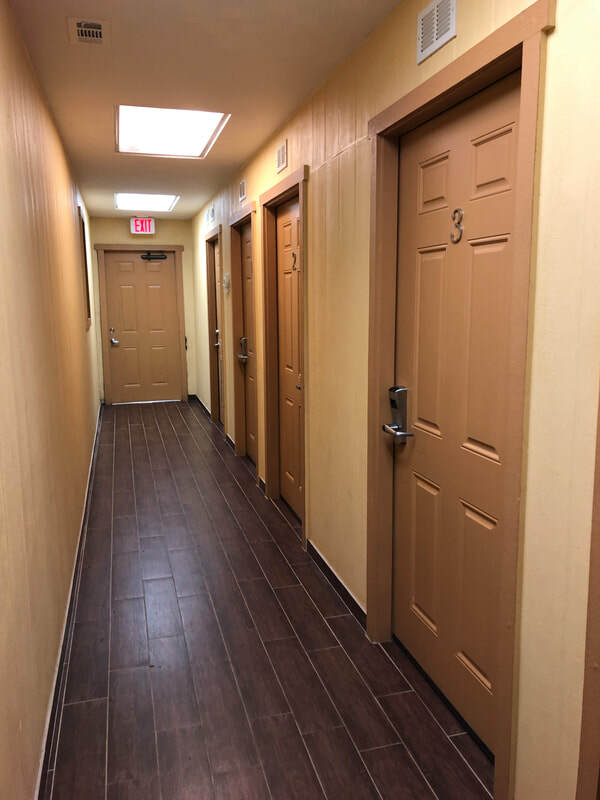 Cabins with 1 or 2 bedrooms. Cottages with 1 or 2 bedrooms. 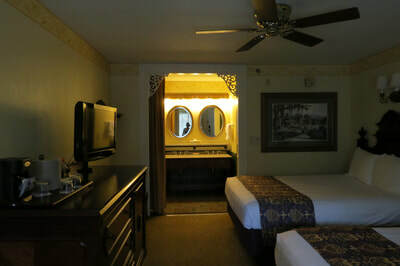 Lodge Rooms- Deluxe Suite, Suite, and Standard Room. Coming Soon! Conestoga Wagons. I don't have a lot of information on these yet, but they looked intriguing when I drove by the sign. River Ranch currently has one restaurant, the Smokehouse Grill. They are open 7-days a week. 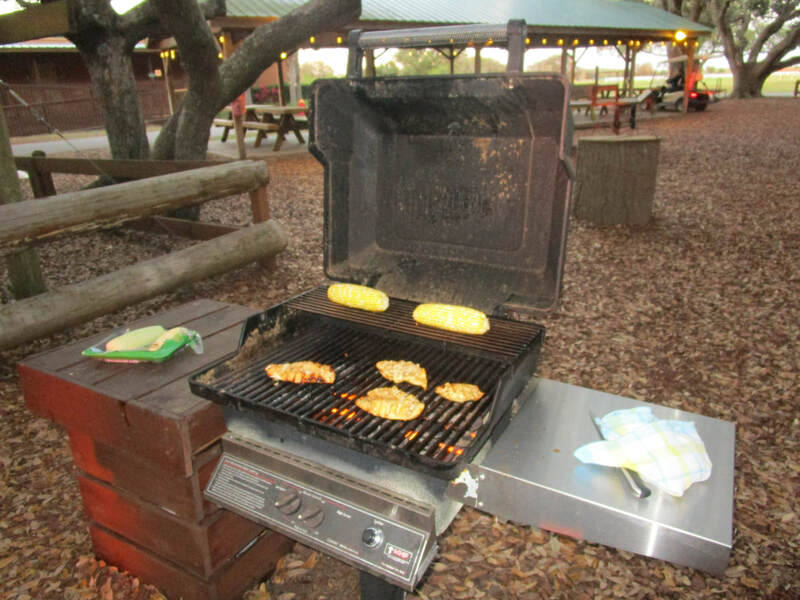 They serve your typical BBQ and grill style food. 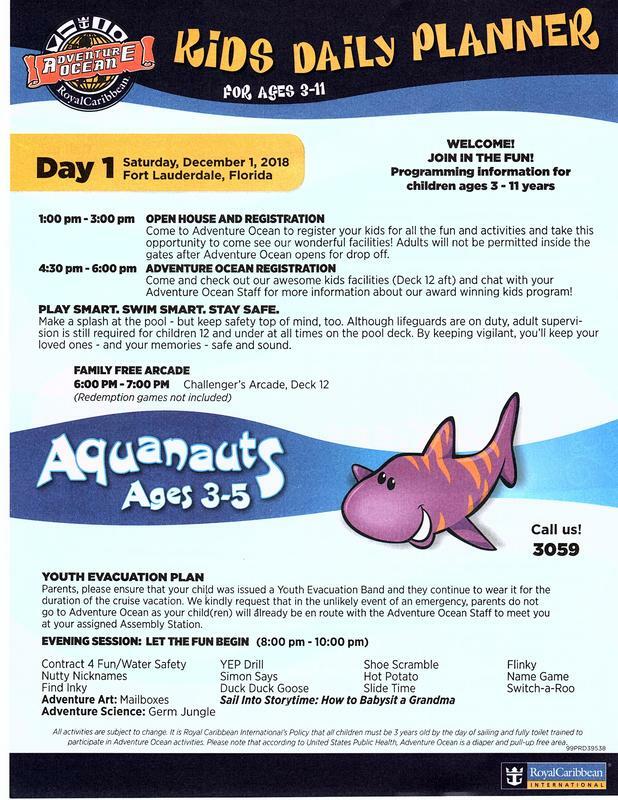 They also offer a buffet option for $22 per adult and $12 per child. 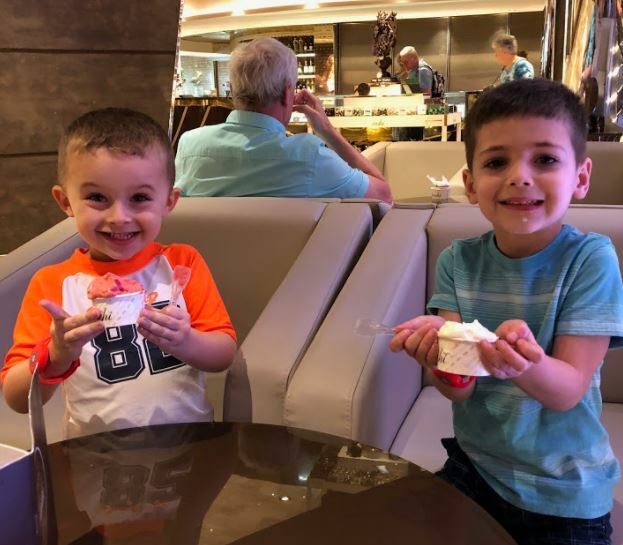 My two year old son was able to eat from the buffet for free. It included salad items, corn, bbq beans, baked mac n cheese, cornbread, chicken, ribs, ham and bean soup, and apple cobbler for dessert. It was a decent meal. We enjoy bbq, so it was a good option for us. 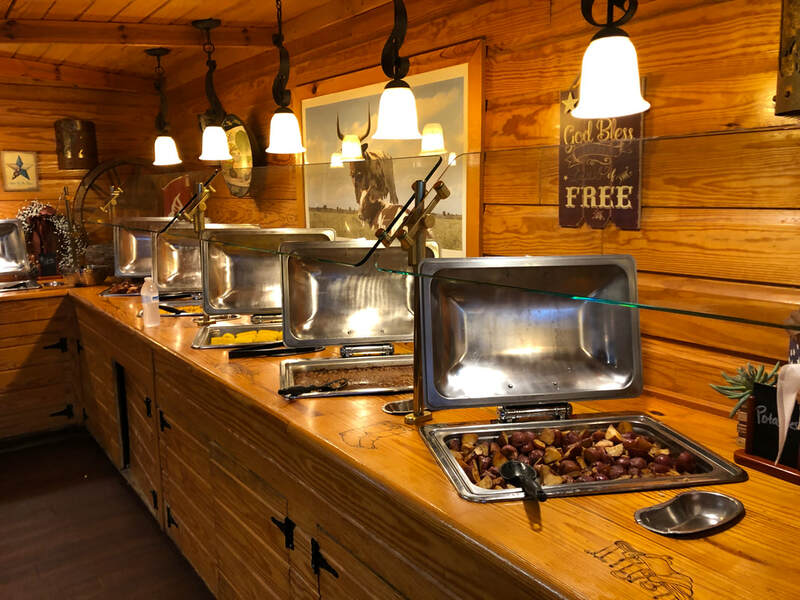 Hayride Dinner- This is a popular option on Saturday night only. 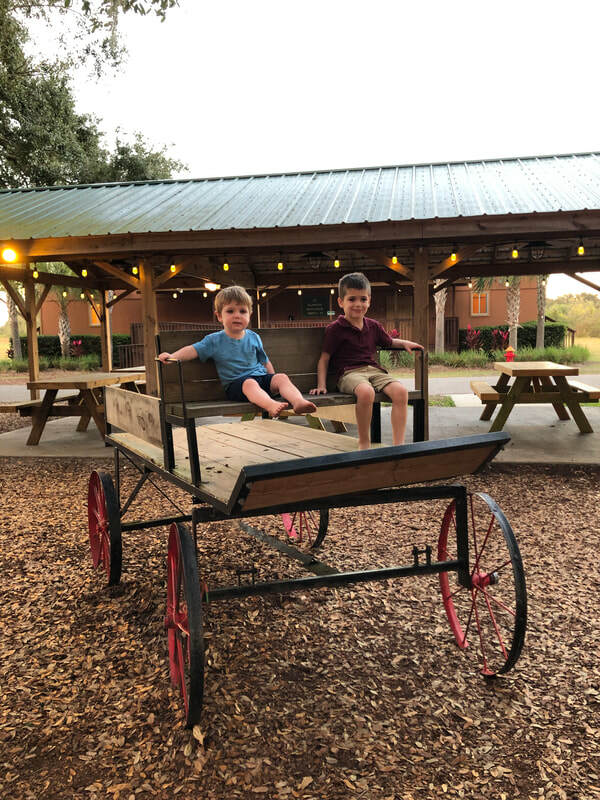 The hayride takes guests around the property on a tractor pulled hay wagon and then back to the East Corral for a buffet-style dinner. The General Store offered pizza, sandwiches, wraps, salads, ice cream and more. 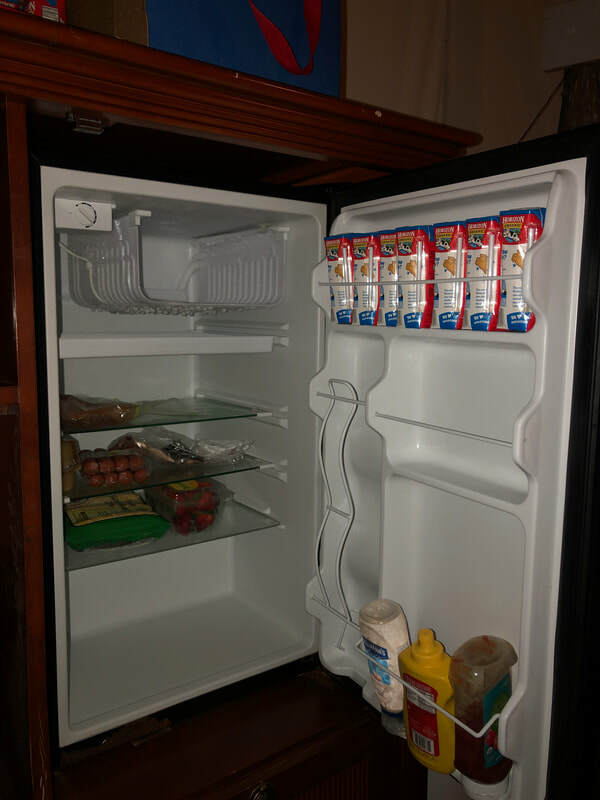 Plus they had items on the shelves and in the freezer case if you forgot to bring the basics like condiments, bread, snacks, etc. Be aware that there is a lot of candy and toys at the General Store too, so if you bring in your kids they may get excited like mine did and want to leave with everything we didn't come for! During our stay we brought our own food and cooked for ourselves at the Glampsite. 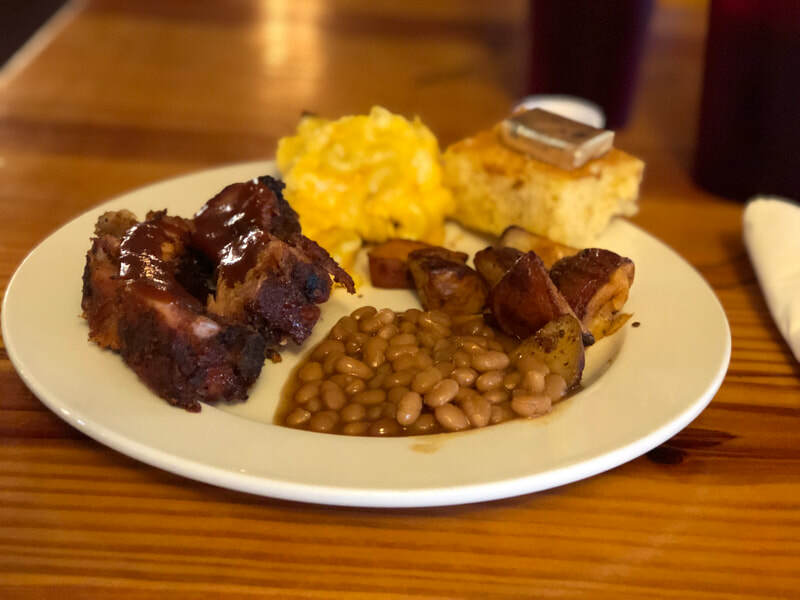 The only exception to that was Saturday afternoon, when we ate at the Smokehouse Grill. We saw most families cooking their own meals at the Glampsite as well. 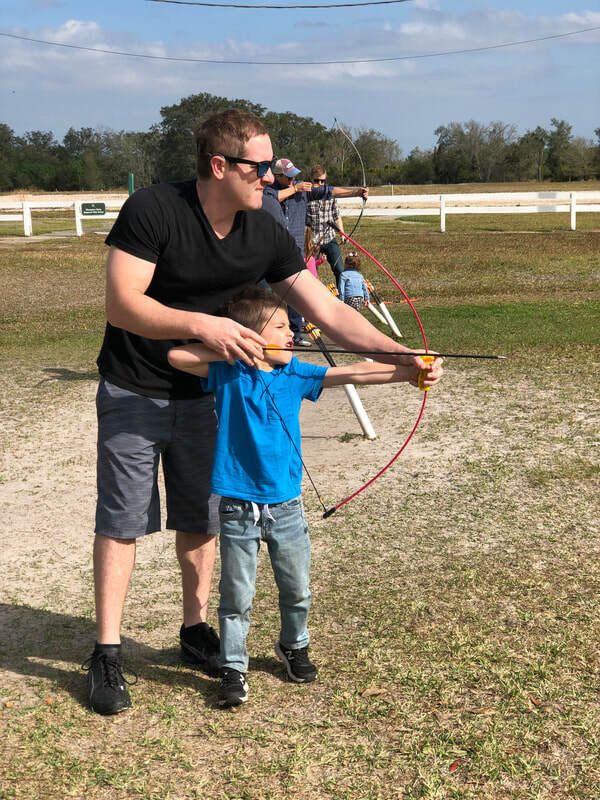 River Ranch offers and endless array of activities to help you connect with the outdoors. 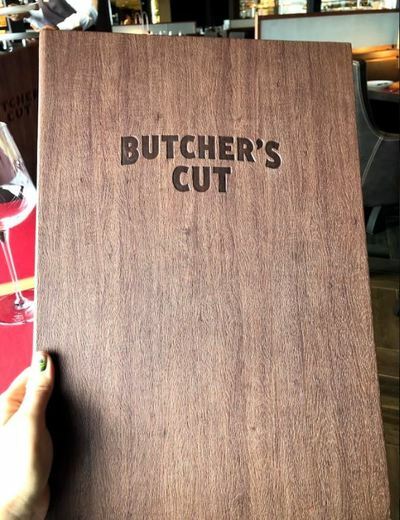 Yes, they do cost extra. that's something we built in to the budget for this trip. 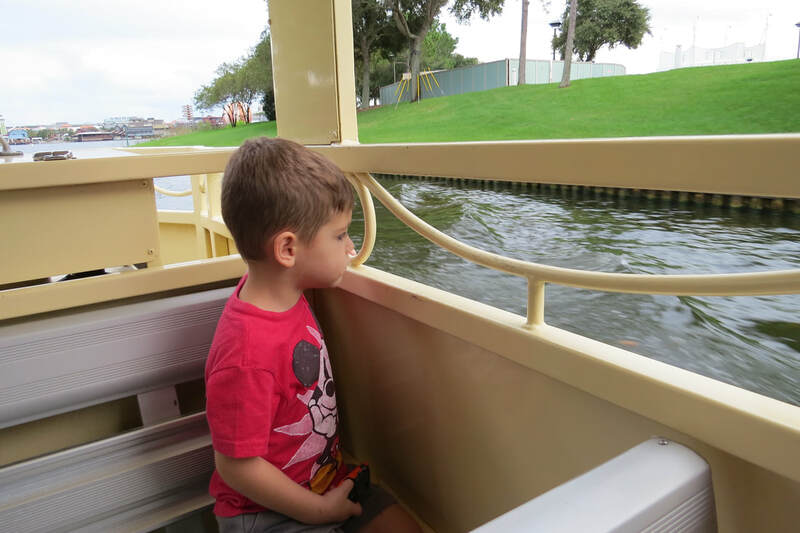 Airboat and Swamp Buggy rides. and of course the Saturday Night Rodeo. An actual rodeo! 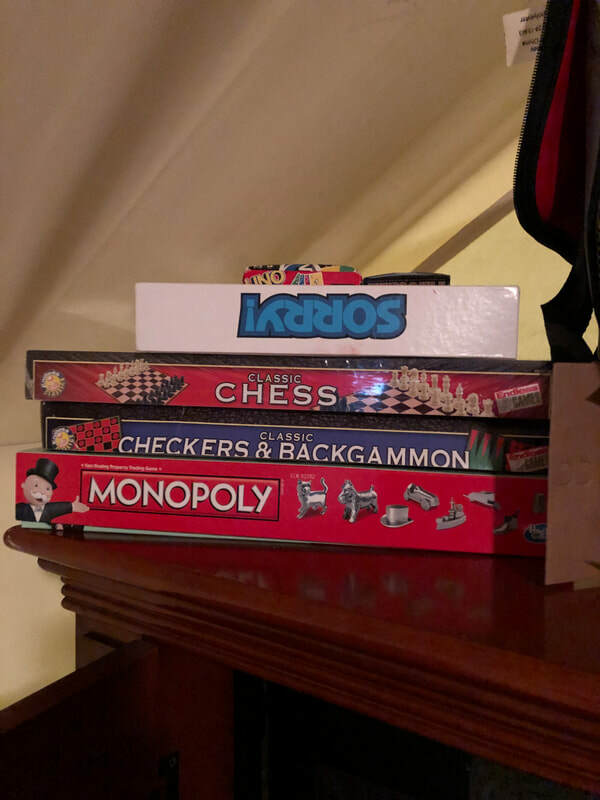 The items in italics are the activities my family took part in during our stay. My kids didn't have a single complaint except for when it was time to leave, they wanted to stay! 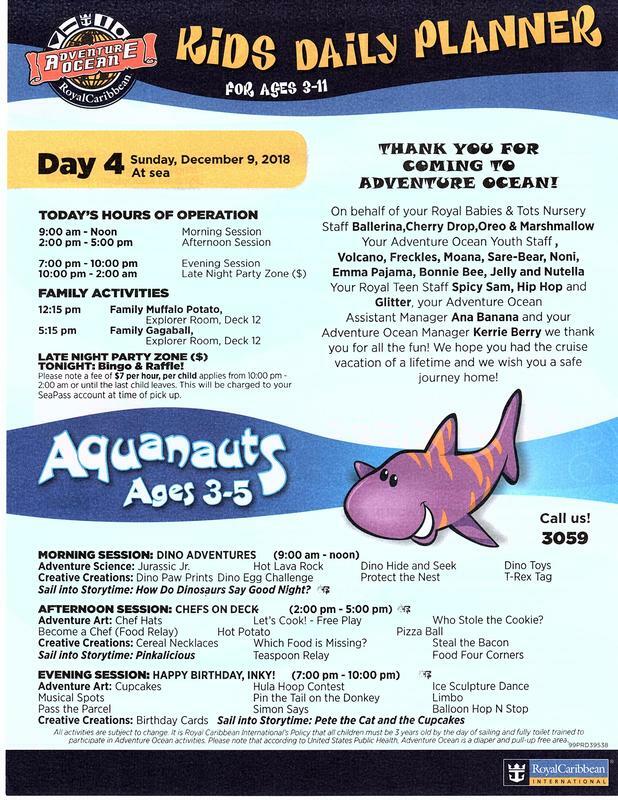 Adventure Park pricing as of February 2019. 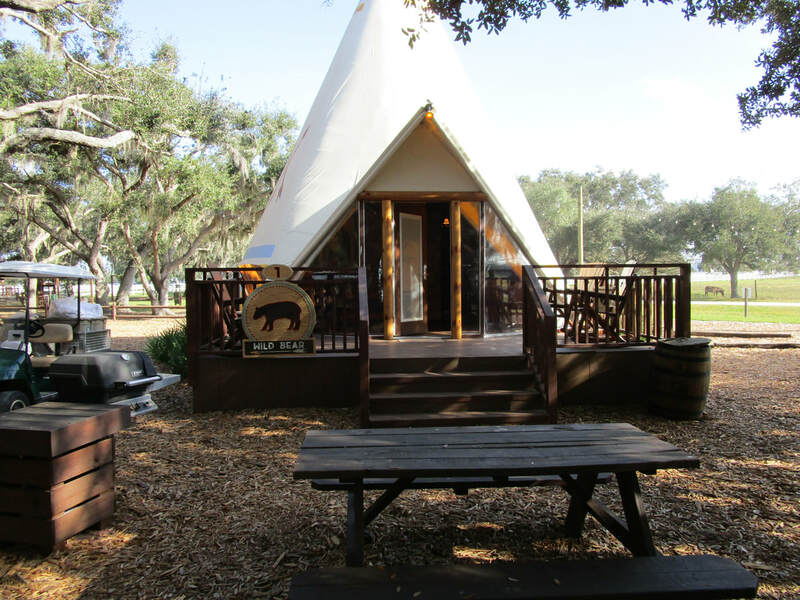 ​**Luxe Teepee guests are treated to an all-inclusive activity experience. All of the extra charge activities on property are included for those guests except rental of pontoon boats. 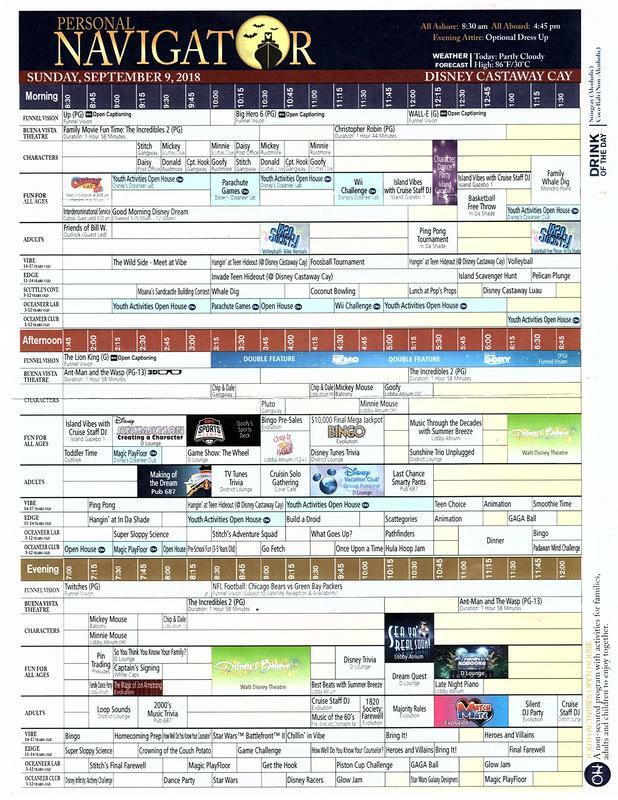 So everything seen on the chart above is included for those staying in Takoda Village (Luxe Teepees). 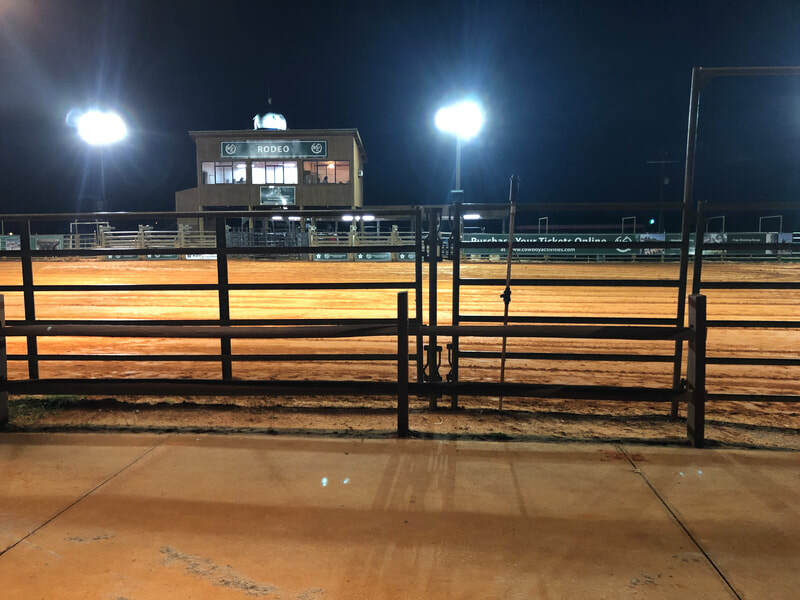 Every Saturday night, 52 weeks a year, River Ranch hosts its Rodeo. It's authentic, that's for sure! I went to the one at the Fort Worth Stock Yards years ago and it was comparable but this was on a smaller scale, obviously. 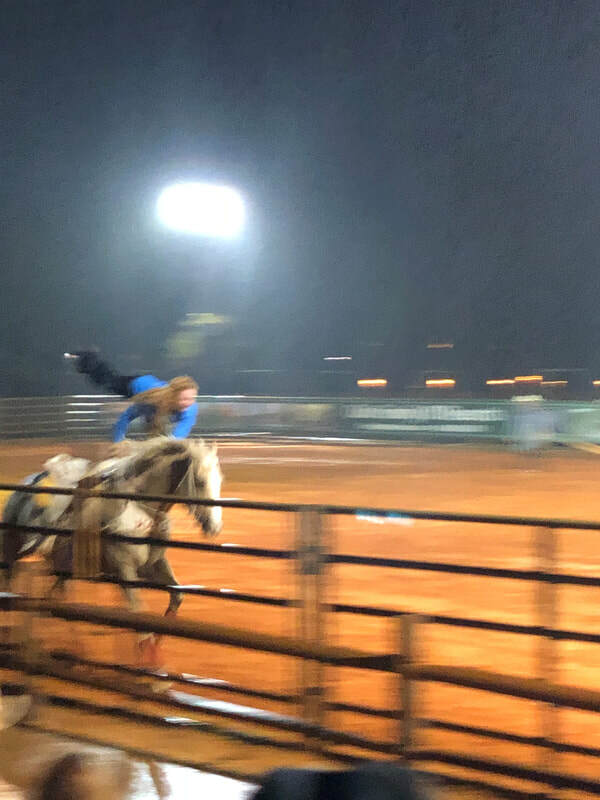 They had all the typical events, barrel racing, bull riding, stunt/trick riding and more. My older son was most excited for the Cattle Scramble. 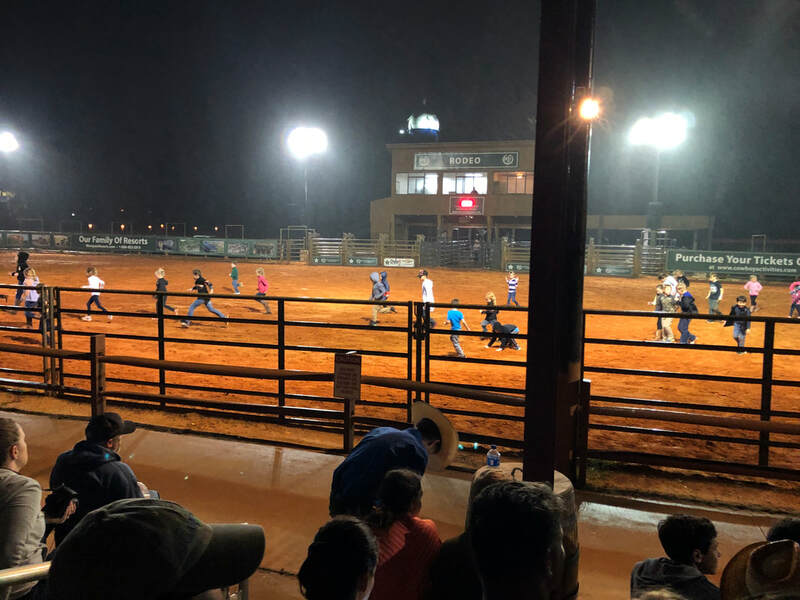 You can sign the kids up for free (with a paid rodeo entry of course). 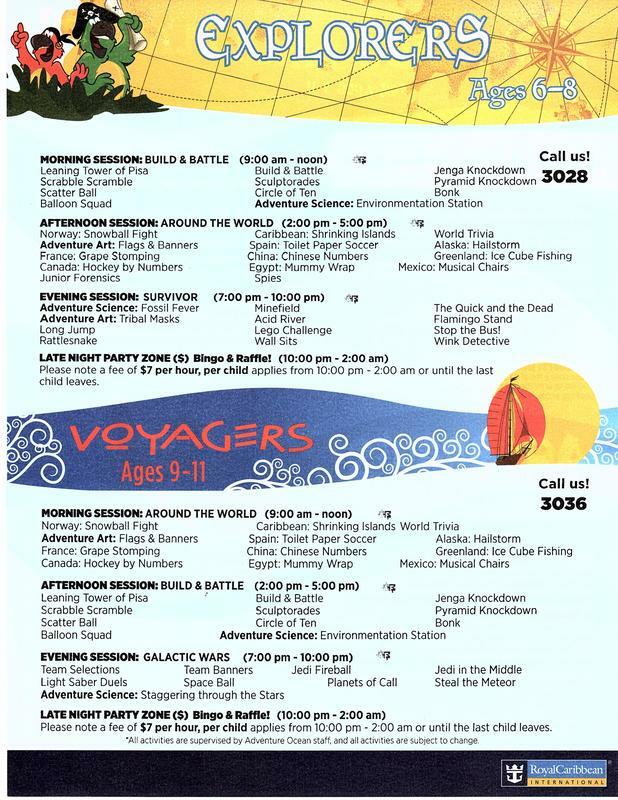 They had a group for 4-8 year olds and a second group for 9-12 year olds. They call all the kids out to the field and then release a few calfs with ribbons tied to them. The kids have to grab a ribbon off the calf's tail. The young lady sitting in front of us won in the 9-12 group and she earned herself a free Swamp Buggy ride. 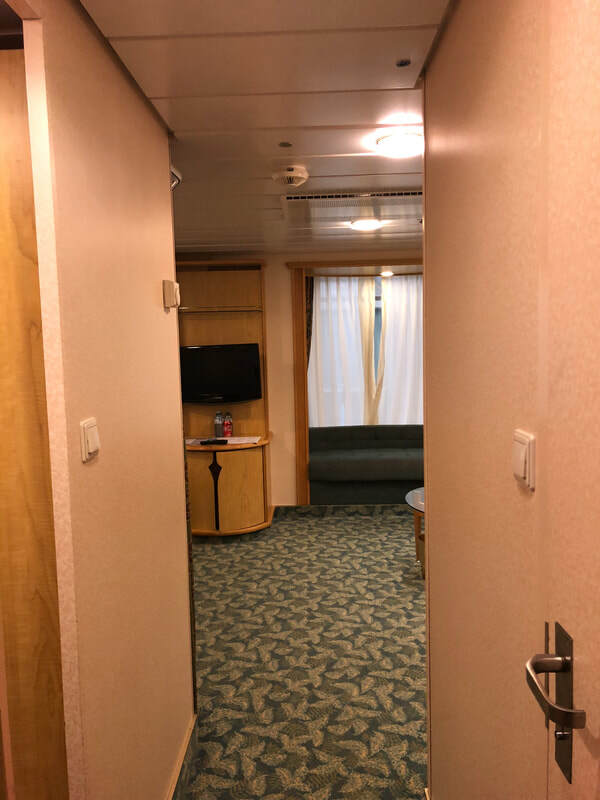 This was our most unique room experience to date! I can officially say we are now spoiled and will have a hard time staying in a regular sized room in the future. 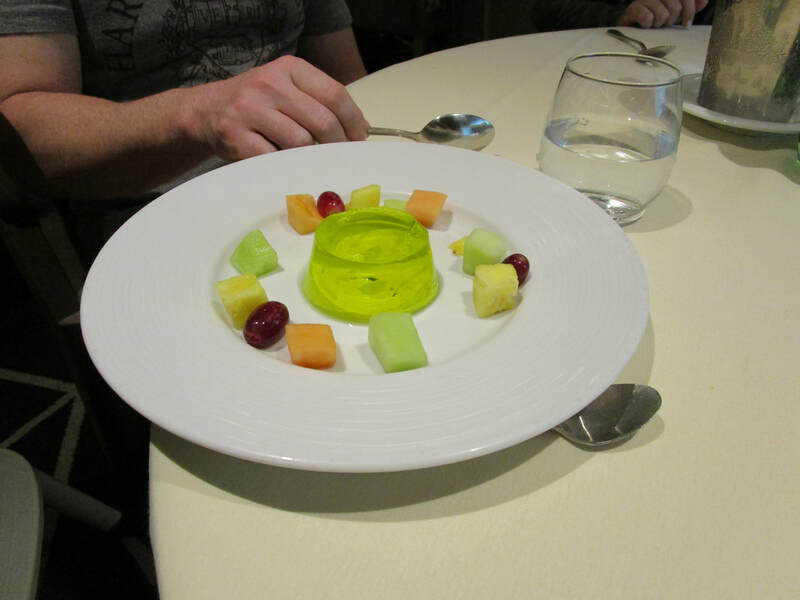 The best part was, it's not a suite, so you don't have to pay suite prices! ;) Sure, suite perks would be nice, but this was a great alternative. 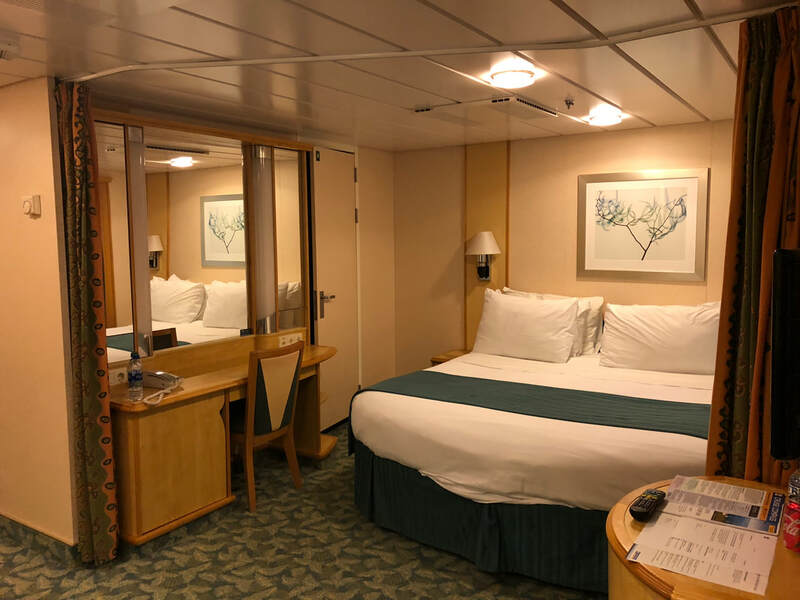 A Spacious Promenade View room on the Independence of the Seas is the same amount of space as two promenade rooms and sleeps up to six people comfortably. ​The room was located on deck 7. It was a reasonable distance from the aft elevators & stairs. To the right of the room was a crew stairwell. To the left, another Promenade View room. We were across from the Promenade Cafe. Just off to the right was the entertainer's stage. We were able to watch some of the parades and bands with a great view! One night they even waved right to us. A large walk-in-closet. It was so large that we were able to put the pack n play in there for our almost-two year old son to sleep. We also used the drawers and shelves for our clothes. Bunk beds in their own enclave. 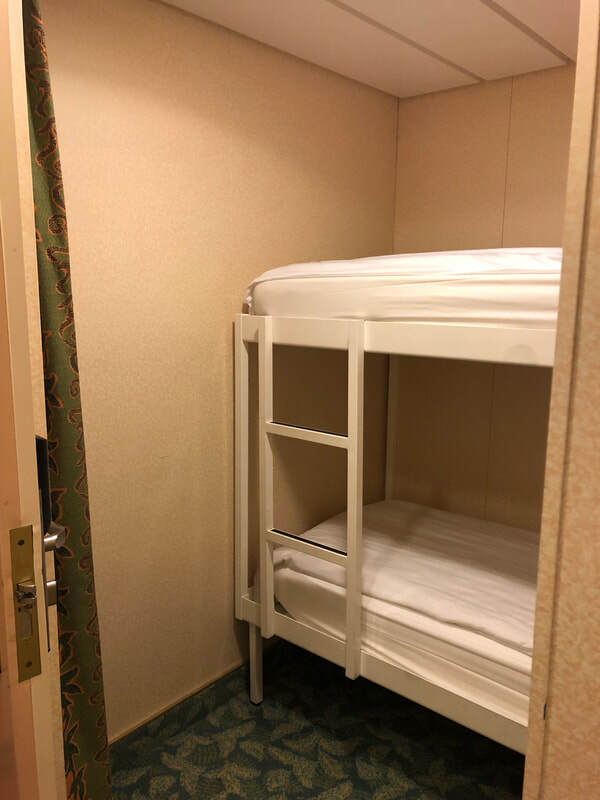 The bunk space had a curtain for privacy, a cabinet for clothing storage, and a small side-table. This small area was located just to the left when you walk in the door. There is enough space to stand in there and move about a little. I frequently used it as a changing area when the family had our windows wide open. Three sofa spaces. 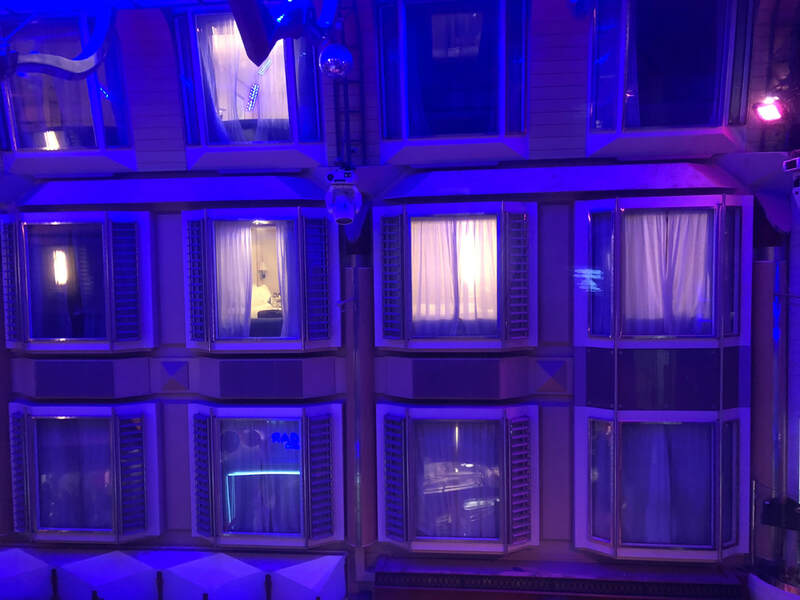 Two of which were in the bow windows overlooking the promenade, and the third was across from the bed on the opposite wall. This made for a great room to hang out during kid's naps. Storage space galore! 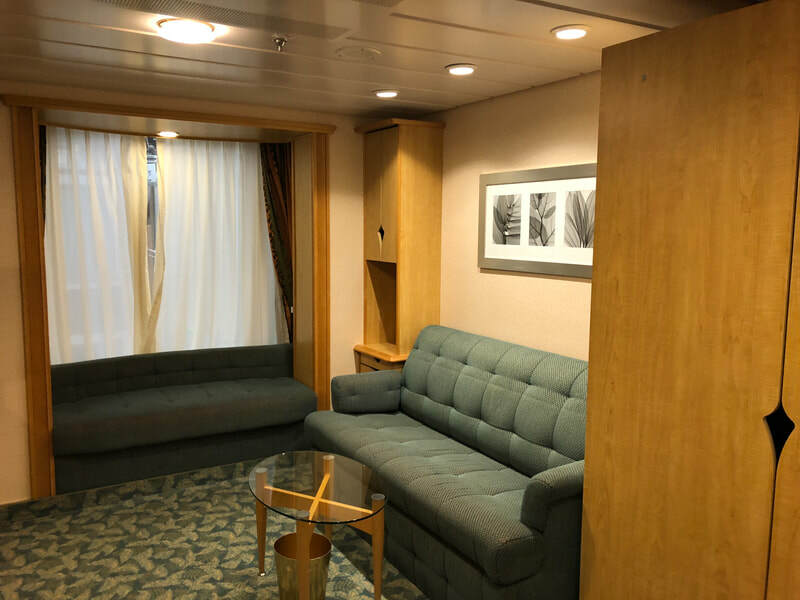 In addition to the walk in closet there was the small cabinet in the bunk room, a large cabinet next to the third sofa, and small cabinet/drawer set between the third sofa and one of the window-seat sofas. A bed table on either side of the main bed had a small drawer and open storage space below. Plus some storage under the desk and on either side of the mirror. 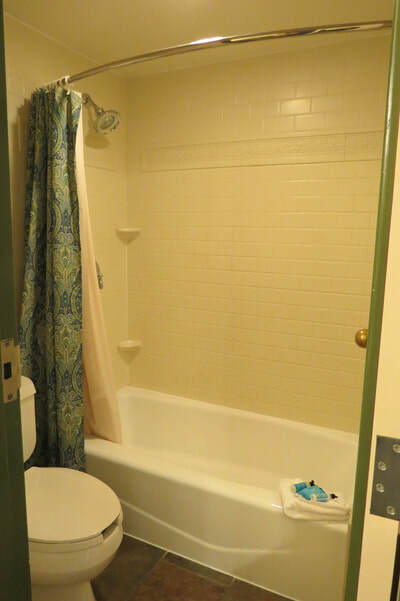 Full-sized bathtub and shower. The bathroom was also a tad bit larger than a standard cruise ship bathroom. Both my kids fit in the tub at the same time with plenty of extra room. ​Large curtain that divides the bed area from the living area. 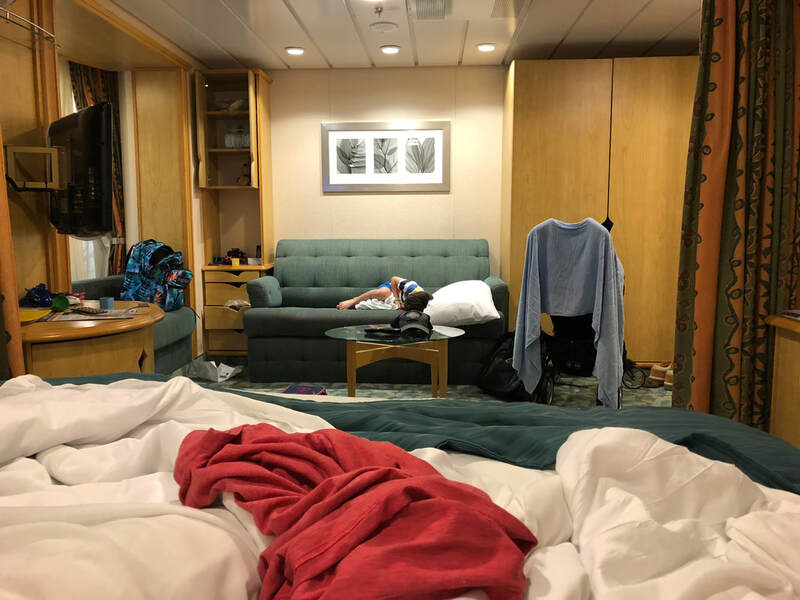 We were able to close off a section of the room in the day to allow for one person to sleep and another to watch TV (it swiveled to face either the bed or third sofa). *There was a single drawback in our opinion. We could hear the bass from the music on the Promenade throughout the evening. 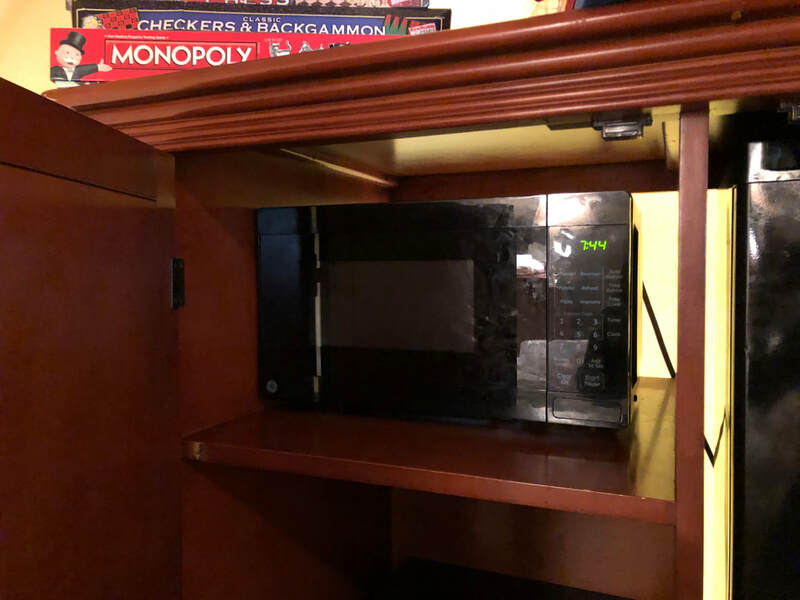 The toddler slept in the closet, so the noise didn't bother him. My five year old was so tired from having fun that he didn't flinch in the bunk room. My husband doesn't hear well, and so I was the only one who really noticed it. I was still able to sleep comfortably. However if you're a light sleeper it could be a problem for you. To view the images larger and with captions, select an image and then scroll through. 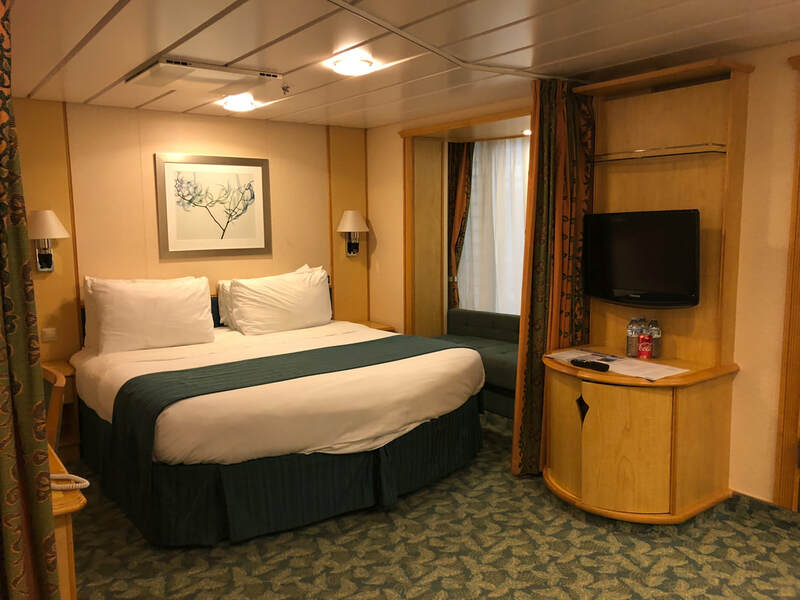 On our next cruise we will review and share our experience with a Central Park View room on the Symphony of the Seas. Stay tuned for that one coming at you early summer 2019. We sailed on the Independence of the Seas from December 6-10th, 2018. 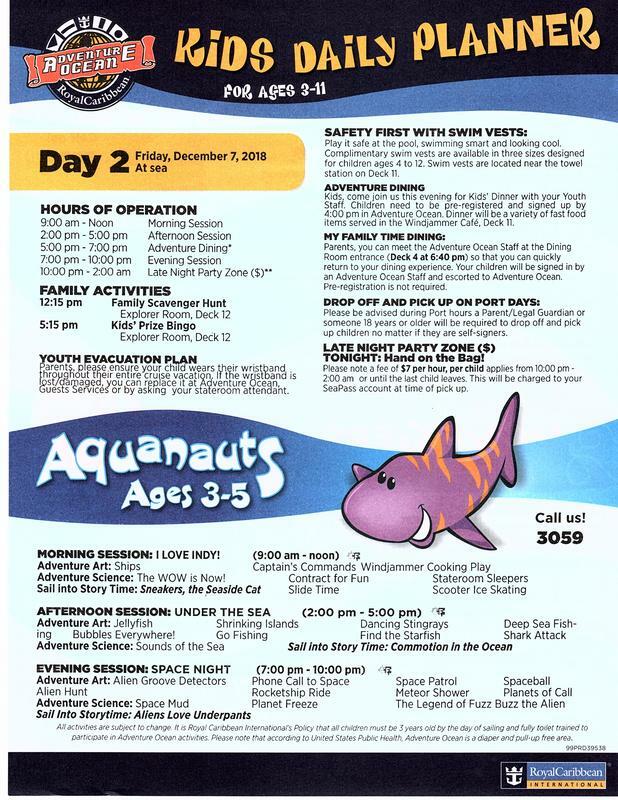 Here are all the daily planner sheets for the Adventure Ocean and Nursery programs. The sheets that they gave us were dated wrong, but the day by day (day 1, 2, and so on) info was correct. 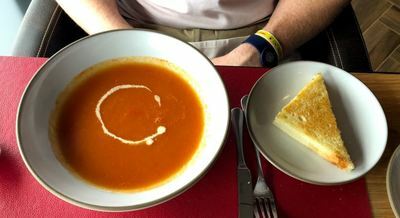 ​Adventure Dining was offered on Nights 2 and 3 only. They initially allotted 8 hours to each family for the nursery. 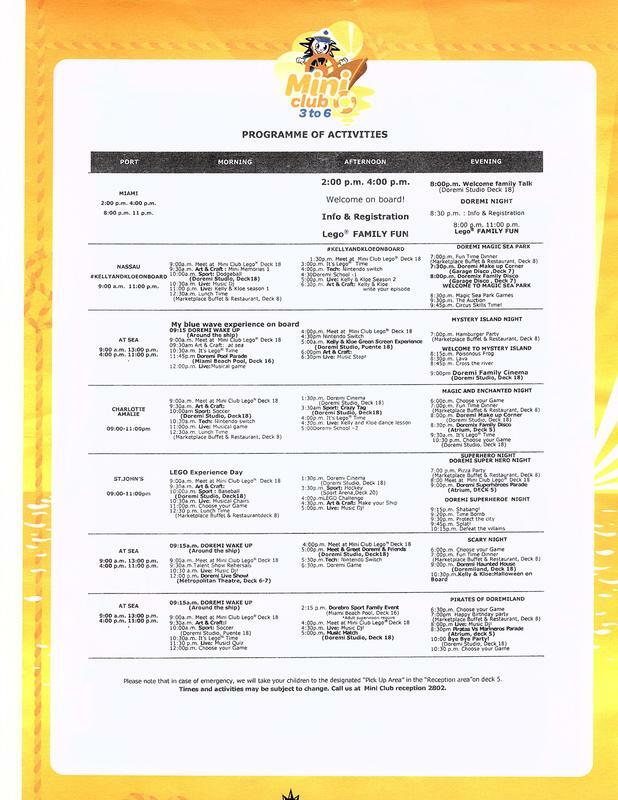 In the afternoon of Day 2 they opened it up to sign up for additional hours. They were easy and flexible to work with when wanting additional hours. There were reportedly 75 children between the ages of 6months and 3 years on the sailing. 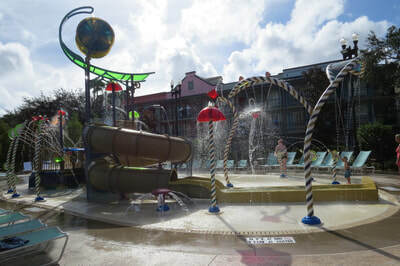 The Seaside has multiple pools. 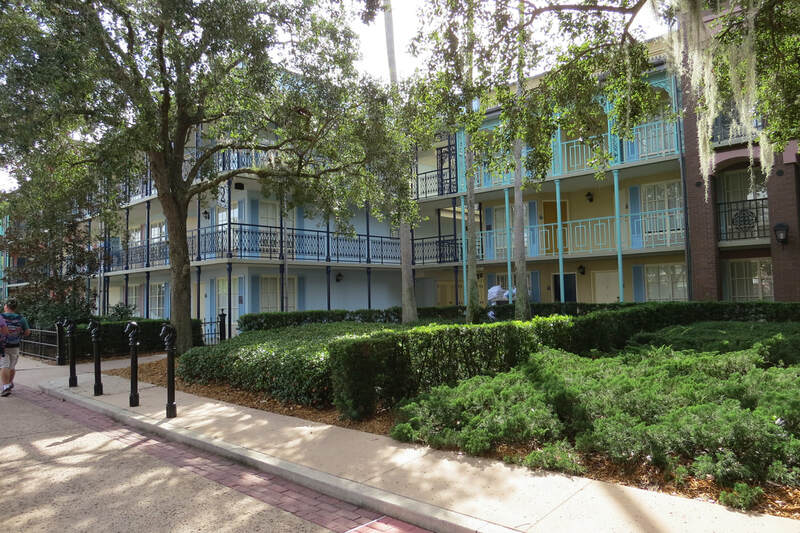 Some are restricted, like the Yacht Club pool is only for Yacht Club guests, and the South Beach pool is adults only. 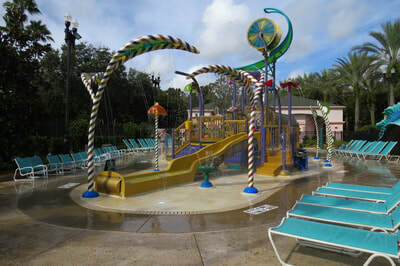 But the Miami Beach pool & Jungle pool are open to all guests. They are all nearly 6 feet deep, so don't plan on standing around in them! Some have a small shelf for kids to stand and others to sit/lay. Remember to click on the photos to enlarge them. Overall I was happy with the pool & slide experience on this cruise. 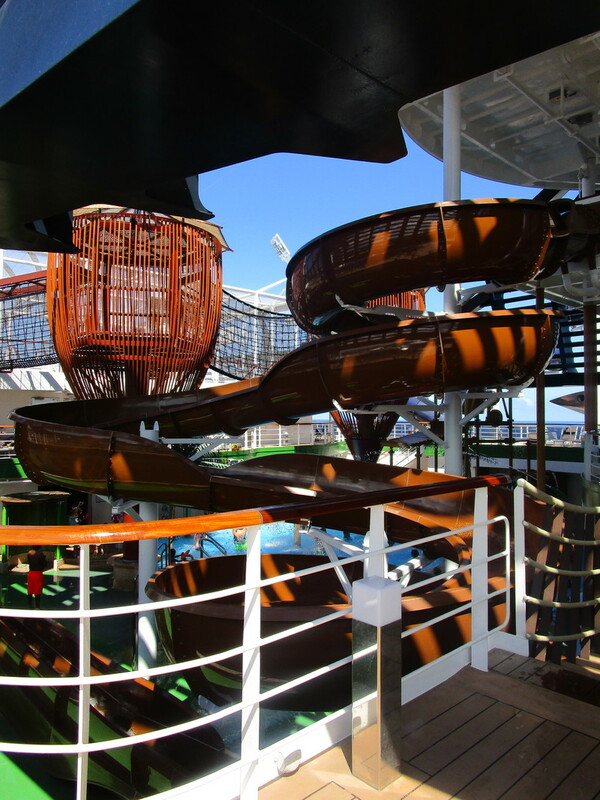 I would consider this the "main pool" onboard. 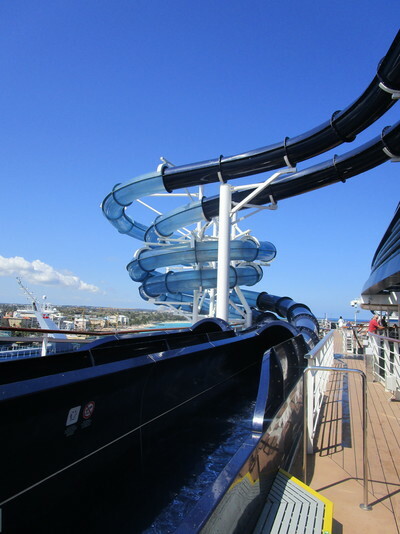 Located on deck 16 aft, this is the one with the big screen near it. 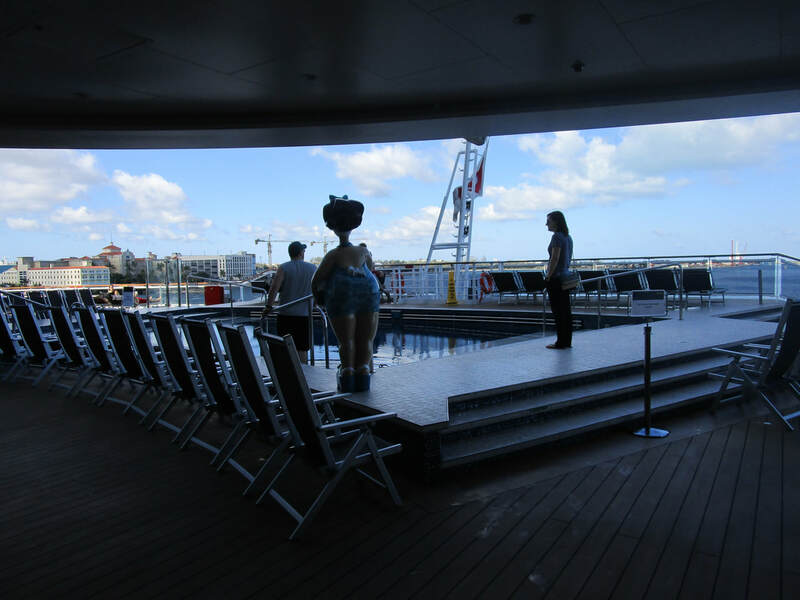 It's where the pool deck events happen. 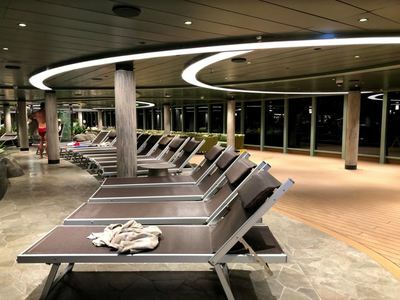 It has the most space with lounge chairs. It was also, unfortunately, poorly designed. 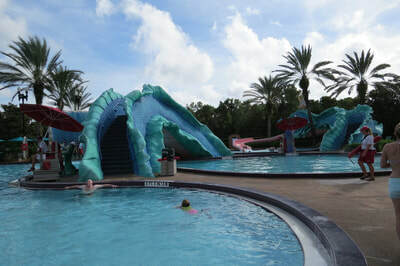 There was a large round stage-like thing between the pool and the big screen. So it blocked the line of vision for anyone seated on the pool side. I don't know if they intended on using that for a stage or what... 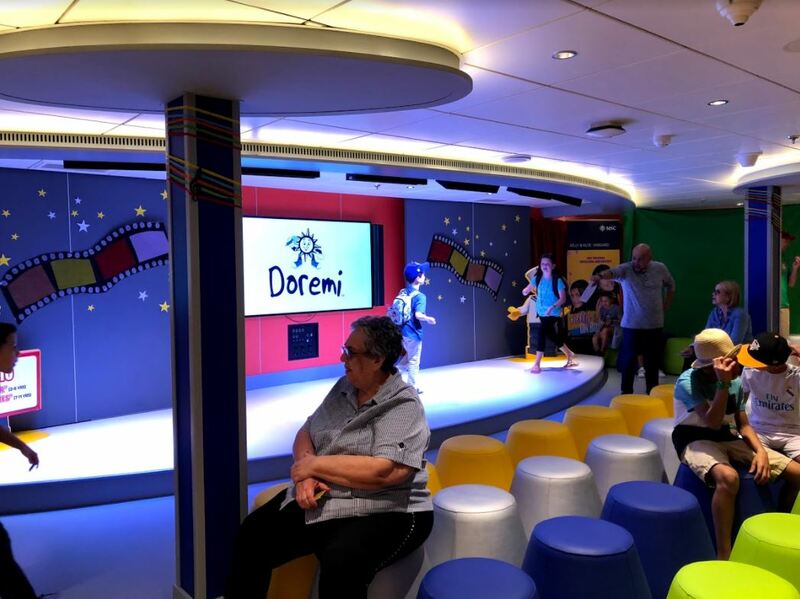 In reality, the cruise staff used the small rectangular stage beneath the big screen for hosted events. 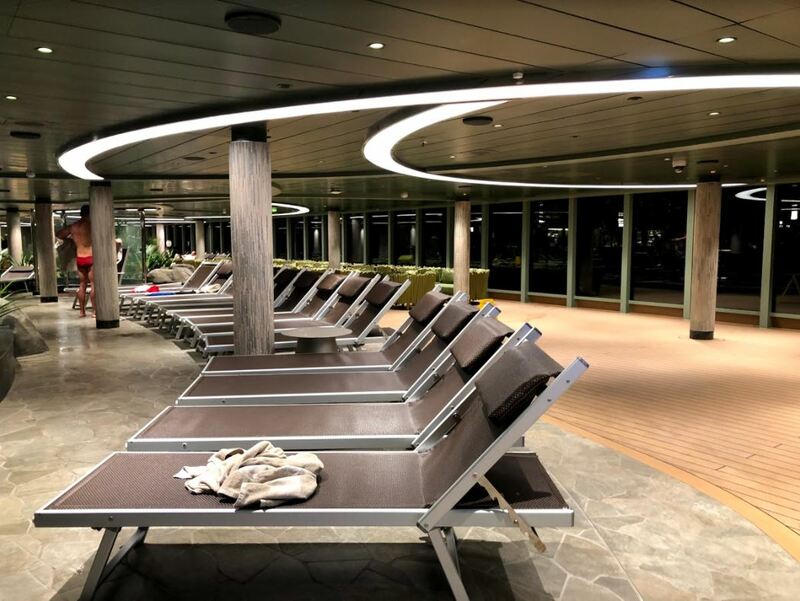 These lounge chairs are usually "claimed" before the sun comes up. 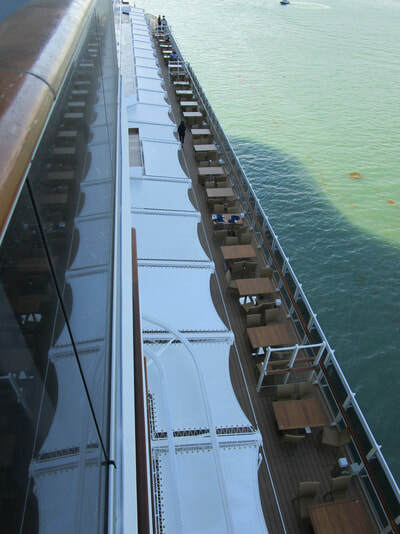 MSC doesn't have a policy or enforcement on reserving chairs on the deck. So, a lot of people lay out their stuff at the crack of dawn and then come back after they have breakfast. The South Beach pool is on deck six aft. This is an adults only location. I've included a photo of the pool deck as well as the view up from there. The Aft Aurea Suites overlook this pool. 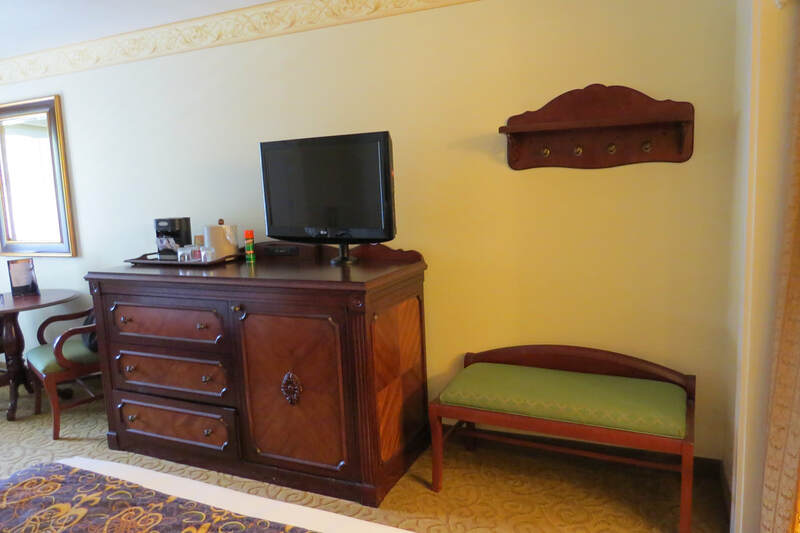 Some people refer to these rooms as the "condo suites." The aft Infinity Bridge, The Bridge of Sighs, also overlooks this pool. The pool is surrounded by tables, chairs, and the Venchi creperie & of course more gelato. We did not frequent here because he had children in tow. This pool is what I would call the family pool. There were more kids in this one than the Miami Beach pool. 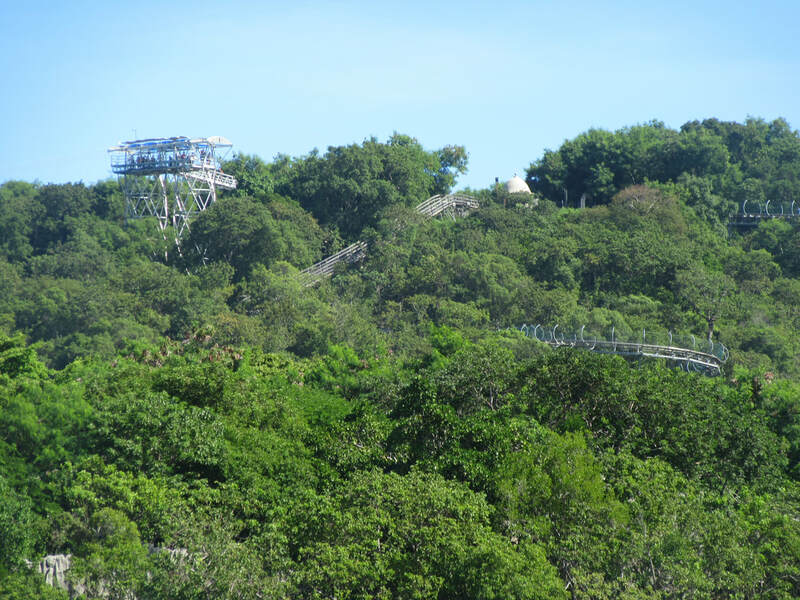 I think because of it's proximity to the Forest AquaVenture Park and it having the magrodome (sliding roof) that was closed on a few occasions to beat the hot sun. 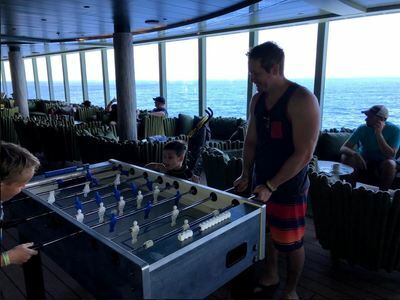 This pool also has game tables like ping pong and foosball. 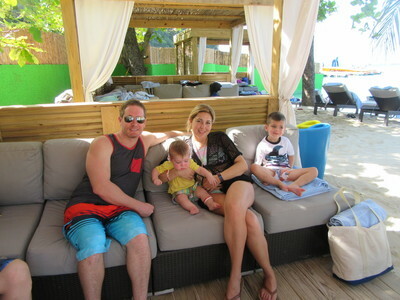 Funky seating elements made it attractive to families who wanted to seek shade and still have fun in a pool. We did not use this pool either but walked through here numerous times. There is a bar and gelato location in here too! This is the water park, with four full-sized slides. My five-year-old was excited because he was finally tall enough to ride the slides! 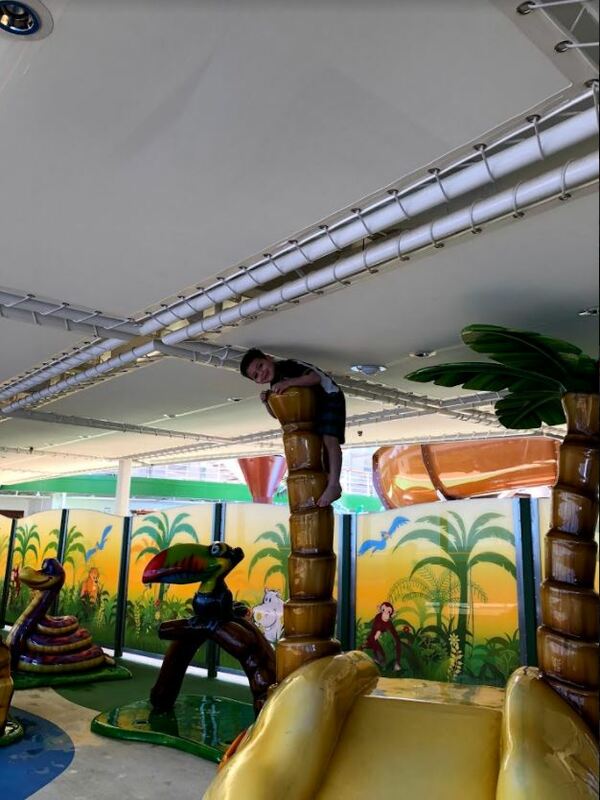 The minimum height for the double blue slides and the brown slide is 40". He's 41". 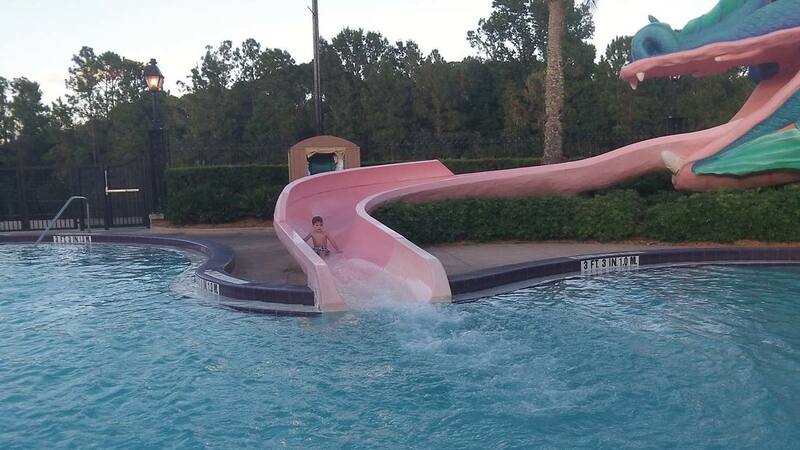 The minimum for the Slideboarding one was 42". An interesting note... 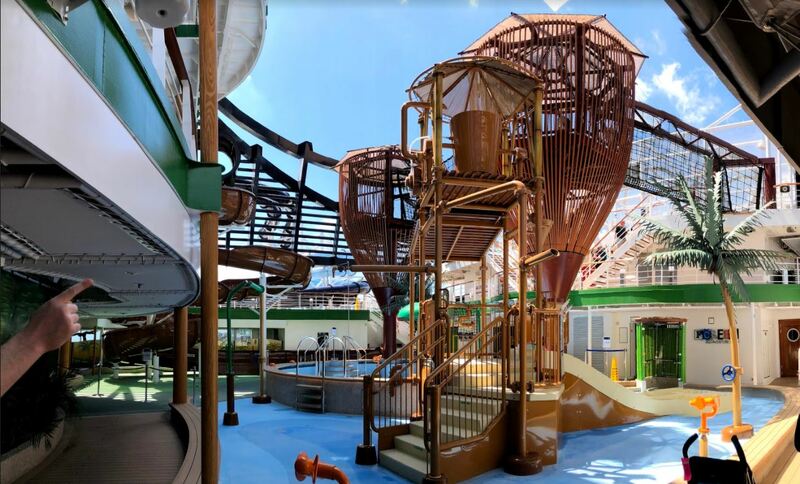 The KIDS water slide on the Harmony of the Seas had a minimum of 42," and that one is pretty tame when you compare it to the slides on the Seaside, which were like authentic water park slides. In the center of the park was a small pool with sprayers, waterfalls, and a giant dump bucket! Can't forget about the mini slide for the little ones. 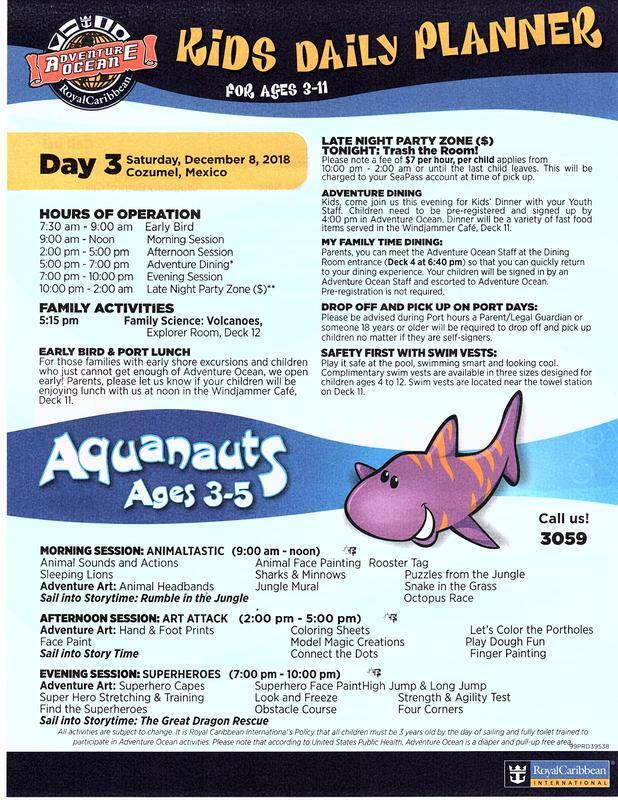 The Forest Aquaventure park was a lot of fun, and my family frequented here on every sea day. Surprisingly, it never felt too crowded, and the lines for the slides were very reasonable! 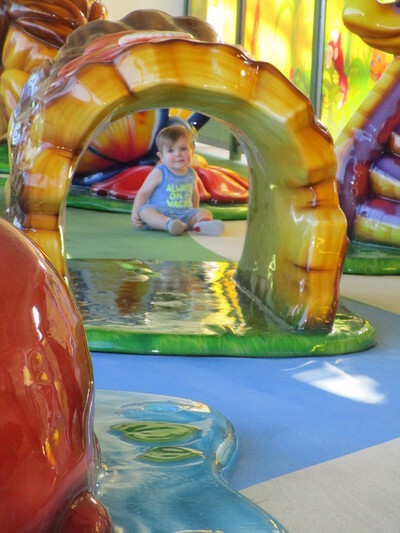 Directly next to the Aqua Venture park was a covered and enclosed area meant for toddlers and babies to play in. The apparatus were similar to those you'd find in your local mall's play area. 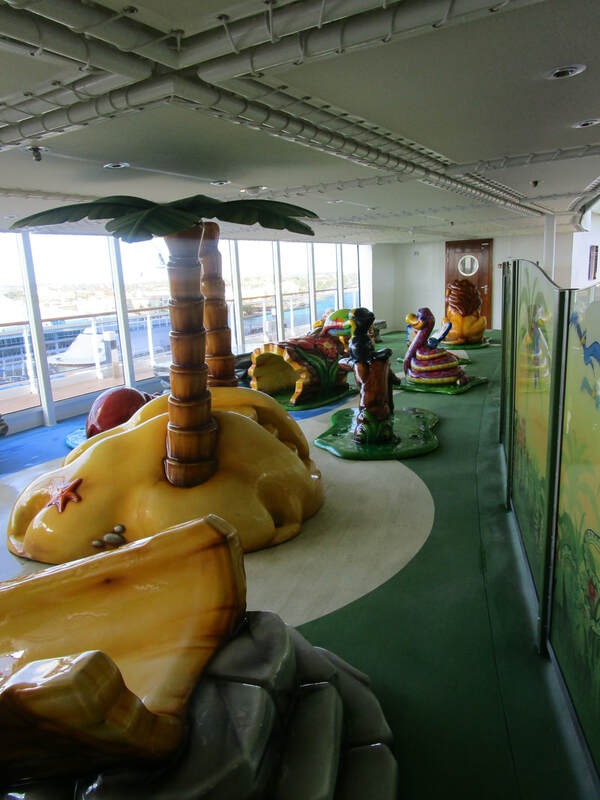 Soft- plastic coated slides and animals to climb on. We used this for our little one a few times. It was very well shaded, with windows on one side so that it didn't feel claustrophobic. Occasionally a tween would come in thinking it was a place they could act wild, but the parents watching their little ones would quickly ask them to leave. MSC has different "experiences" Bella is the basic room, a good value if you don't need a lot of add-ons. Currently, Fantastica comes with 12 drink vouchers per person (except babies), better room location, and room service included. 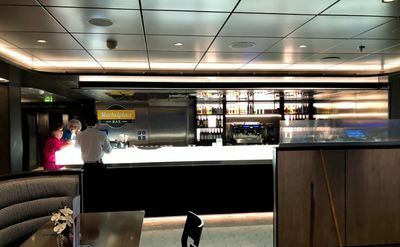 Although rumor is, after March 2019, the drink vouchers are no longer available. 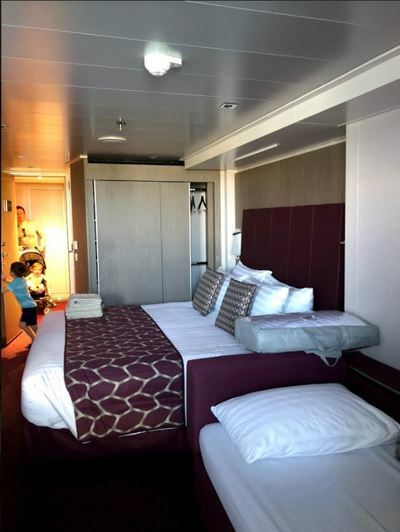 Aurea includes the best room locations; some with unique features like a whirlpool on the balcony or an aft wrap balcony; classic drink package, two spa treatments, and more. 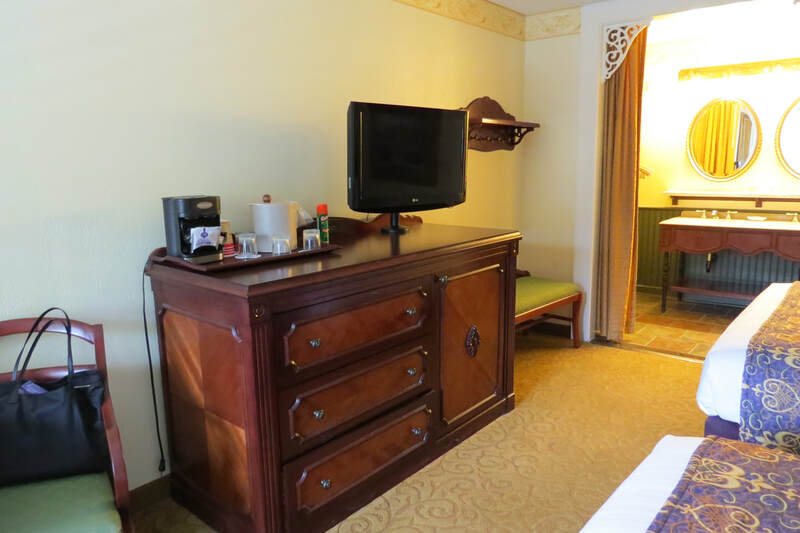 When booking we opted for the Fantastica package because we aren't huge drinkers and we are okay with a regular room. We were in room 11209. 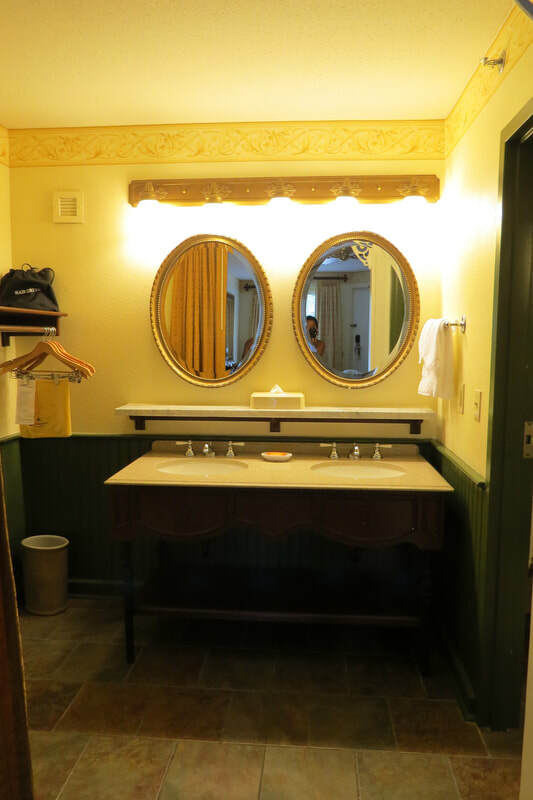 About four rooms away from the elevators and two rooms from one of the fancy Aurea whirlpool suites. My husband, at one point, asked why I didn't book us in one of those! I had debated it at one point but decided to save the extra money and go with the Fantastica package and room. The room was just the right size for us. 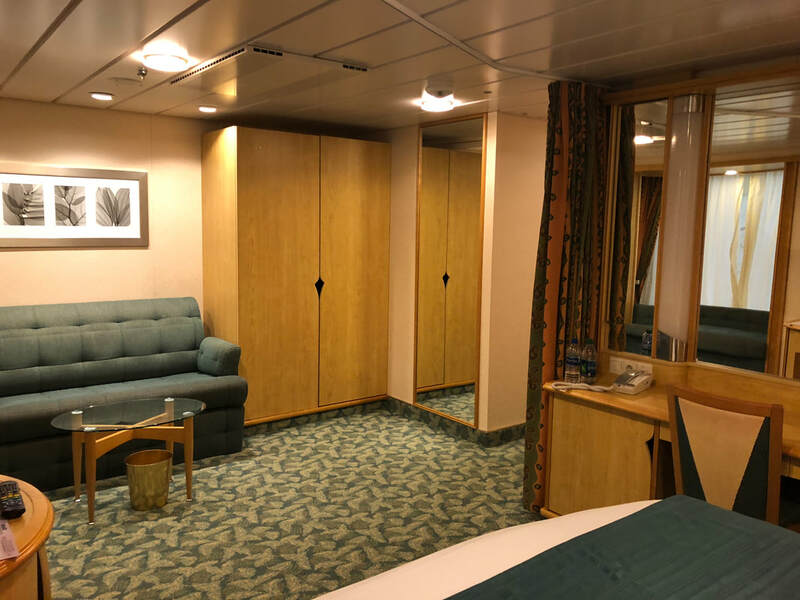 About the same as a regular balcony room on any other cruise line we've experienced. The sofa can turn in to a bunk bed with two beds. We didn't use it as such because we only needed one bed space. 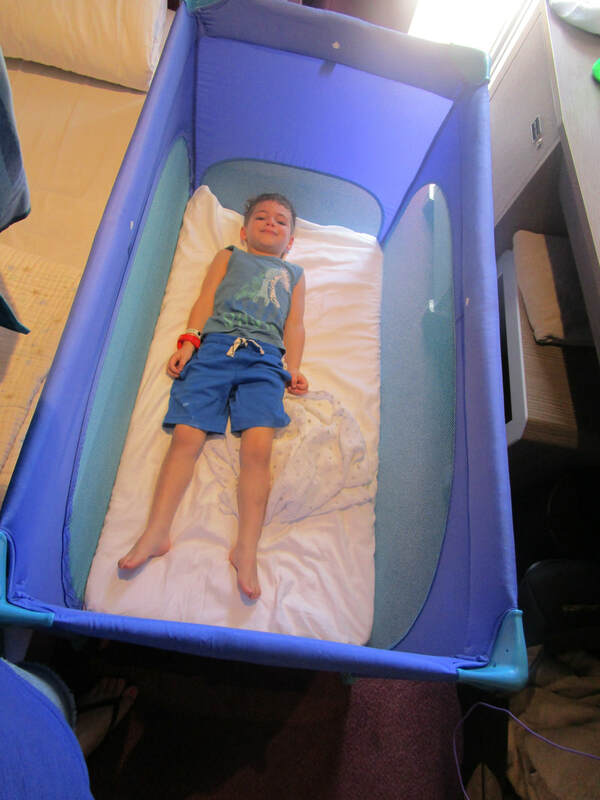 Our younger son slept in the pack n play they provided. 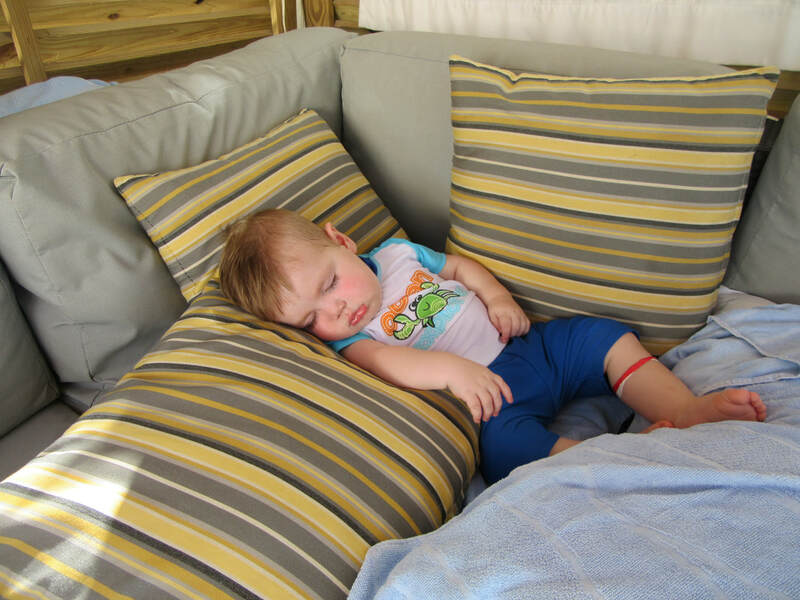 The curtains by the balcony were very thick, which helped keep the room nice and dark for nap time. It also helped my family sleep in every morning! Win! 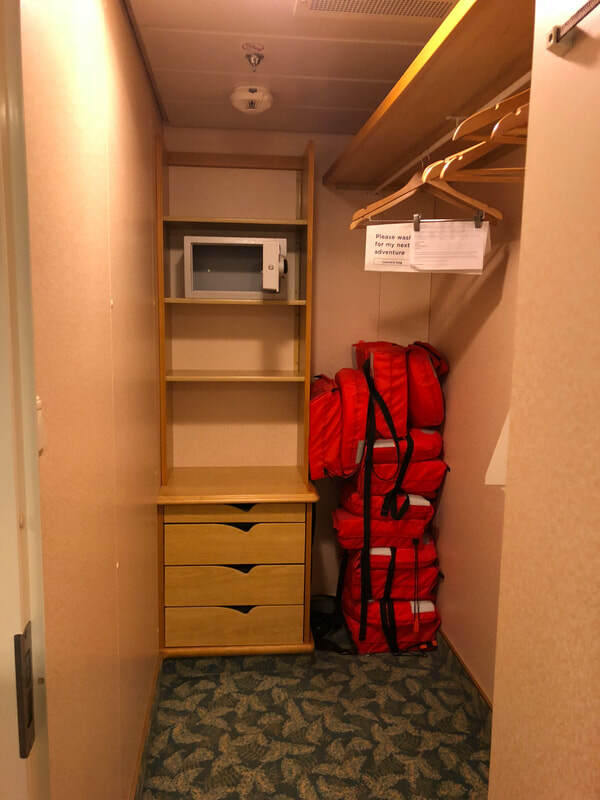 Our particular room was classified as ambulatory accessible. There were no handrails or anything extra that made it seem more accessible than a normal room. But we did have a doorbell. That was kinda nice! There was an orange light on our ceiling that would light up, followed by a ding. The drink vouchers were nice. My husband and I received 12 each that were good for any drink under $8 in value. Alcohol or not. My five year old received the equivalent 12 coupon vouchers but non-alcoholic version. The baby, at 15 months, did not receive vouchers. 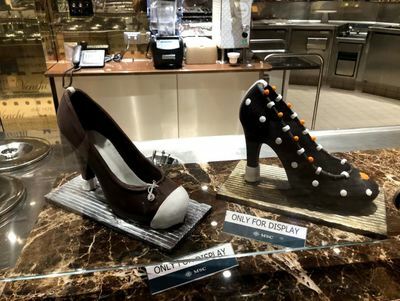 They were also able to be used on gelato. Storage was tighter than normal. 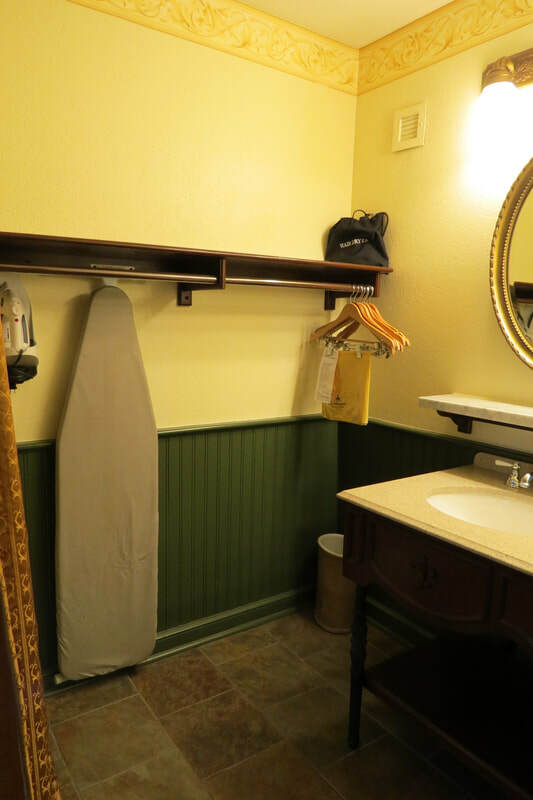 The closet was small, but it accommodated everything for my husband and myself. The only drawers were located IN the closet, nothing under the desk like on other lines. We knew about this going into the trip, so I brought heavy-duty magnet hooks and a hanging closet organizer. 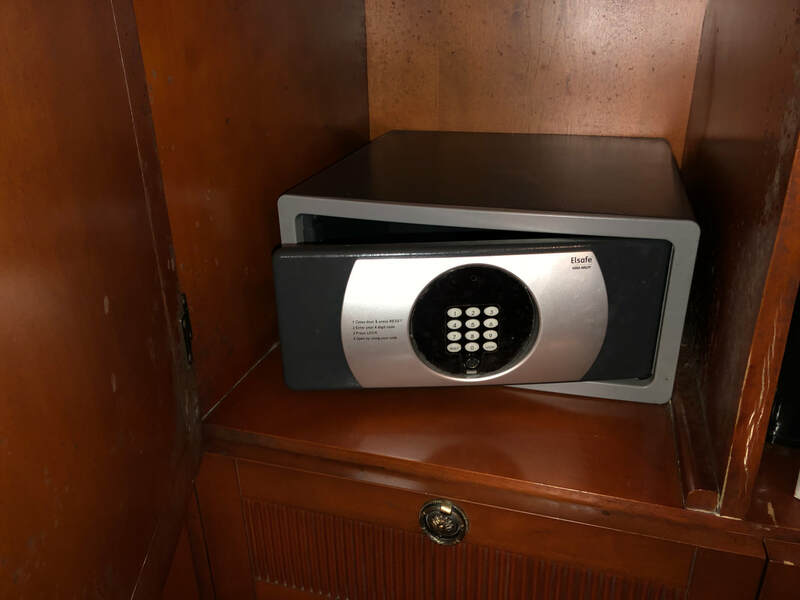 We kept the boys' clothes in there. This one was nice because it had the days of the week and even a few side pockets for underwear and socks! The setup of our room had the bed right next to the closet which made getting into the closet difficult. Not impossible though. We had to sit on the bed to access the hanging section. 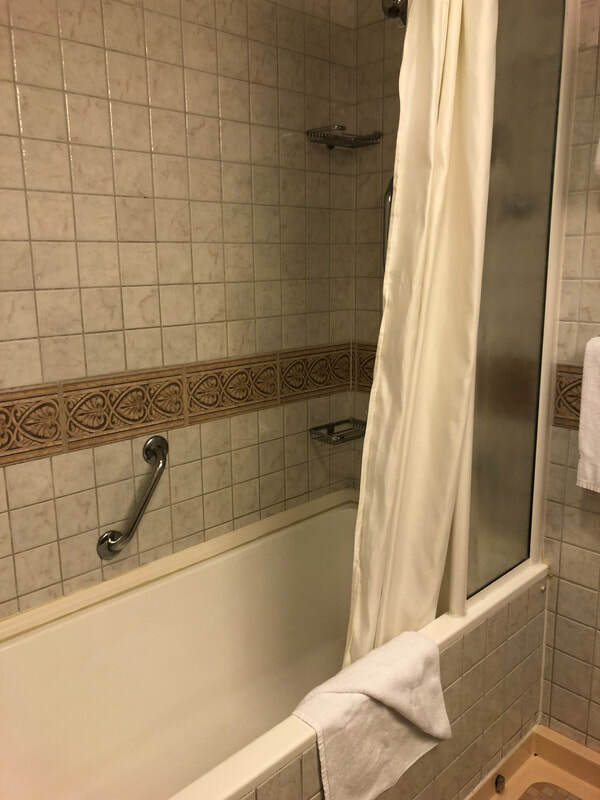 No built-in divider curtain. 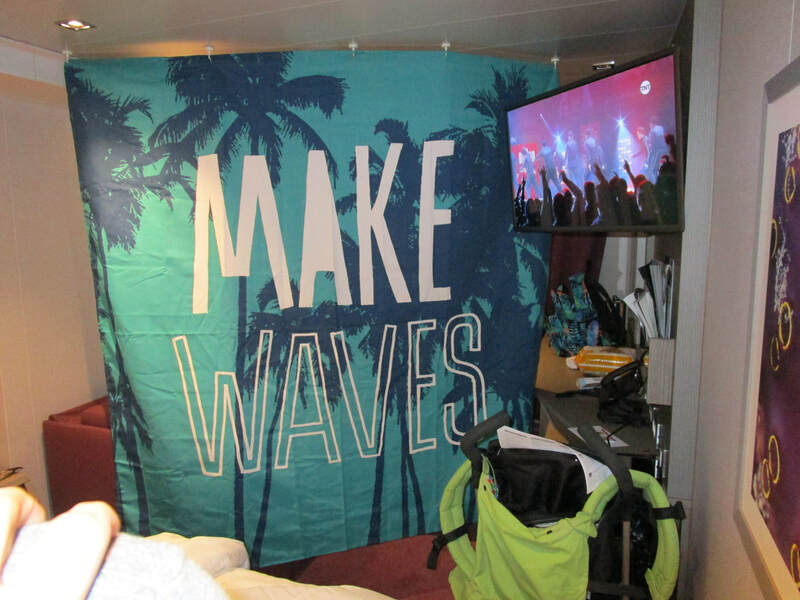 Some cruise lines have a divider curtain in rooms that accommodate more than two people. Fear not, I had my hand dandy travel shower curtain. Paired with a few more heavy duty magnet hooks and we had the divider set so the kids could nap and sleep while we watched some TV. The giant pack n play. Like seriously giant! My five-year-old fit in it with extra room. I don't know if they just make them bigger in Italy or what?!? It was Chicco brand. Clean and new. It even came with a nice thick pad for the bottom to make it comfier. But keep this in mind because for those of you who typically bring your own crib/pack n play sheets. They won't fit this thing! It definitely took up any/all of the floor space between the sofabed and desk! I will discuss the dining venues we went to here. This will not include the yummy, scrumptious crepes, gelato, and chocolate. That will come later! 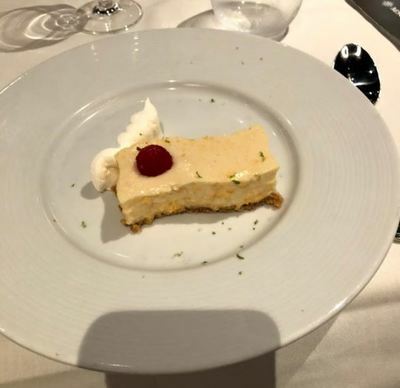 The Seaside is unique in that it has TWO buffets. 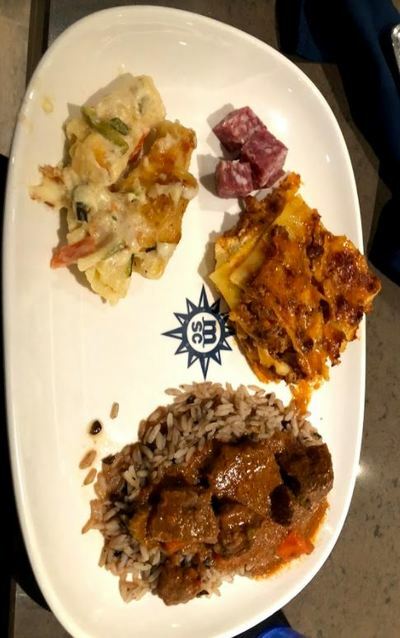 The smaller, family friendly one, is Biscayne Bay Buffet on deck 16. The larger, more robust, location was the Marketplace on deck 8. We ate all of our breakfasts, 6/7 lunches, and 1 dinner at the buffets. There are times that half of the Marketplace buffet is closed at night and used as a Main Dining Room with table service. 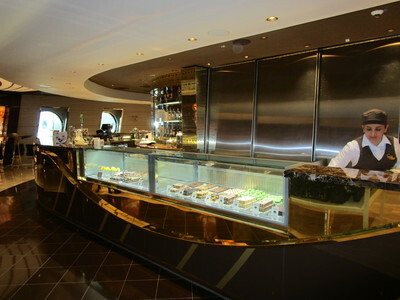 We usually chose the closer buffet- except breakfasts were always at Marketplace for us due to wider variety. Wide variety of foods despite what I had read in previous reviews. There was something for everyone. 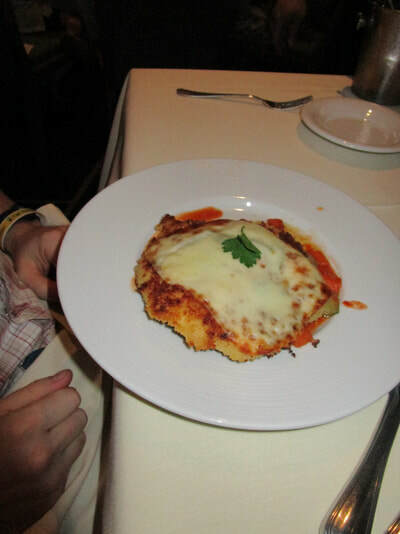 Pizza was served at every meal- breakfast lunch, and dinner. Breads were freshly baked daily. 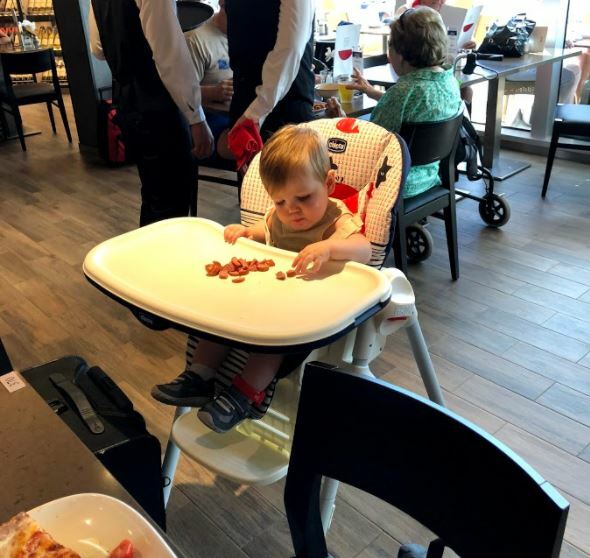 Full sized high chairs available with a tray. They are the Chicco Polly highchair line. They were always clean and available. 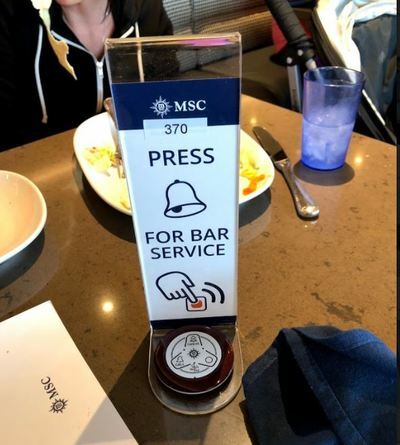 Bar Service button at each table along with a bar in the marketplace buffet. We never struggled to find a table. Marketplace, on deck 8, has plenty of outdoor seating. We had great weather and took advantage a few times! Biscayne Bay Buffet had a low counter for kids to get their own food from. 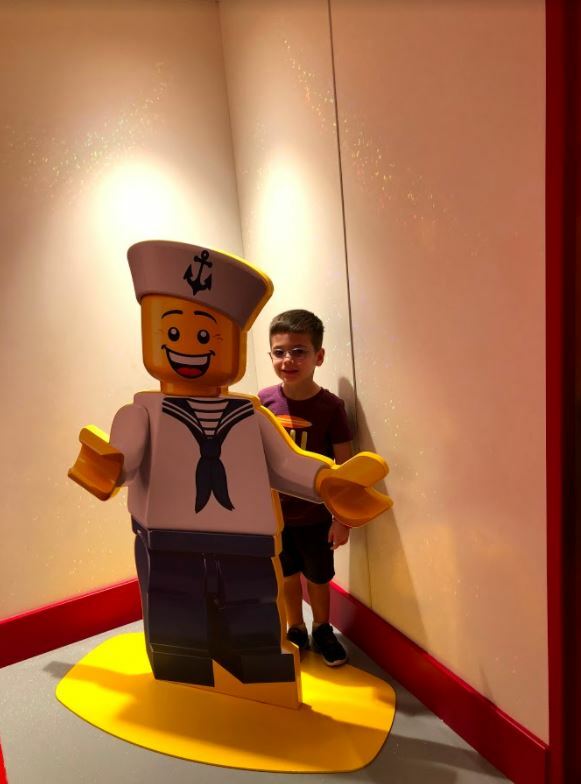 It was chest height for my 5 year old. Deciding which buffet to eat at. Crowds. We found the Biscayne Bay buffet to be much more crowded. 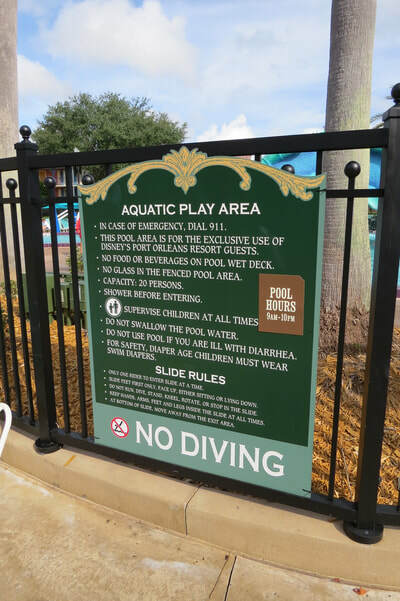 It was smaller to begin with and near the Miami Beach Pool, so naturally people head there because it's close to the outdoor activities. The layout led to a lot of squished moments where there wasn't quite enough room for everyone to squeeze through while walking. 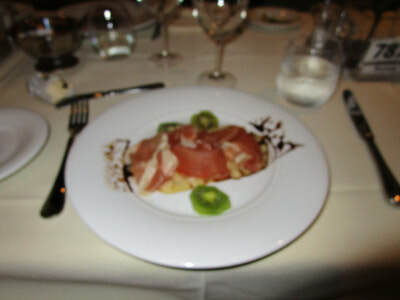 This is one of the hits and misses of the cruise- food is subjective. 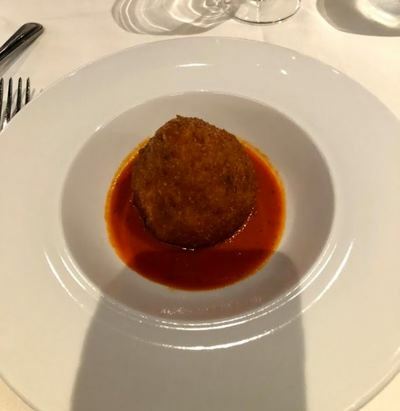 The food itself was good. 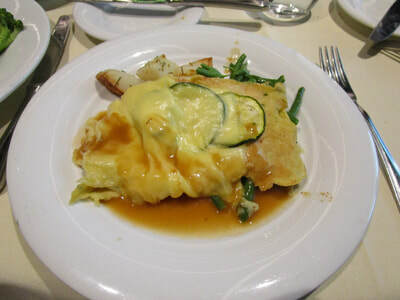 I consider myself a picky eater and found at least 1-2 entrees each night that satisfied my liking. There was only ONE dish that did not taste right, and that was the French Onion Soup. It was missing something, and I could not pin point it. 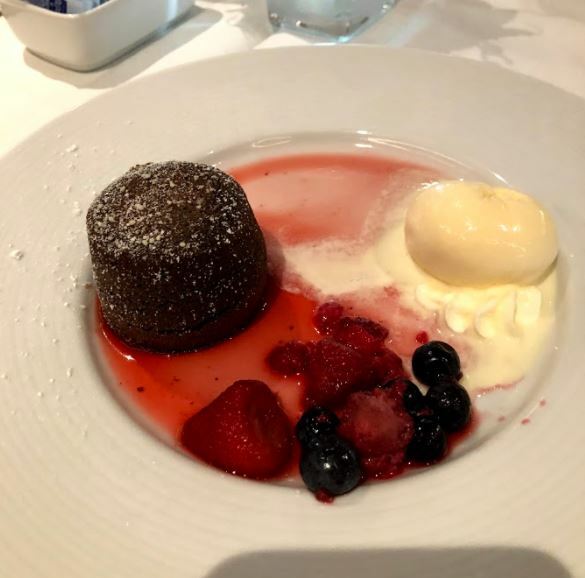 There were a lot of misses on the desserts too. 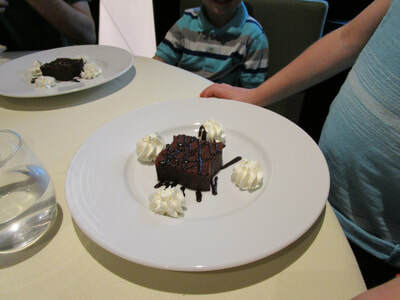 Their features Brownie stack was dry and lacked a good chocolate flavor. It also changed nightly. By the end of the week it was missing the brownie portion and only had mousse on top. 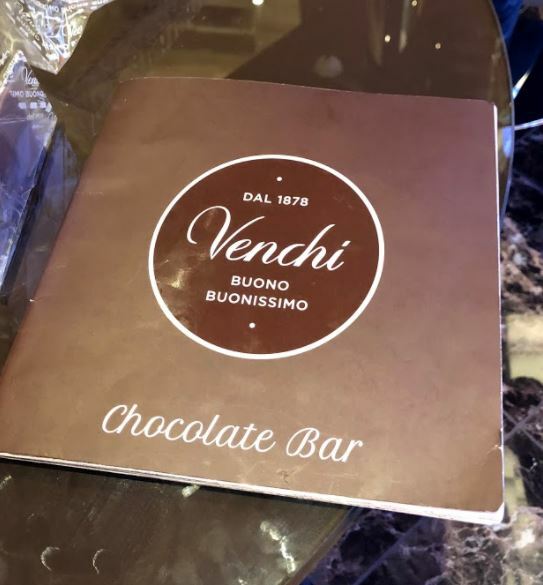 haha Thankfully we waltzed on over the Venchi after dinner, daily, and loaded up on gelato, chocolates, and more! 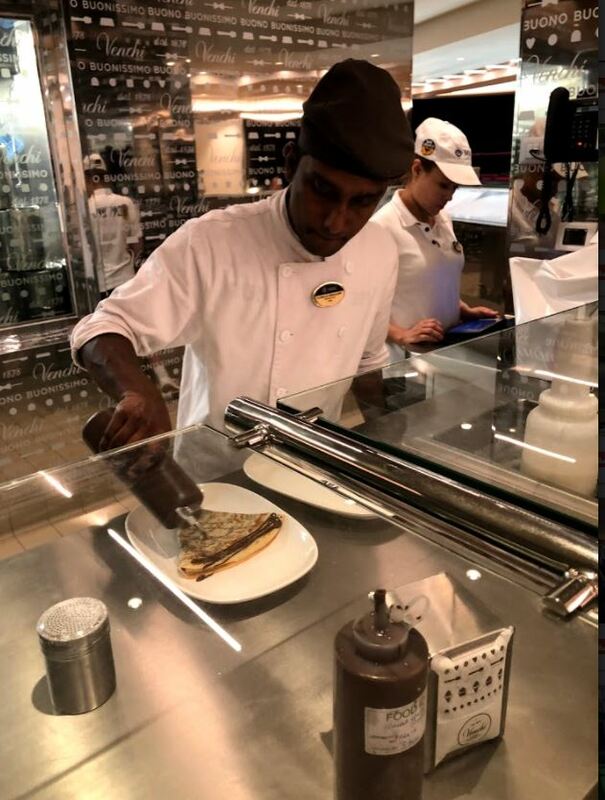 We requested early dining and were assigned 7:45 pm in the Ipanema dining room. 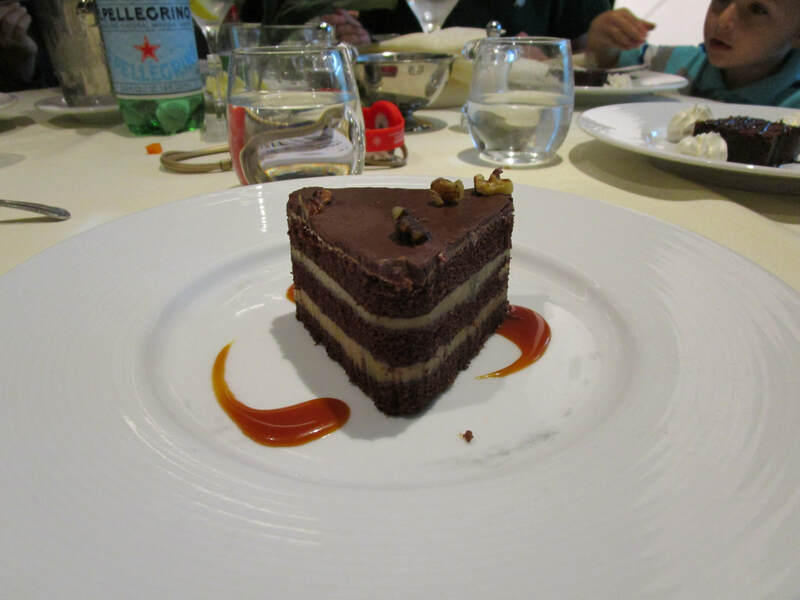 We went to the Maitre D on the first day to request to be moved. 7:45 pm is too late for us to eat with young kids. There were many other people waiting to request the same thing. The couple we traveled with was able to get us accommodated at the 5:30/6pm time. Yay, great relief! Night one we had an amazing waiter who anticipated our every need and brought the boys food and desserts that kept them behaving. Nights 2-5 we had a waiter who needed more training. 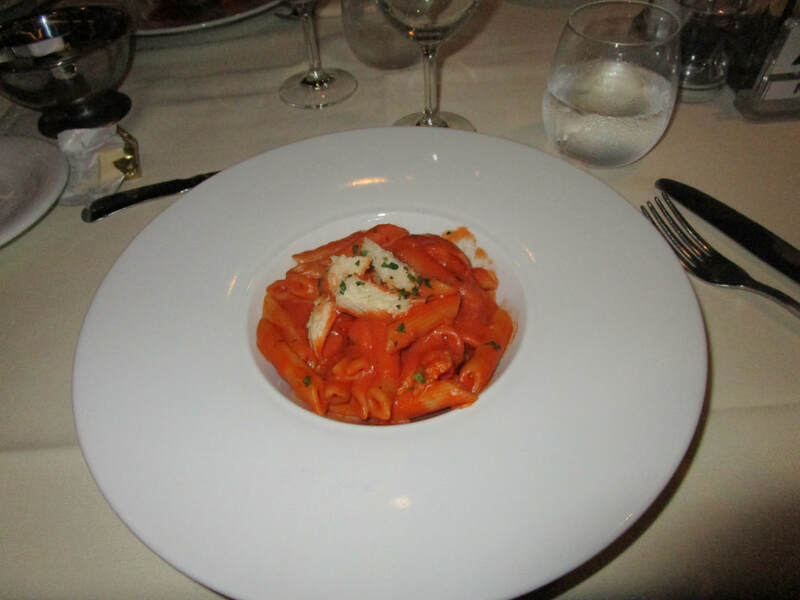 Night 6, the guy was on top of things, and the Maitre D even brought the boys dinners out quickly for us. Night 7, we were squeezed in last minute, and the guy was in a rush. So not our best dining "experience" on a cruise by far. 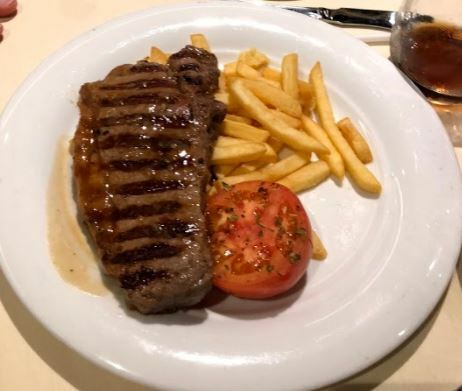 My husband and I had lunch at the steakhouse on a sea day. The food was delicious and flavorful. 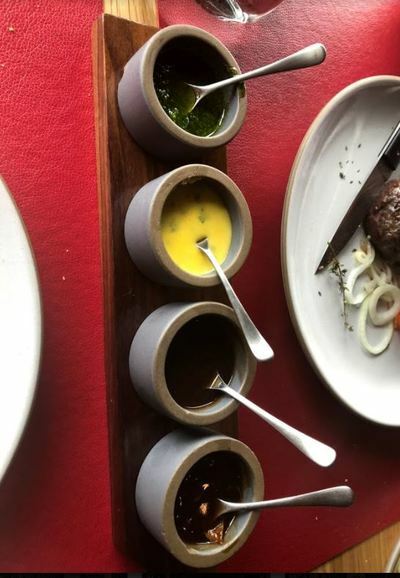 They offer two types of butter, one smoked and another sweet with spices. With the yummy butters, you're also given a soft cloth basket of bread. Four large breadstick style and one sweet biscuit. 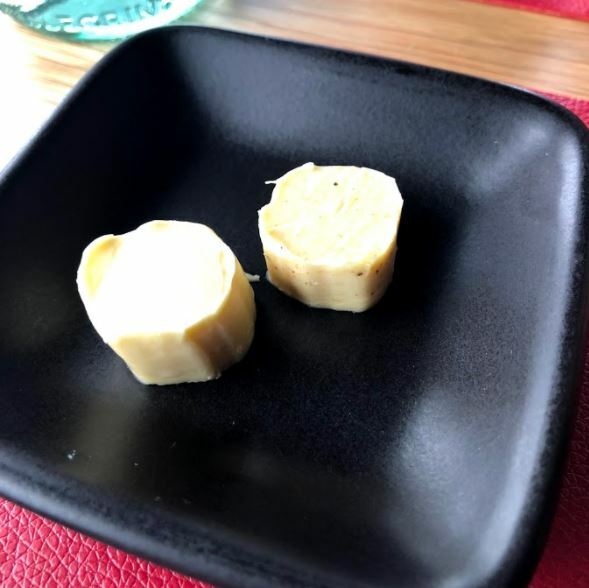 Those were pretty good, but I would have liked a soft bread to better spread my yummy butter! 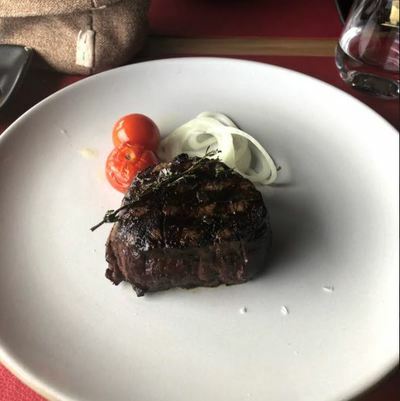 Overall it was a fabulous meal. Relaxing. Service was great. I highly recommend it! There were over 1,100 kids on our sailing. Happy Dinners need to be signed up for in advance, but daily. It does fill up! 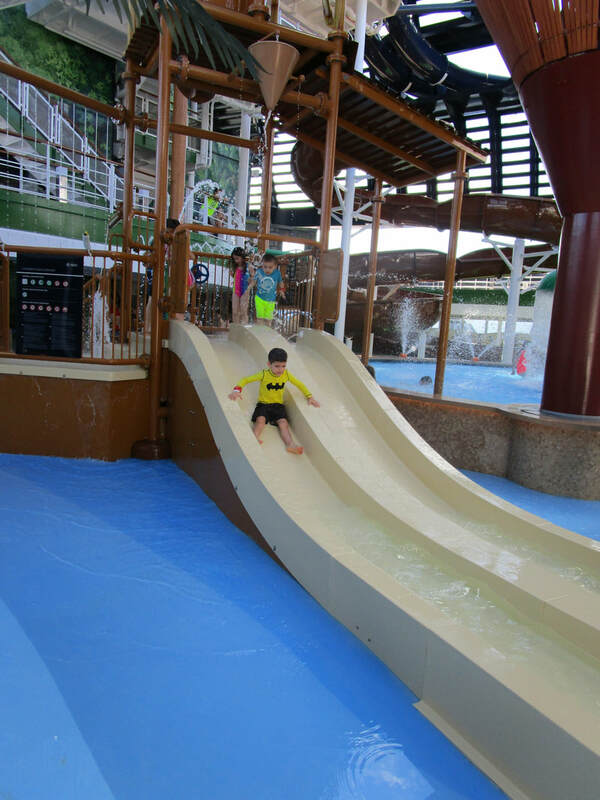 The kids club is located on the same deck as the Forest Aquaventure Park, we'll call it kid-central! 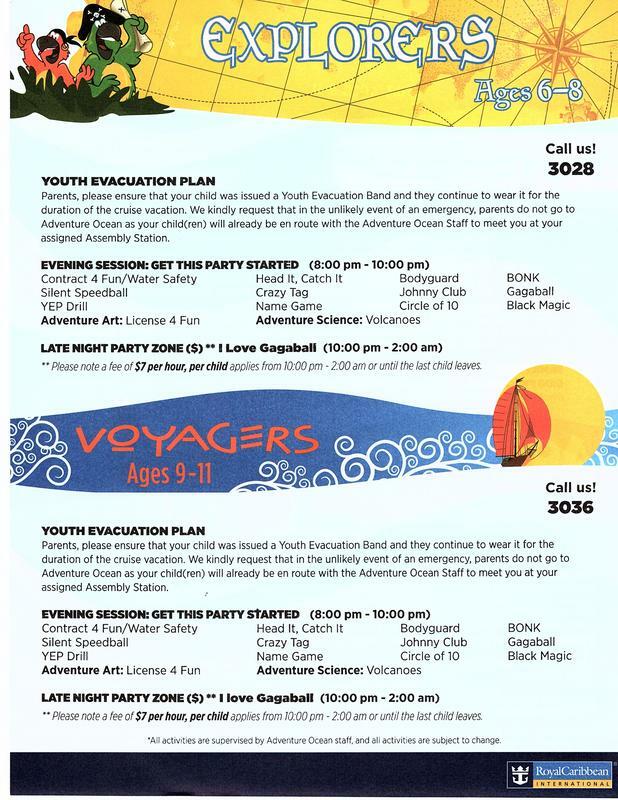 To use the GPS locator embedded within the kid bracelet, you pay $18 for the duration of the cruise. It was not free. The Mini Club room is Lego themed. 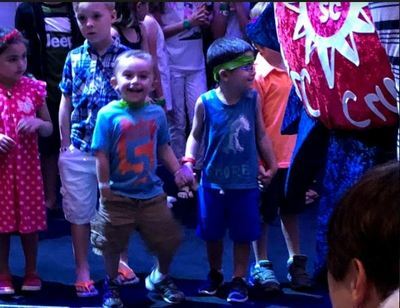 I was unable to get a photo because on day one they were doing a charity event closed to the public and after that, they did not allow parents back into the age group rooms. The kids club doesn't stay in there all day. There are various times in the day in which the kids were all over the ship. Dance parties in the garage club, soccer clinics on the basketball court, etc. We arrived one night to be told that the kids were down in the atrium. They had plenty of staff, but it seemed pretty easy to slip away with a kid in these locations. One night we picked him up from the Garage Club and no one stopped us from taking him. I am a rule follower, so I found the lady with the laptop to properly sign him out, but no one would have stopped me if I just left with him that night. 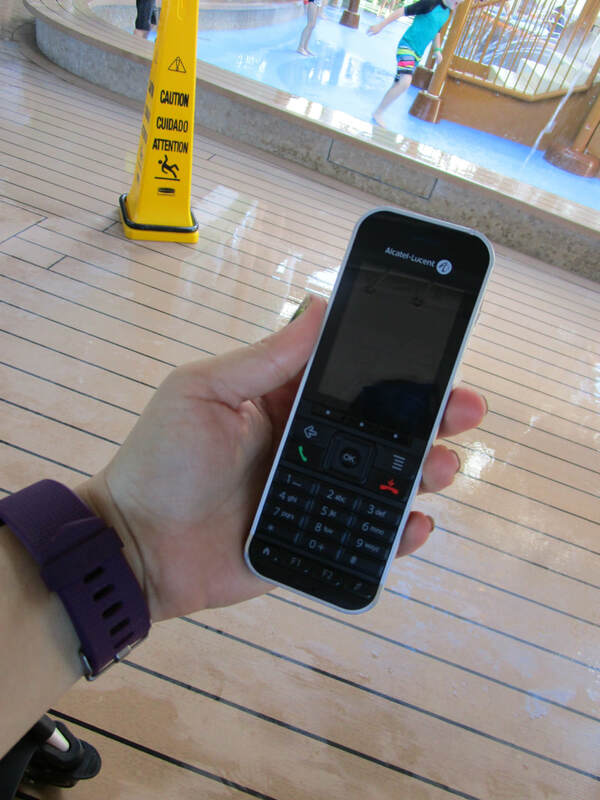 We were given a phone for them to reach us should something happen to our son. They called us nearly every time that he was crying. He's been in ship nurseries in the past, and this didn't happen. I don't know if it's his age or what. The girl who was there each time would hold him until we got there to keep him calm, which was nice. 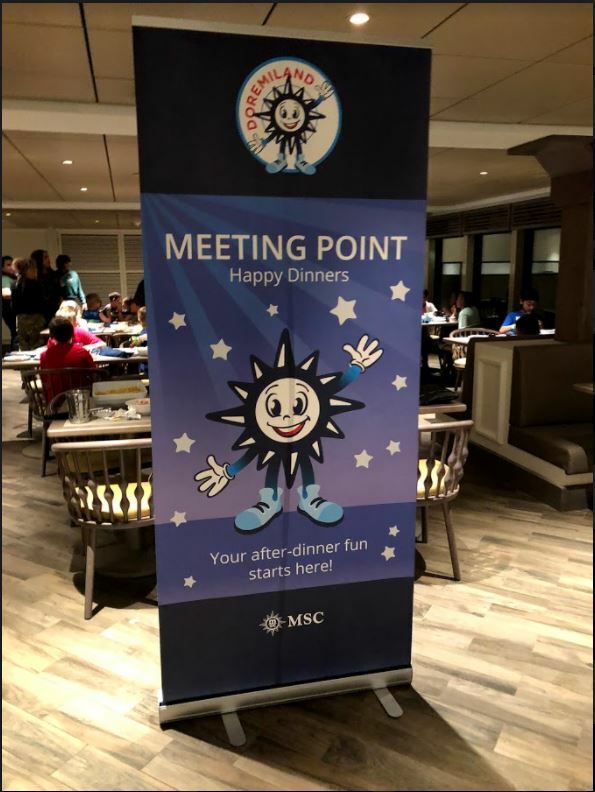 We signed our older son up for Happy Dinners on 5 of the seven nights. He's not a great eater, to begin with, so the dining room would be torture for him. 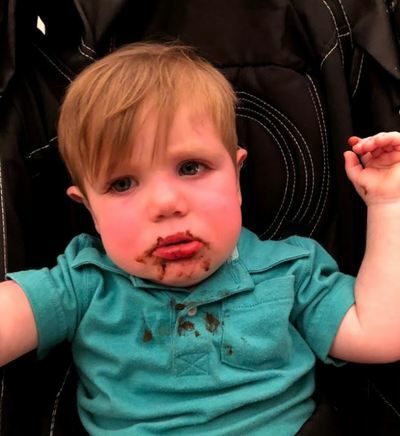 He's better off eating in a social setting with other kids. So we sent him there. 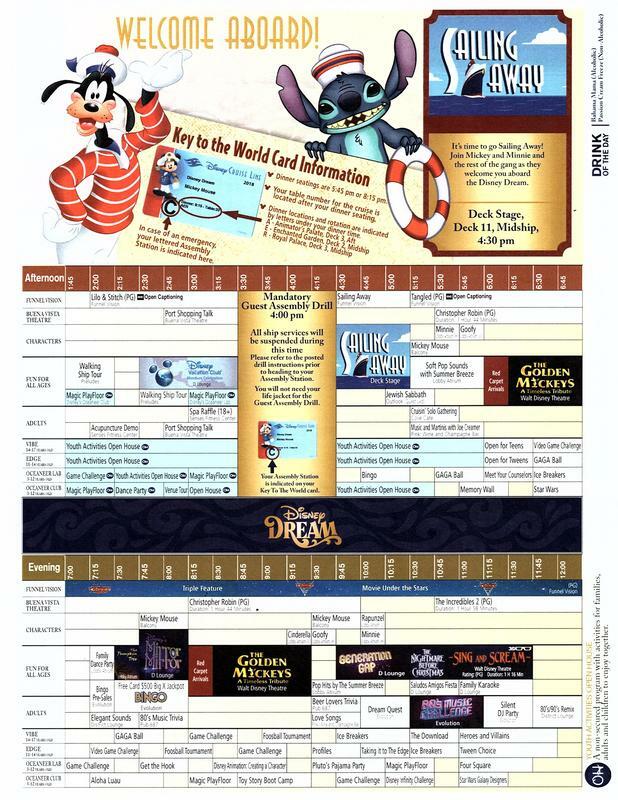 They had themed nights. Dinner was at 7 pm, which I found to be late for young kids. One night was a Hamburger party that I recall off the top of my head. But they served pizza, chicken fingers, french fries, and hamburgers to the kids. It's a cruise; I am not looking for my kid to have a plate full of vegetables. Each night we'd ask what he ate, and he would reply with "French Fries!" One night we picked them up from the buffet on deck 16- Biscayne Bay Buffet. It was closed to the public, so that was nice. They just had the kids in there. We saw trays of french fries! I can only assume it was the aftermath because they were passing out ice cream at that time. We had an issue on Day 2. 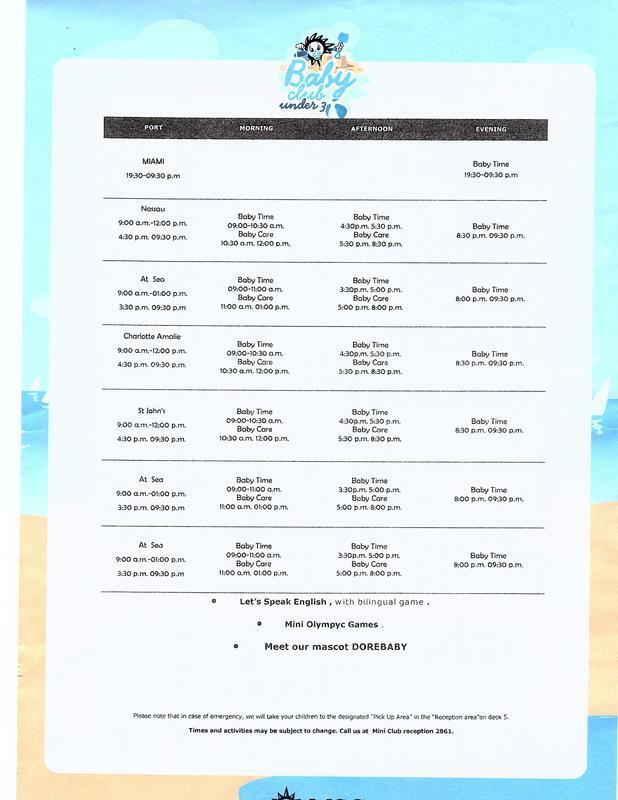 I had asked to sign my older son up for the Happy Dinners; the DoReMi staff member told me to come back at 5 pm to sign up. At 5 pm I showed up and was told it was full. I explained that the woman from earlier told me to come back at 5 pm. The lady in charge then argued with me that no one told me that and I was, essentially, making it up. 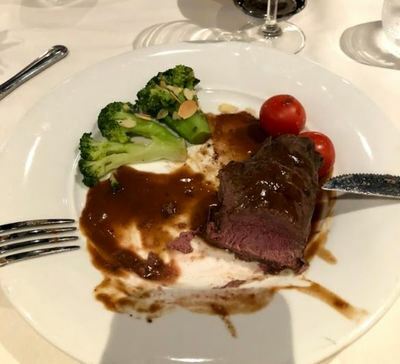 I eventually got it resolved, and my son ate dinner with the club. 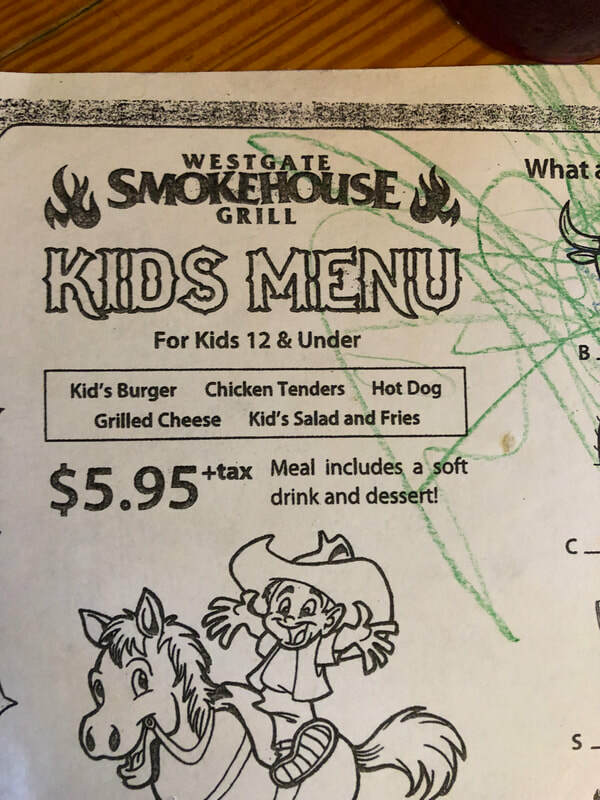 We had another issue later in the week concerning dining, but it was basically another argument with the staff at the kids club. We're baaaaack! We just sailed on the brand new MSC Seaside. 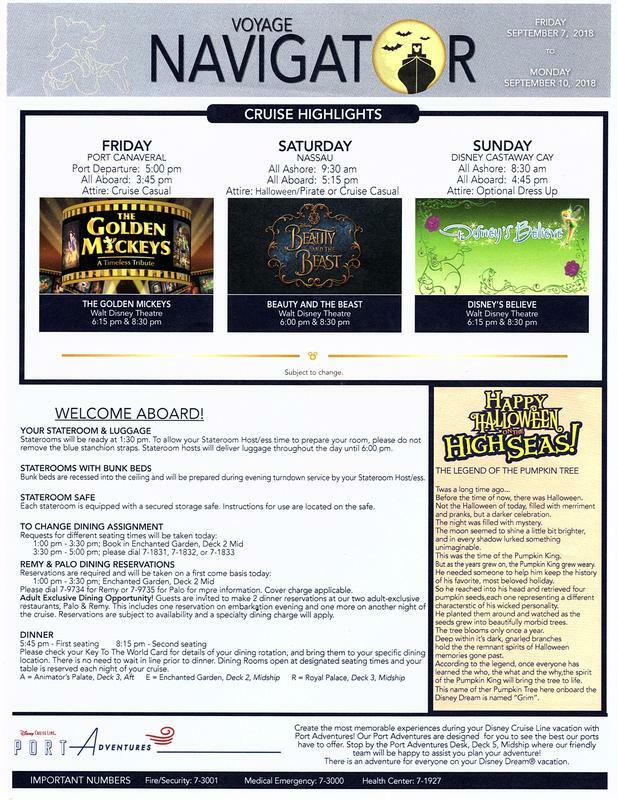 MSC has been around for many years as a shipping company, and now a cruise line as well. 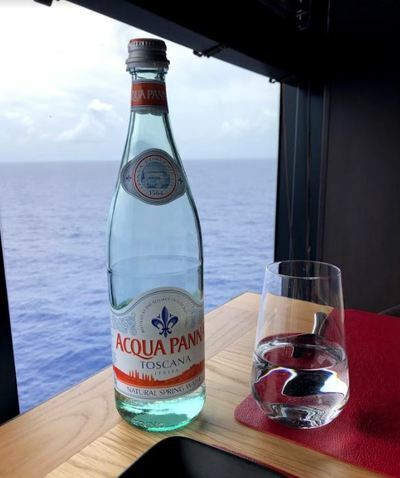 They recently decided to break in to the U.S. market a little more with a ship specifically designed to sail from Miami year round. I wanted to be one of the first on this state of the art new ship. It debuted in December, so I gave it 3 months to warm up to the "American" clientele. 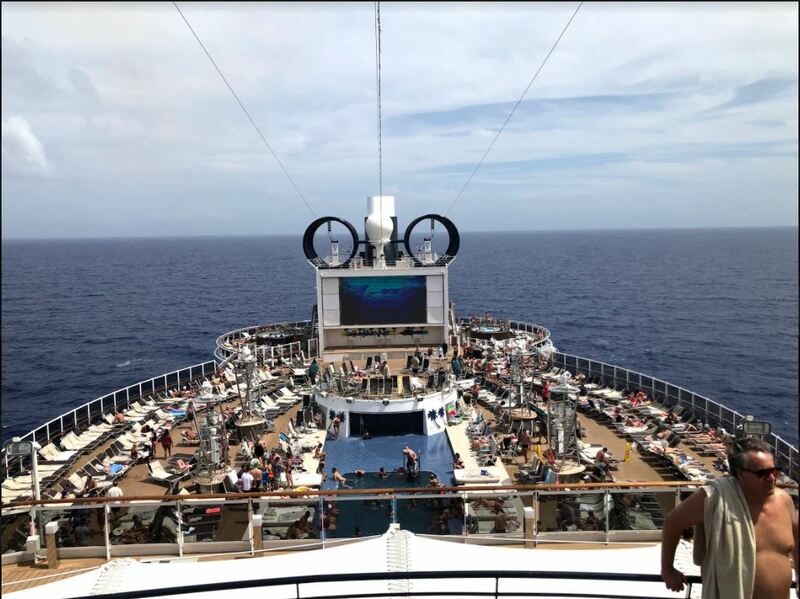 Before my cruise, reviews online were hit and miss. Everything from extreme disappointment to falling in love with the ship. It was shocking to read reviews of such disparity I know most people are wondering, how did it go? Would you go again?​ My answer is: we had fun. I would go again in the future as long as a few things change. Below is my "short" review. In the coming days, maybe weeks- depends on how busy I am, I will go through each category in separate blog posts. 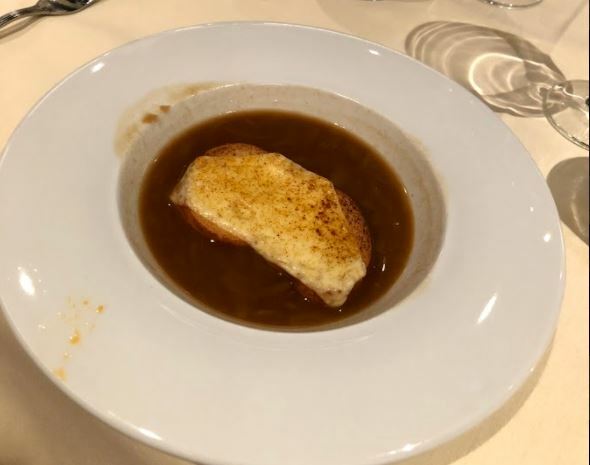 My husband said it was the best food he's had on a cruise that he can remember. 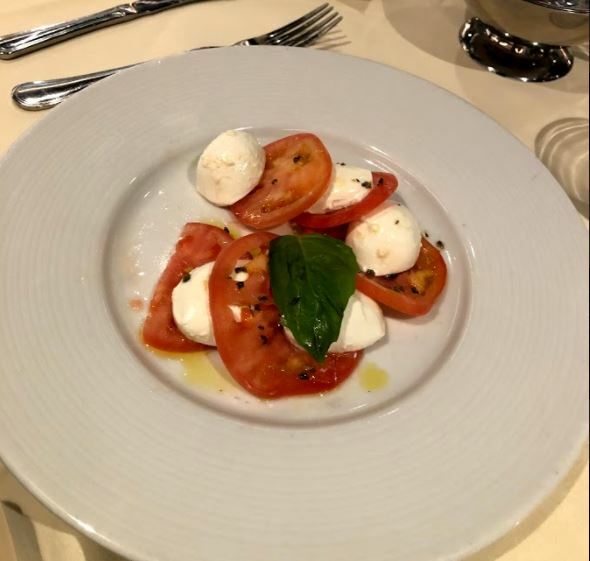 I am a picky eater and found something every night that satisfied me. 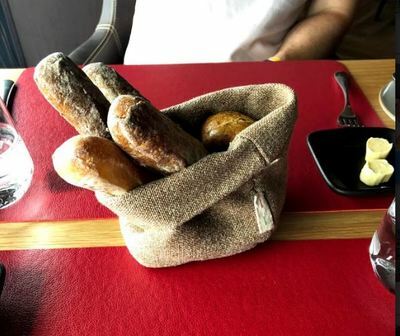 The breads are all fresh baked onboard and delicious. Butter was readily available despite earlier reports of "Buttergate" flying around social media. Pizza is also made fresh in pizza ovens a few minutes before it hits your mouth. It beats Princess pizza, which is pretty darn good! 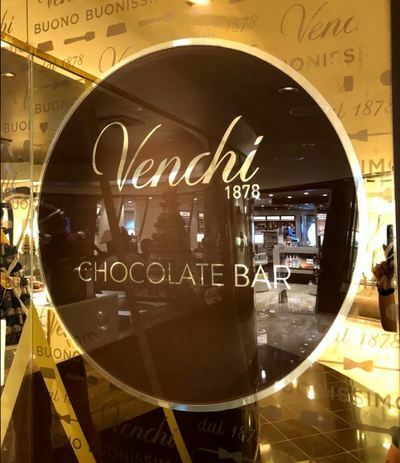 There are 4 Venchi Gelato shops onboard. 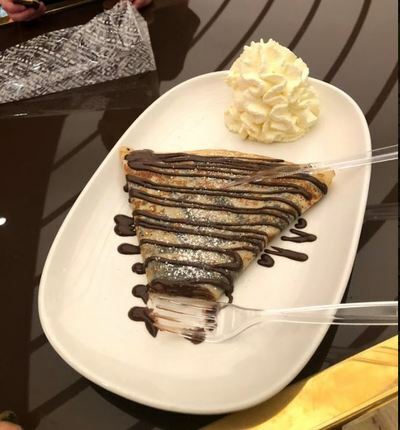 Some just have gelato, others have yummy crepes, fresh made chocolate, and even coffee! We ate at Butcher's Cut Steakhouse and our meal was fabulous. Overall the food was a win for me. 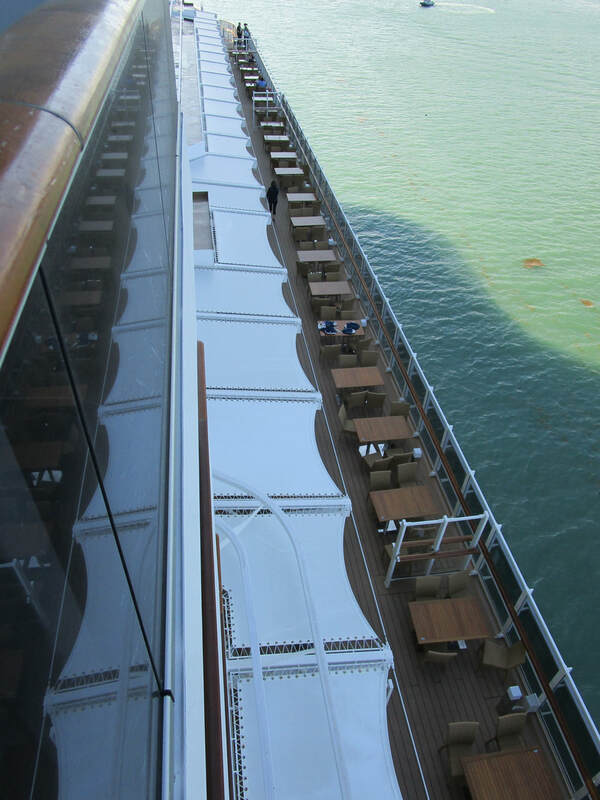 We had a Fantastica Balcony, basically a standard balcony for this ship. Aurea and Bella balcony rooms are the same size. It was a little tight, but that's because it had a smaller than average closet. Plus the pack n play they provided was massive. Like, so big that my 5 year old fit in it with extra room! I guess Chicco makes bigger ones in Italy? I loved the curtains. Super thick, which kept the light out, which made my family sleep in! <3 The bed was better than the ones on Harmony back in December. I liked the glass shower door opposed to curtains that some older ships have. The room was alright overall. Not better nor worse than past cruises unless you need tons of storage space. 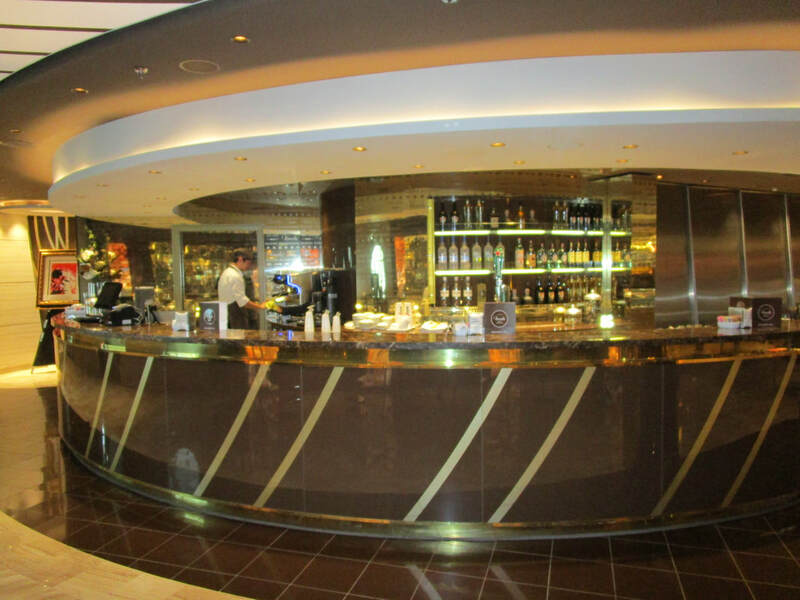 The ship itself was beautiful. 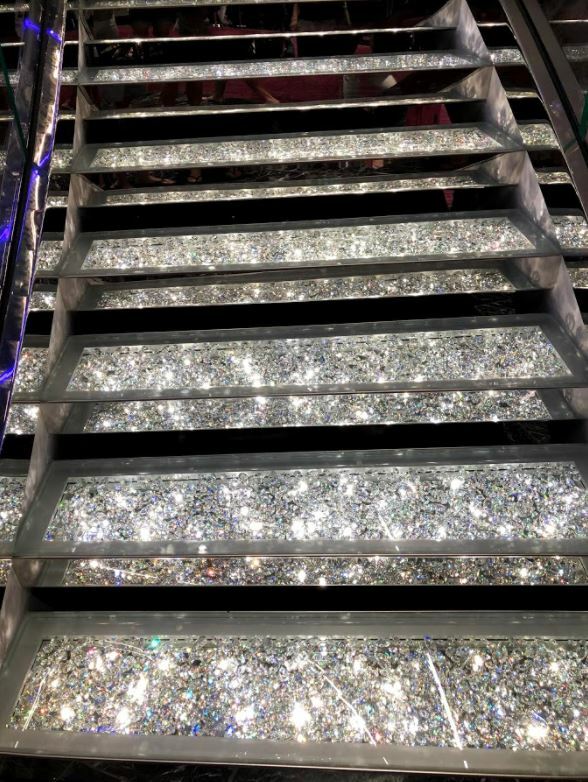 A lot of shiny metals, Swarovski Crystal steps, and more. Everything was clean. The elevator doors were mirrored metal and very rarely did I see finger prints. 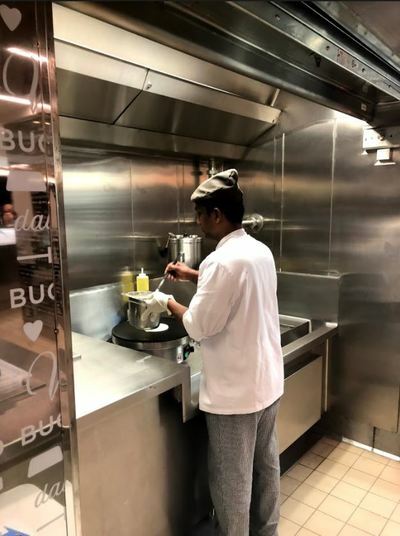 I saw crew members wiping and cleaning 24/7. There were definitely some design and layout issues though. There was a large round stage-like thing next to the Miami Beach pool that essentially blocked the big screen and stage where day time events occurred. 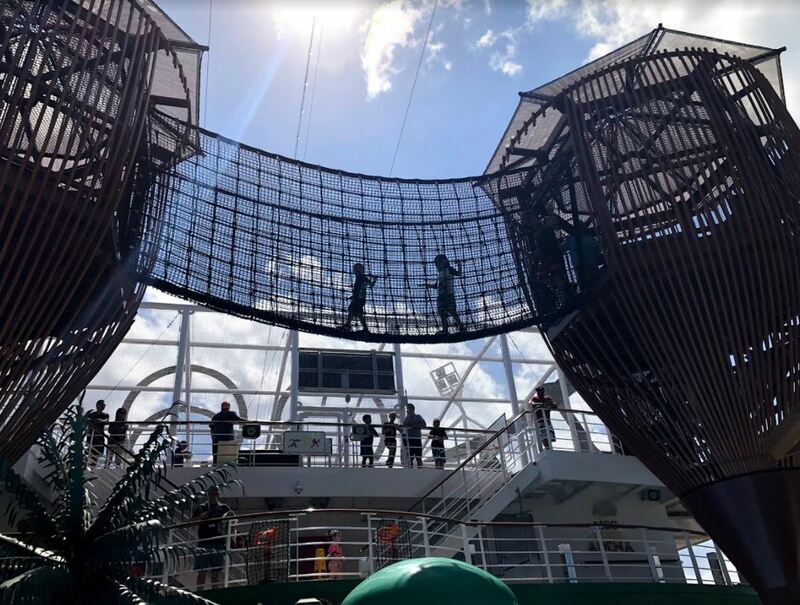 I felt like I had to constantly zig-zag around the ship due to areas not open to the public or that did not allow direct pass throughs. Sometimes I had to go up and over a deck to get to something on the other side. Not a deal breaker, but annoying to say the least. 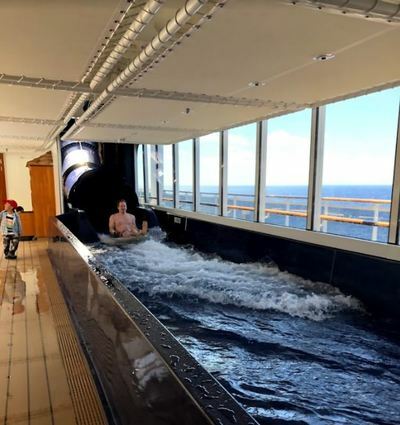 The ship has three "public" pools. South Beach pool was adults only. 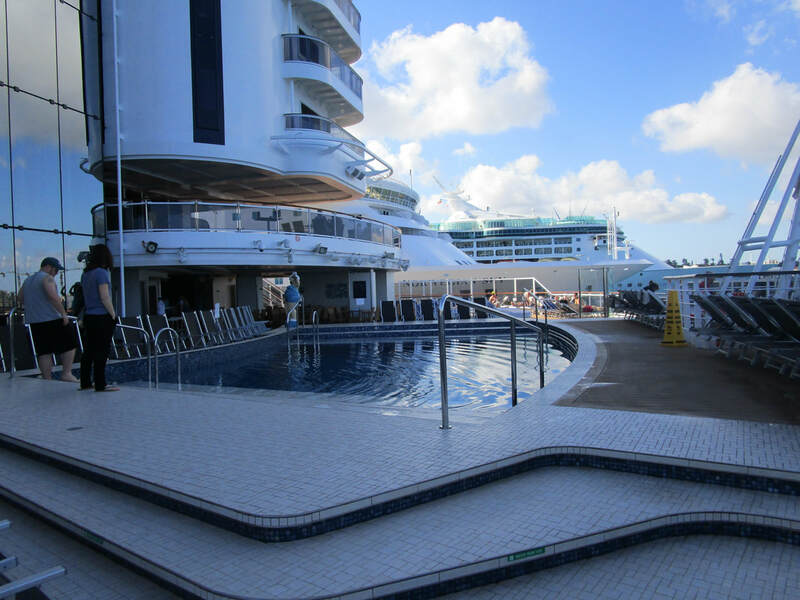 Miami Beach pool was on deck 16 and was the "main" pool. The Jungle Pool was the magrodome/ enclosed pool. Deck chairs filled up quickly as they don't have a rule against chair hogs. So basically everyone woke up at the crack of dawn to reserve chairs. Pools were all very deep, 6 feet. 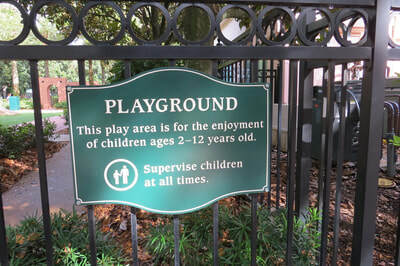 So hard for smaller kids to really enjoy them. 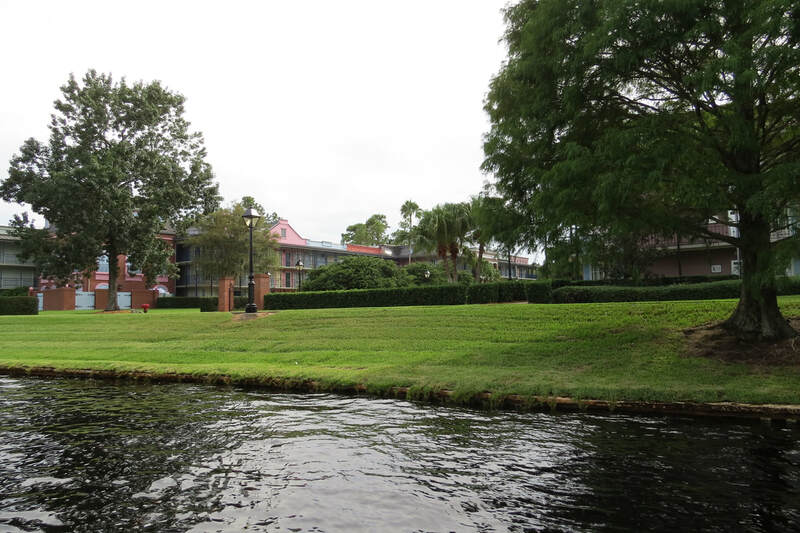 There was also the Yacht Club pool, exclusive to the Yacht Club guests. The Forest Aquaventure Park was great. My older son loved it. Even my husband and I had fun on the features. There are 4 water slides, two mini slides within the splash area, and lots of water canons. It was closed on the final sea day due to water splashing in to the elevators nearby (another design flaw!) 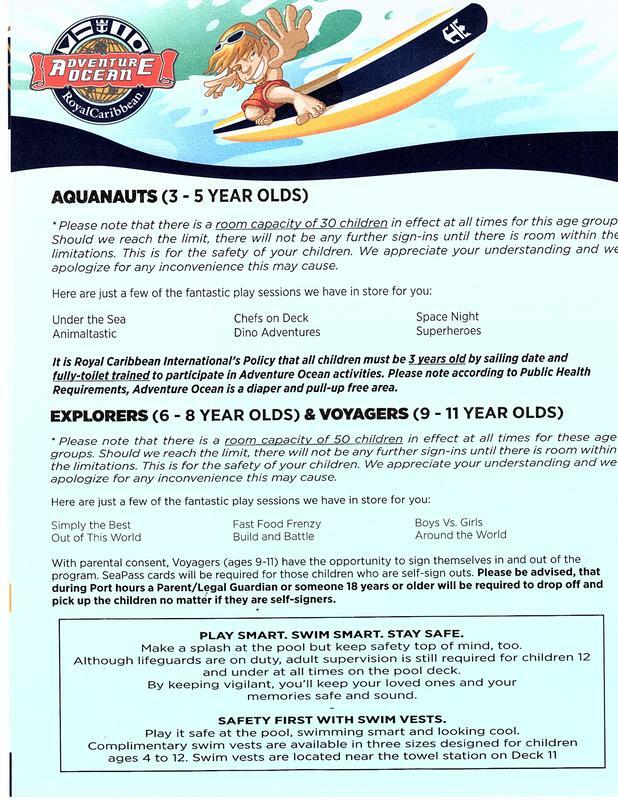 But overall the Aquaventure Park was another win for my family! There was a different show every night. 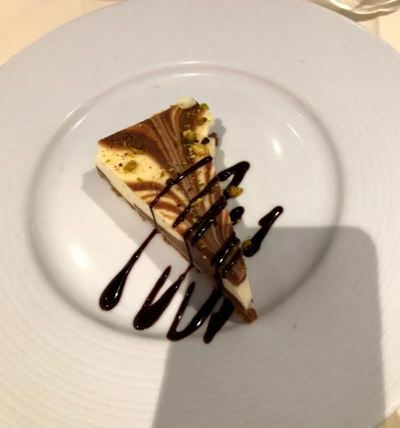 Which was nice. People could pick based on the type of shows that they wanted to see. There were three show times each night. 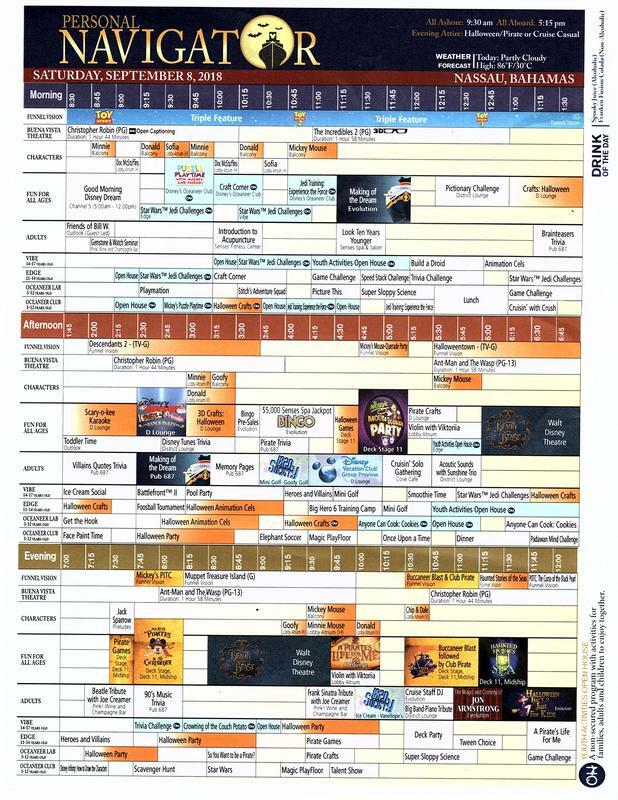 Problem was, the descriptions did not fit the shows whatsoever! We saw two shows, the one on the 2nd night was The Dream. It was exactly like a dream. A lot of random things put together. The talent of the performers was impressive. 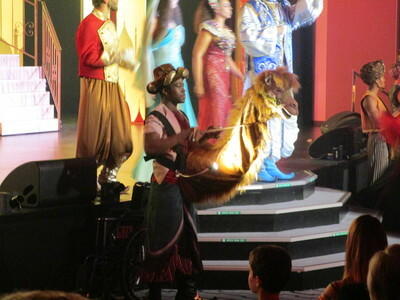 The costumes were interesting at times and the acts ranged from funny, to "what was that", to unique talent. Overall I left entertained from that show. My friend and I were cracking up laughing at a few parts. We also went to My Life in Music. My baby ended up getting sick during the show and we all took that as our cue to leave. It just wasn't our thing and so that was a blessing in disguise. I really wanted to see the Wizard, Perter Punk, and Timeless but never got around to it unfortunately. My son and his friend with the Doremi mascot. This left me disappointed. 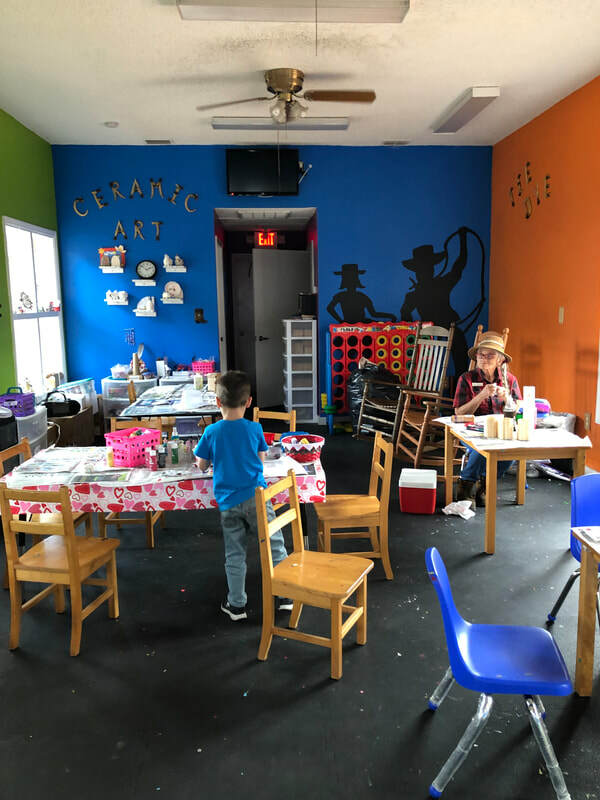 I had high hopes for the kids club. Lego themed, it sounded like a perfect fit for my 5 year old. But sadly it just didn't live up to the hype. 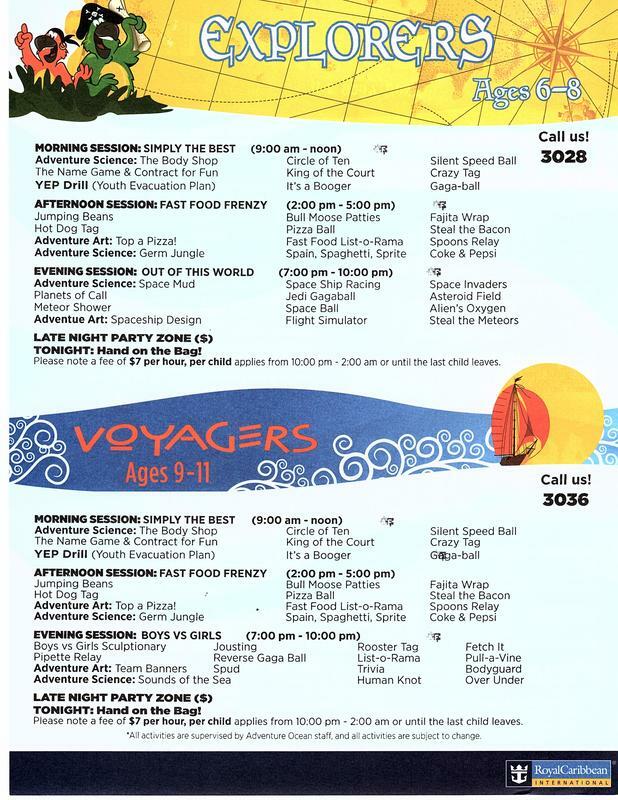 We were given wrong information on day two which turned in to an issue with the kids club staff that night. We also had a few safety/security concerns. 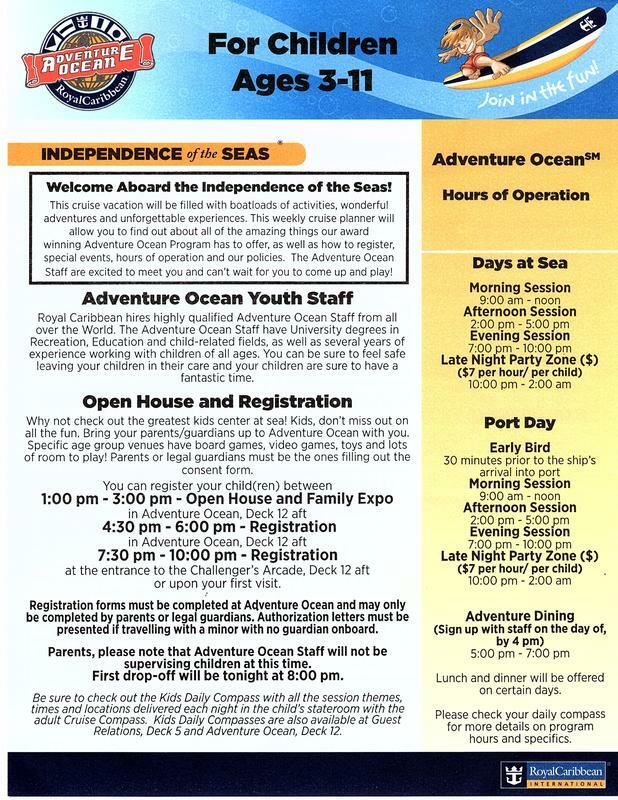 This was one of the first cruises in which I had to beg my son to go (we wanted a few adult-only dinners). 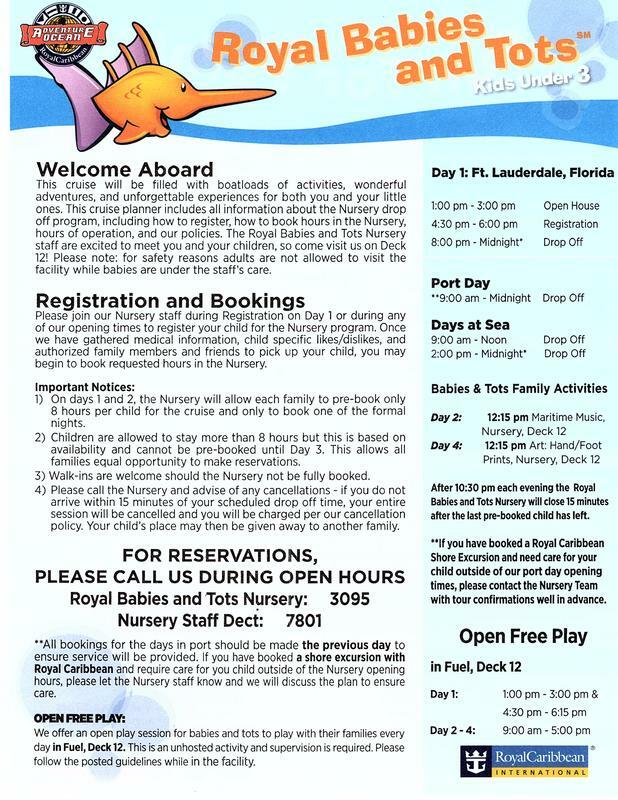 My 1 year old also used the nursery, which was nice, but not quite as good as Disney and Royal Caribbean's nursery program. ​I will go in to more detail in my specific blog post about the kids club later. 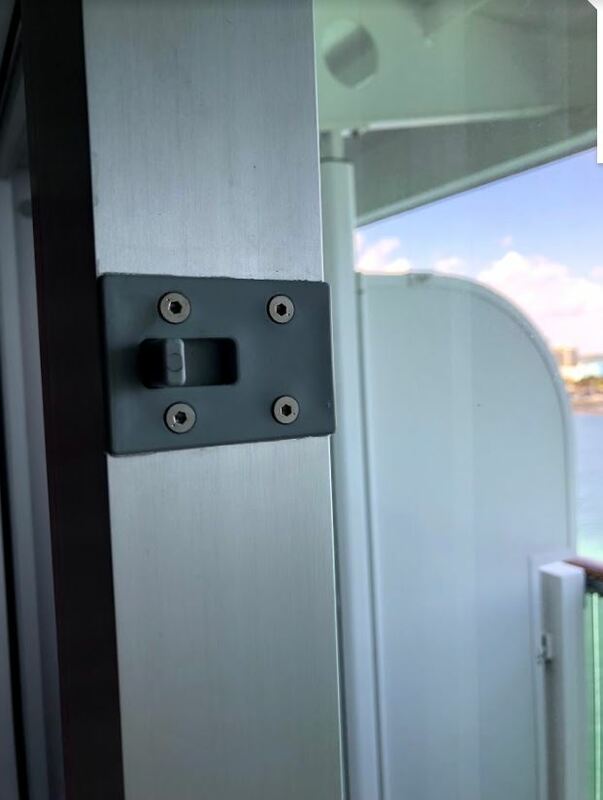 This is where the whole cruise can be made. Service is where it's at. Especially in the U.S. People expect certain things. 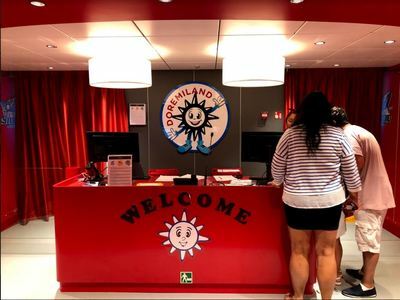 The best way I can describe the service on this ship was 50% friendly, warm, amazing staff/crew. The first night we had an awesome waiter who anticipated our every need. He was amazing, but we never had him again. The guy running the arcade was uber-nice to us. 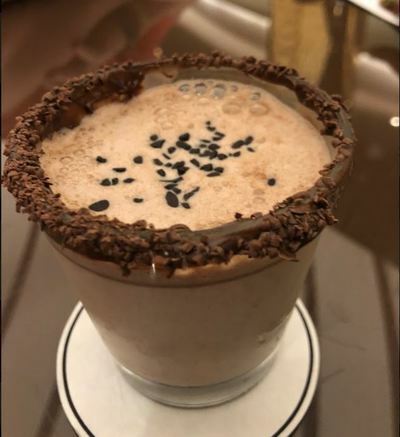 My friend and I ordered two identical coffee-chocolate drinks but specifically asked (multiple times) for one of them to be decaf. 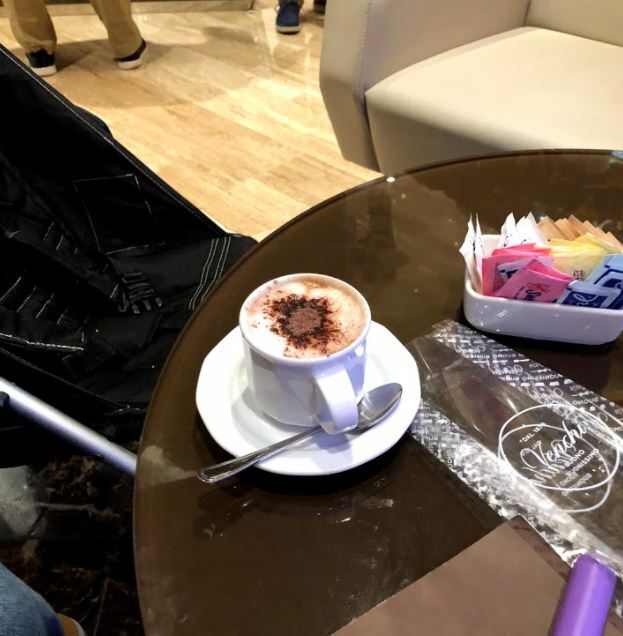 When the order was presented, she asked which is decaf. The manager was the one serving and turned to ask the guy who made them. He said they were both regular. My friend reiterated that she asked for decaf. The manager rolled her eyes and acted as though we were being unreasonable. Another friend also ordered coffee/chocolate drinks and were given drinks without the coffee. It was rather obvious based on the volume and consistency in the cup. The same manager, but this was on a different day, argued with them about it. Finally it was remade and it was the way it should have been initially. I think service is something that can easily be improved upon and I will be sharing my experience with the higher ups in the company to help them provide a better experience to guests onboard. 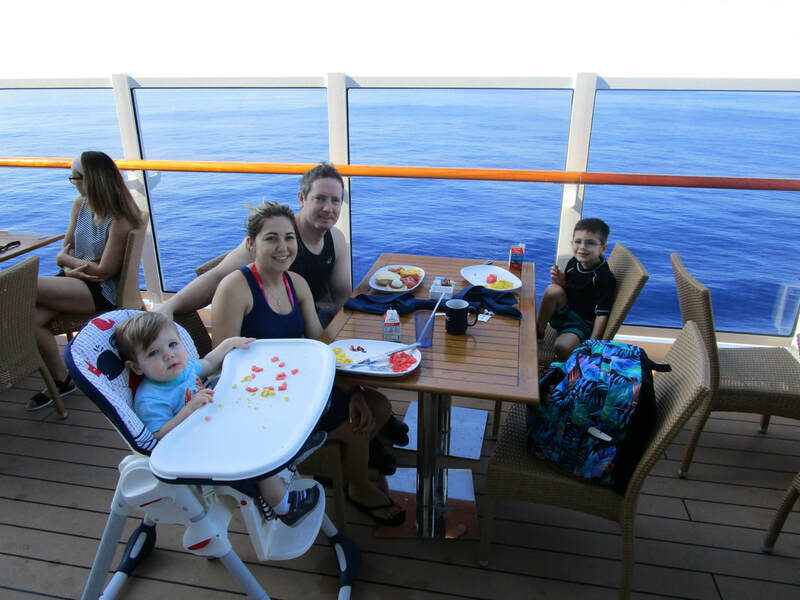 I had 8 other families, booked through me, traveling on the same cruise. So I was concerned that my own people were able to enjoy their trip. 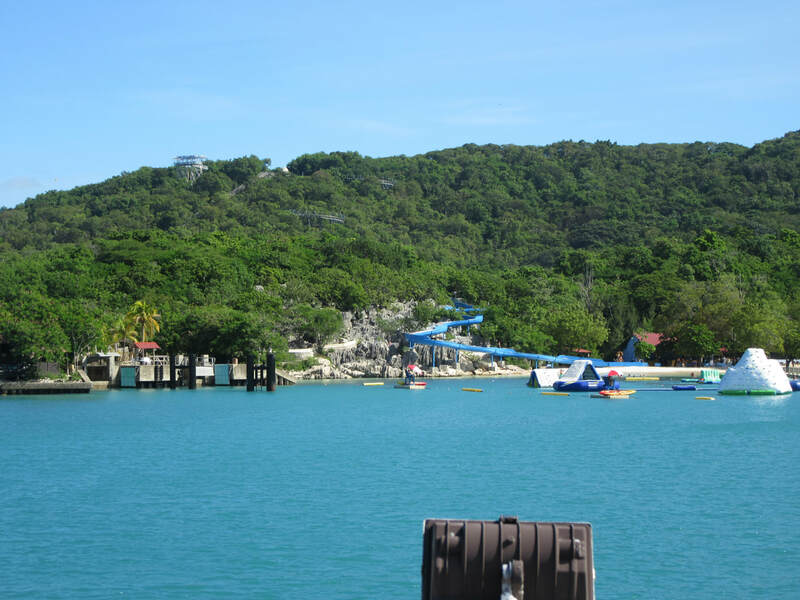 Labadee is a little slice of heaven in the Caribbean! 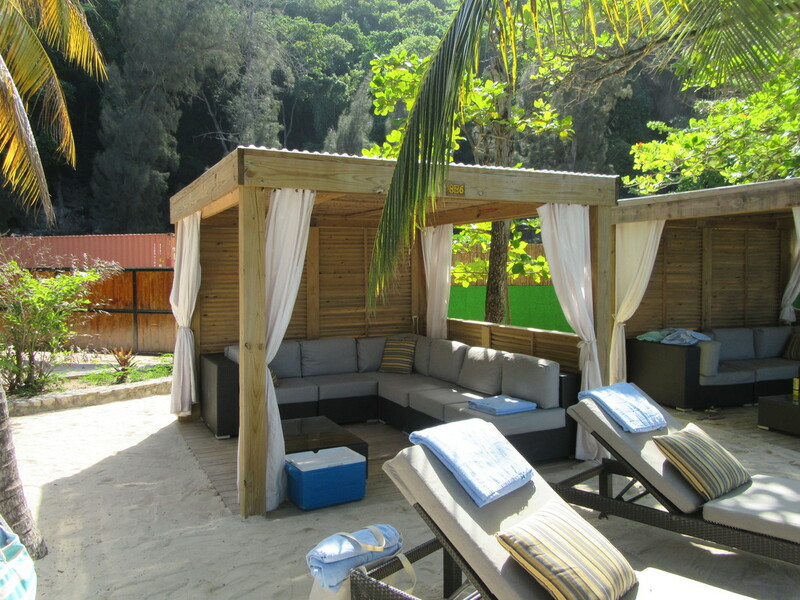 Situated on the northern coast of Haiti, this is not a private island, but a small area of leased land exclusive to guests of Royal Caribbean and Celebrity cruises. This beach paradise has grown over the years. 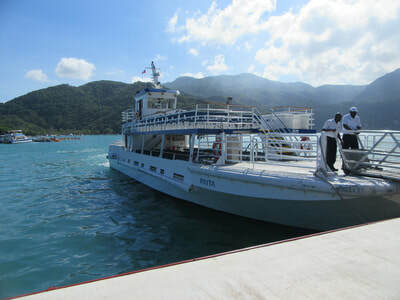 Once a tender port, it is now fully accessible by a pier constructed back in 2009. 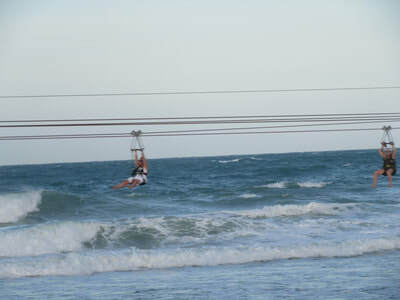 The longest zip-line over water is located here. At 2,600 feet long, it's breathtaking! There is also a roller coaster, water slide, splash park for the kids, water park, and more. This was my 3rd time visiting and we chose to rent a Beach Bungalow for the day. In the past we've just walked around or rode the roller coaster. 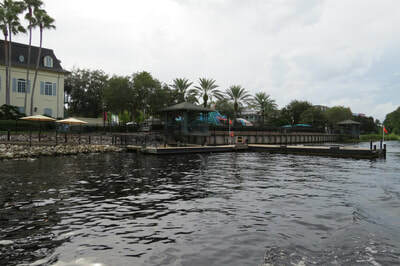 Recently, they've added a boat that takes you from the pier to by the water slide and water park, which cuts down on some walking time. So we gave that a try this time. As for heading back to the ship, we hopped on the tram that runs from right next to the Columbus Beach food area to a 2 minute walk to security checkpoints. When I was looking over the options for Labadee, on the Royal Caribbean site, I came across Beach Bungalows. 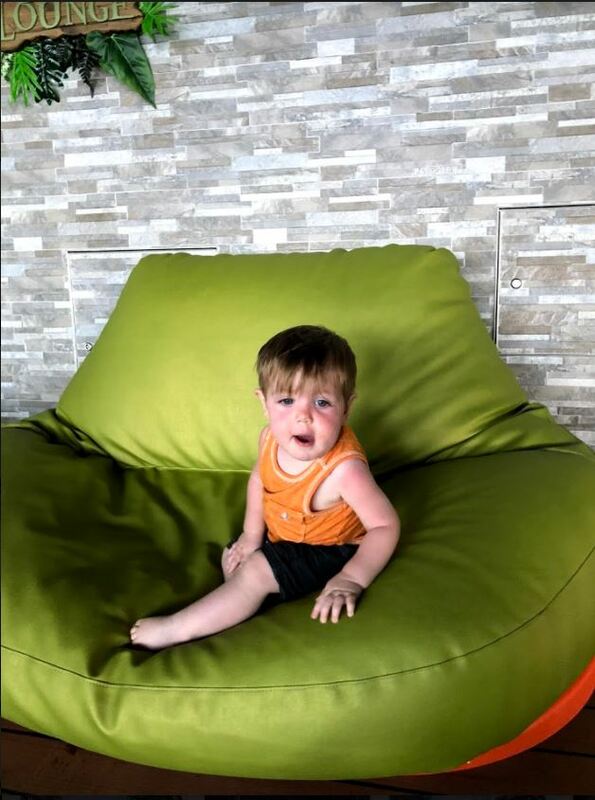 Priced at $200 for the entire day; they include six large Evian bottles of water, two padded loungers, an L-shaped couch, sun protection, wind protection, two beach floats, six towels, and two cabana boys! There are only nine bungalows, and they are located at Columbus Beach, so they sell out quickly. 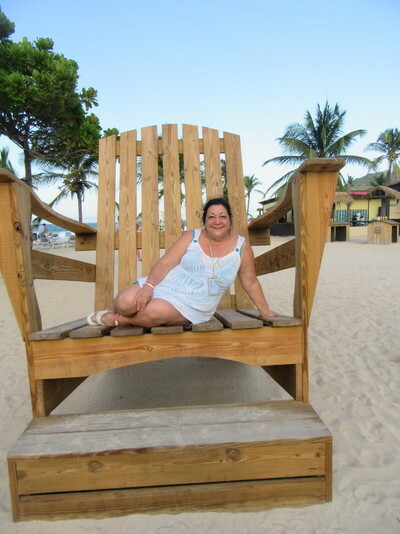 Columbus beach, btw, has very few rocks, so it's one of the best beaches at Labadee. the only drawback is that it's the farthest point from the ship. There were six of us, four adults and two kids. 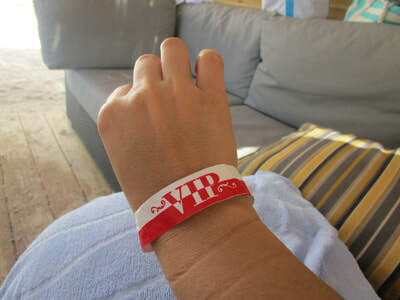 We were given VIP bracelets that allowed the staff to keep track of who belonged there and who didn't. I felt like this bungalow made our day enjoyable and manageable with a baby. We had shade so that no one would get burnt. We had ample fresh, cold, water in a cooler. 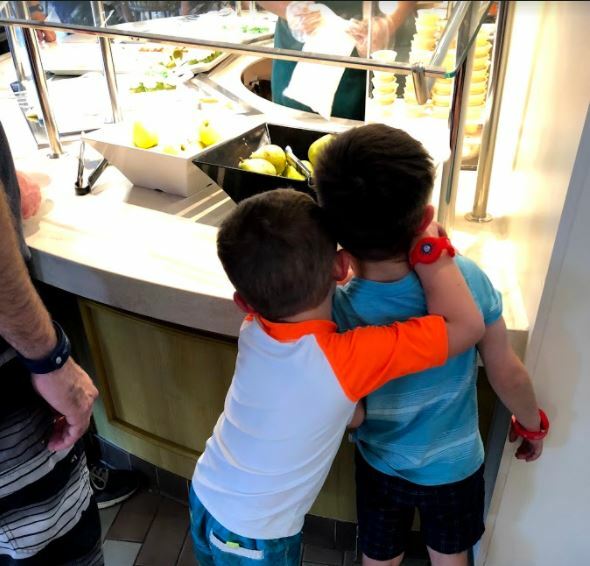 We didn't have to fight for seats at lunch table. We had floats available to use throughout the day. The cabana boys went to the bar for us. If you have a baby or young kids, this is money well spent! 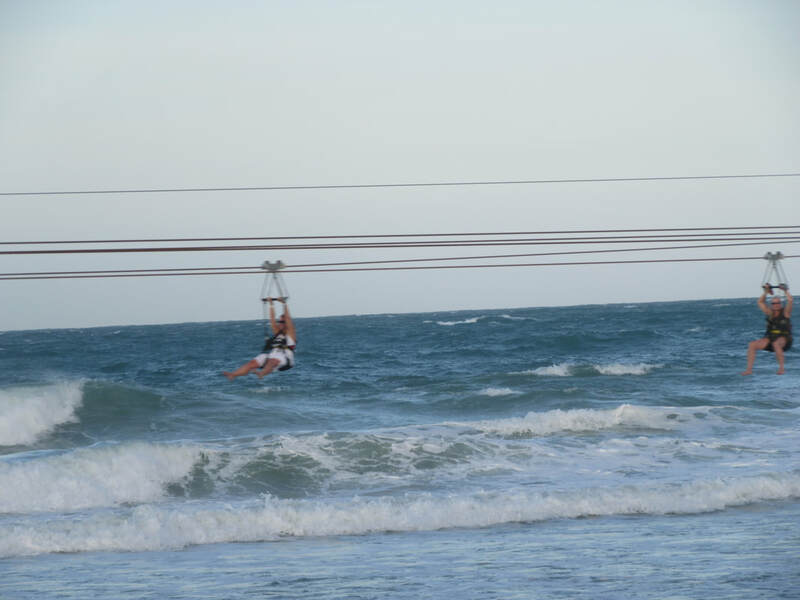 We didn't do everything on this particular trip, but here are some photos of the other options on the island! 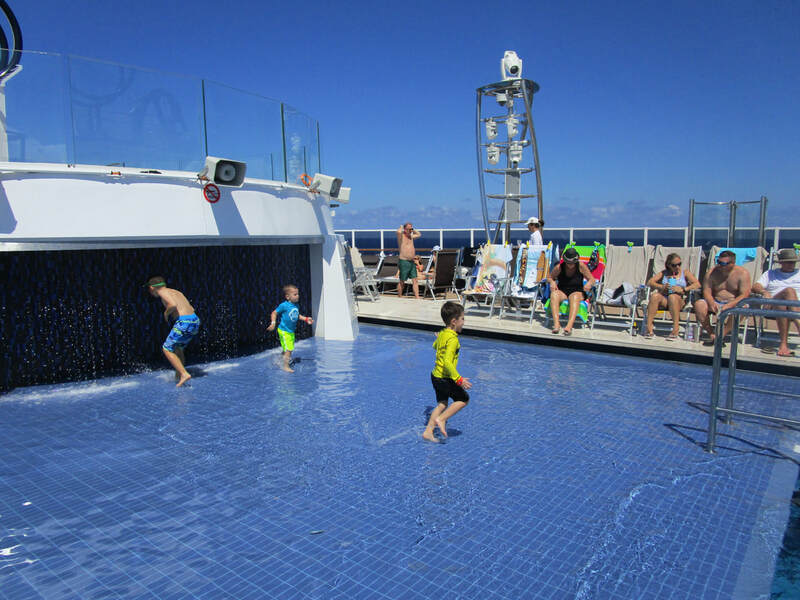 Cruising with Kids- a Packing List! So, this won't be a complete list of things to pack, you'd tune out far too soon if I did that. This is my list of things to bring that not everyone might think of plus some notes on the usual items that families might throw in the bag. 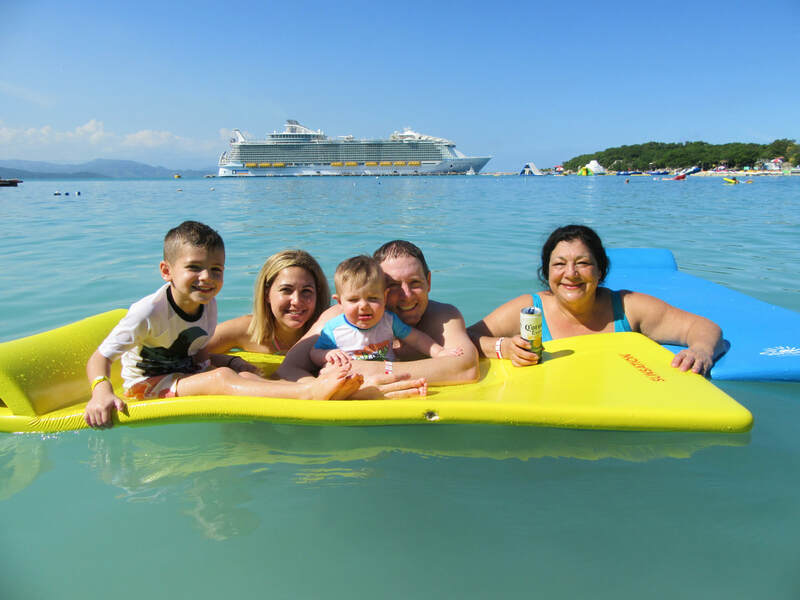 A good umbrella stroller is helpful, especially on larger ships. 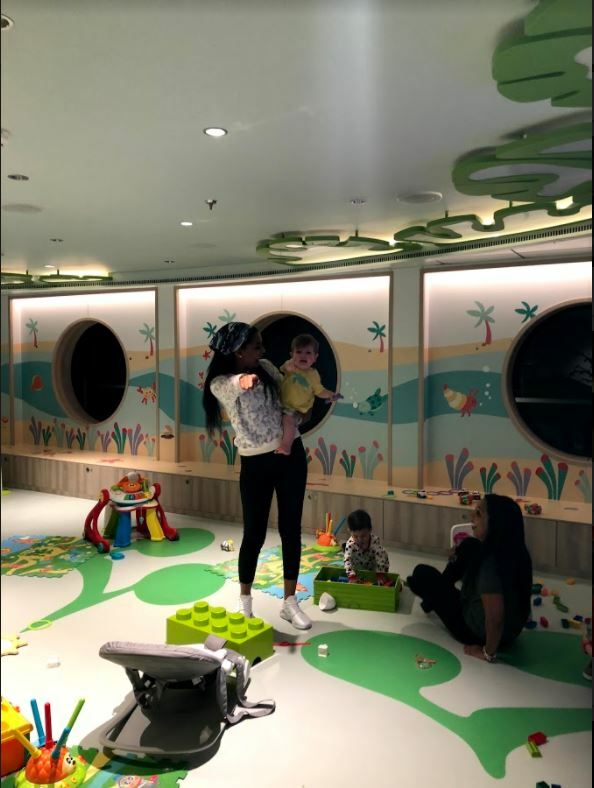 Harmony of the Seas is a big freakin ship, and if I knew we'd be out for a while without a seat in sight, we brought the stroller out from the room. An umbrella stroller is best because it's lightweight, fits through the narrow doorways, and folds up out of sight in the room. 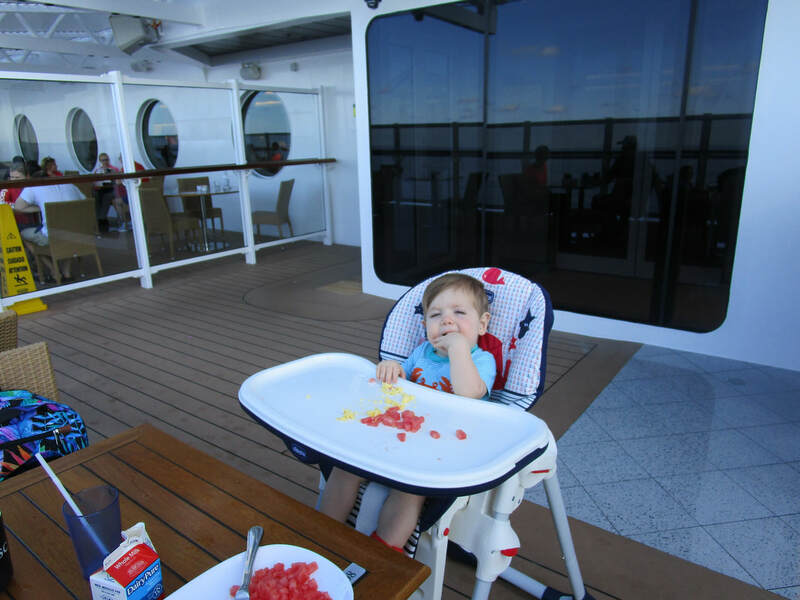 I've relied on a Chicco Liteway (or the Plus version) for most of my cruises. It's my everyday stroller too! We kept it by the door and just moved it out of the way as needed. By the end of the week, my one year old figured out how to push it against the door to grab the handle and looked like he was trying to escape! Why am I telling people to bring a stroller AND baby carrier? I don't always babywear, but when I do.... Oh no, wait- that's a different commercial! There are some situations in which I find it to be useful. Like, when I need two hands or when my almost five-year-old steals the stroller seat! I am a fan of my Baby Tula, but you can use whatever contraption that is most comfortable for your body. It's all about comfort here. Baby wearing is also helpful when you're over the battle of getting into an elevator. I just pop up or down the stairs while wearing the little guy and I get to my destination sans aggravation and with a few minutes to spare. I would evaluate where we were going to determine if I should wear him or push him! 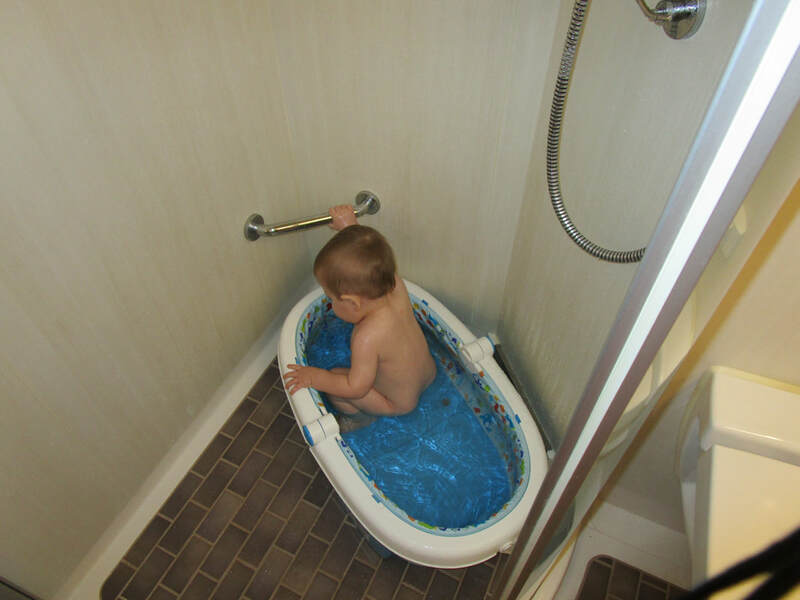 This Summer Infant collapsible tub fits nicely in the shower and there is no inflating necessary! If you plan to have a crib or pack n play in the room, I recommend bringing a sheet from home. The smells and sights of familiarity will help shorten the adjustment to sleeping in a different space. 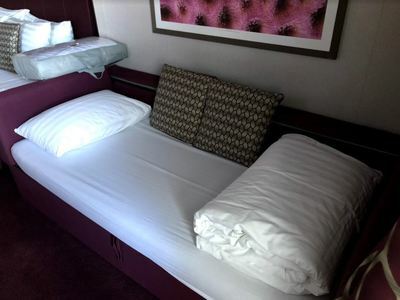 All cruise lines will provide sheets for the crib, but they aren't crib sheets, they are regular sheets just tucked under the "mattress". 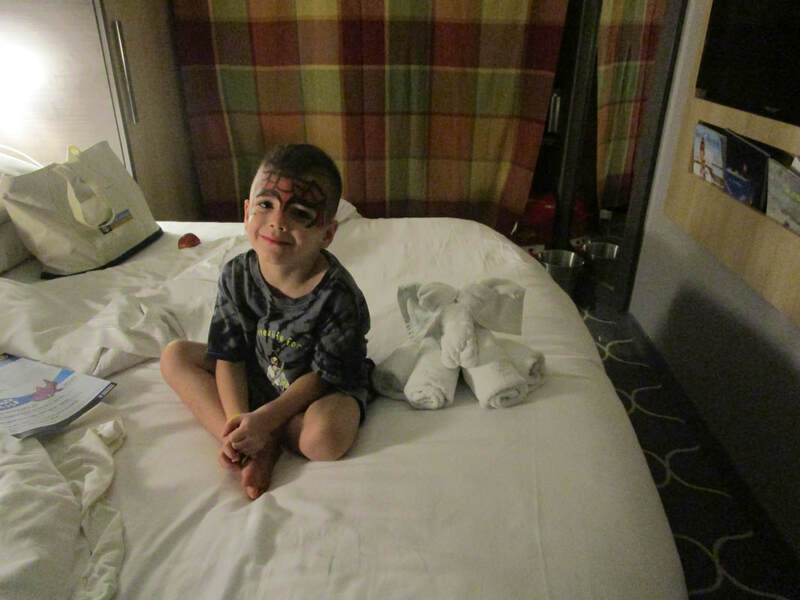 On the last night of our most recent cruise, the baby was tangled in the sheets because they weren't fitted. I had thrown our crib sheet in my luggage that final night thinking the regular sheets would be okay. I woke up at 2 am to a crying ghost! Yeah, he was THAT tangled. Poor kid! 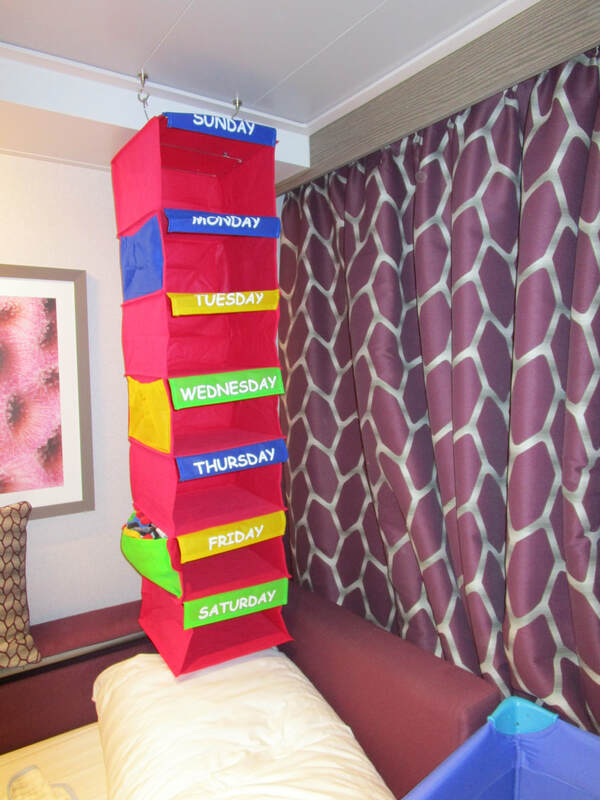 Some cruise lines have cribs (Carnival), and others have the pack n play style (Royal). I ended up bringing a regular crib sheet even though I knew we'd have a pack n play in the room. As long as it's small enough and fitted, you can avoid the tangle! If you've never read my blogs before... You are probably thinking, "huh?" Yes, I said to bring a shower curtain and some magnetic hooks. The ceiling is magnetic, and you can create a little barrier once your little one goes down to sleep. You can then watch TV, go out on the balcony (if you have one), and do more without completely disturbing your sleeping angel! I've been doing it since my oldest was one and it's worked perfectly! The rust & green colored curtain behind my older son in these photos has been on TEN cruises... So we've had plenty of use out of it, and it's worked like a charm each time. I recommend a dark color and thick fabric to help block light. If you're breastfeeding, you can skip this part because you are your own portable milk maker! Yay! However, if your child is on formula, I recommend taking the Ready to Feed (already mixed) type in the bottles closest to your baby's serving size. We brought 8-ounce bottles (yeah, 24 of those bottles) in a small carry on suitcase that my older son pulled for us. It seemed like a pain to bring an entire extra bag but having pre-mixed formula to pour into a bottle or cup was convenient. I didn't have to worry about finding drinkable water; I always had a perfect bottle at the ready. Not to mention, at the end of the week we had an empty piece of luggage where we could throw all the stuff we picked up along the way!